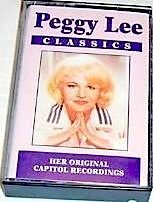 This page focuses on Peggy Lee anthologies which meet the following criteria: (a) they contain primarily Capitol masters and (b) they qualify as either official or licensed releases. The page is organized chronologically by the anthologies' year of release. The only exceptions to the chronological arrangement are the two preliminary sections to be found immediately below: a list of recommended anthologies (I) and a list of anthologies already discussed on the main Capitol album page (II). For further explanations, consult the bottom of the present page. 2. 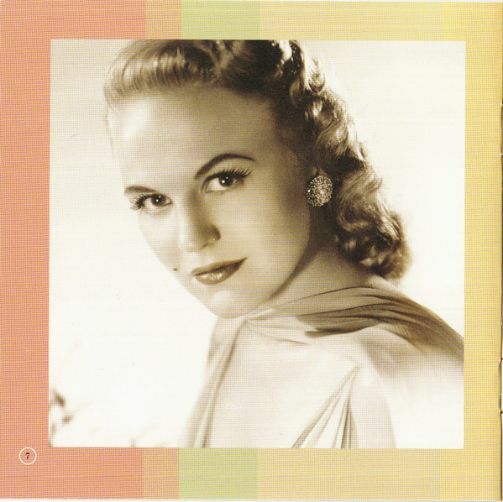 Title: The Lost '40's & '50's Capitol Masters / Format: MP3 & CD / Label: Collectors' Choice / Cat. Num. : Ccm 917 2 [CD] / Rel. 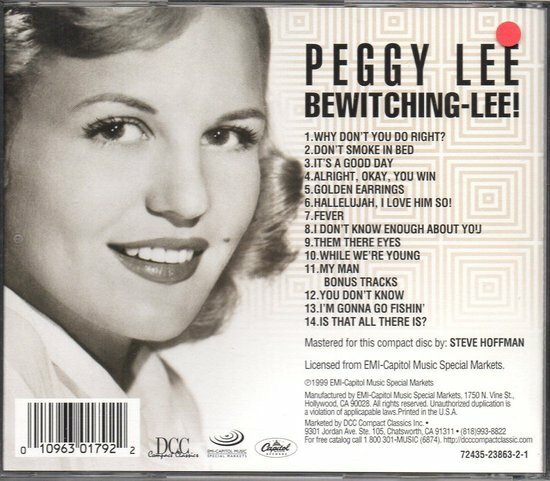 Year: 2008 / Discs: 2 / Tracks: 39 / Note: Another collector's dream, this anthology contains the Lee 1945-1952 Capitol recordings which (a) had not been included in item #1 and which (b) still remained unreleased, back in 2008. 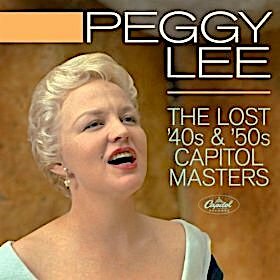 The Lost '40's & '50's Capitol Masters also boasts various previously unissued masters and alternate takes. 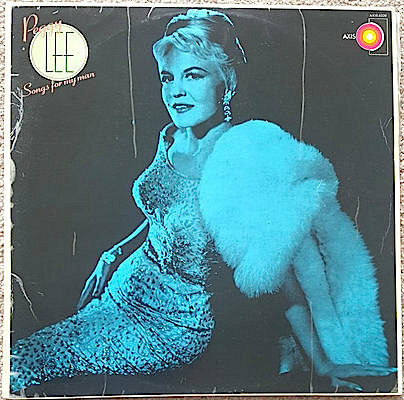 The project was masterminded by producer Jim Pierson, to whom Peggy Lee completists owe a lot of gratitude, due to the substantial number of noteworthy Peggy Lee CD projects that he has spearheaded. Also, for this particular project, fans were also fortunate to count with the keen support of Gordon Anderson when he was still senior vice president and general manager at Collectors' Choice Music. Compilation producer: Jim Pierson. Executive producer: Gordon Anderson. Mastering: Dave McEowen. Audio restoration: Blue Wave. Liner notes: David Torresen. 4. 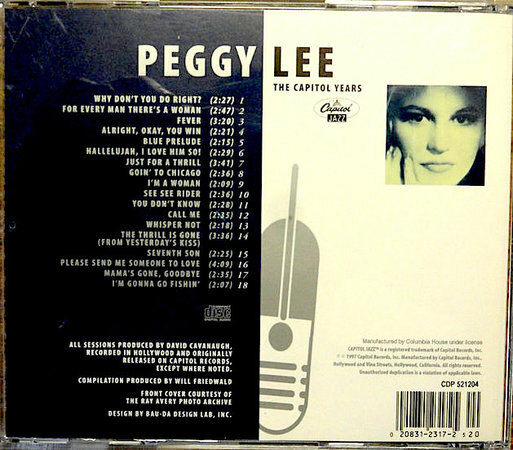 Title: The Best Of Peggy Lee; The Capitol Years ("Blues & Jazz Sessions" Series) / Format: CD / Label: Capitol Jazz / Cat. Num. : 7243 8 21204 2 1 / Rel. 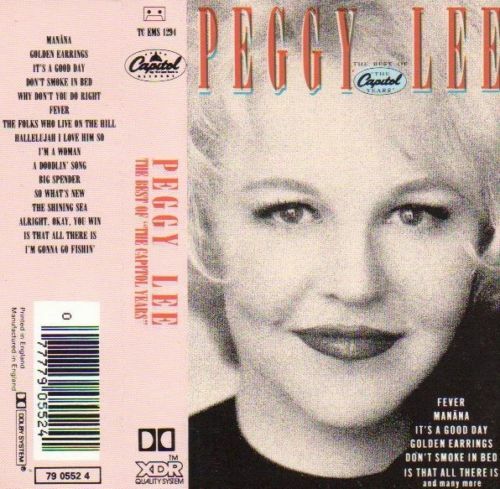 Year: 1997 / Tracks: 18 / Note: This collection stands out for its track selection, which emphasizes not only Peggy Lee's inclination toward blues-based material but also her blues-oriented approach to songs which are not typically associated with that genre. Selections include "See See Rider," "Why Don't You Do Right," "You Don't Know," "Just For A Thrill," "The Thrill Is Gone" (the B.B. King hit, not the standard), "Whisper Not," and "Blue Prelude." The sound quality is fine. The booklet contains a strong, interesting text, marred only by a few factual and discographical mistakes. Produced by Will Friedwald. Liner notes by Will Friedwald. 5. 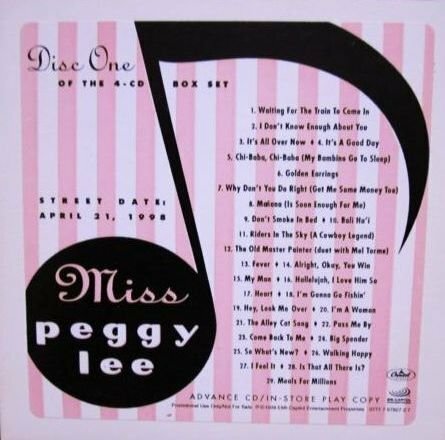 Title: Miss Peggy Lee / Format: CD / Label: Capitol / Cat. Num. : 0777 7 97826 2 8 (97827-97830) / Rel. Year: 1998 / Discs: 4 / Tracks: 113 / Note: I can only give a partial recommendation to this uneven 4CD anthology. I'll begin with its more commendable features, leaving the negative criticism for last. The number of tracks per disc is commendably high (over 25). Included are quite a few masters which had never been issued before their inclusion in this project. 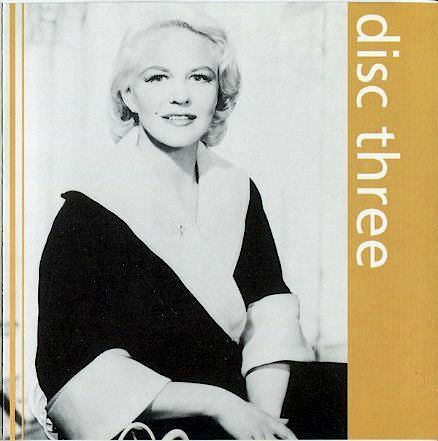 Very good sound quality is heard in the second disc, featuring tracks from the 1940s. Sonically, the first disc also comes off alright, but the same cannot be said of the set's third and fourth discs. The tracks in those discs (all of them from Lee's 1957-1972 Capitol tenure) lack, to my ears, the warmth and vibrancy that enriches collections such as #6 below. The flaws herein stem from choices made during the process of remastering and remixing these discs. Also a mixed bag is the 76-page booklet. 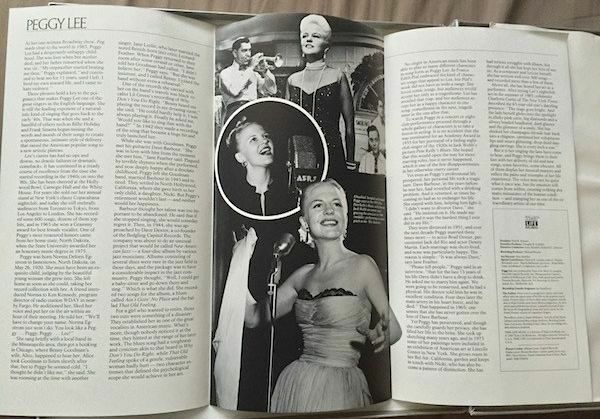 It boasts many photos (all of them b&w) and an engaging if brief track-by-track annotation by Jim Pierson. 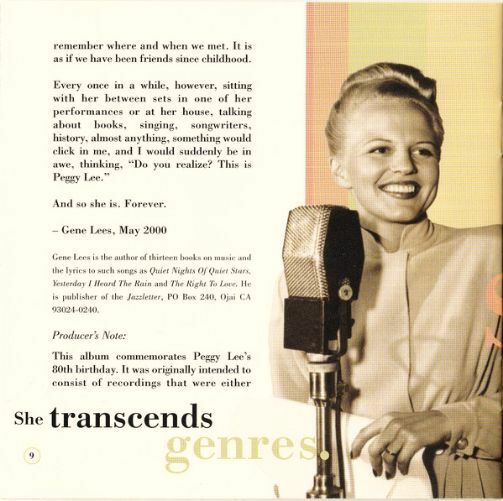 On the minus side, the booklet's long essay by Gene Lees consists mostly of recycled material from his previous writings -- to such an extent that portions of it are dedicated to songs not found in the anthology. Taking into consideration that word of mouth and promotional materials originally hailed this set as a definitive deluxe collection, the overall results are far from stellar and certainly mixed -- especially when it comes to its remastering and remixing. Executive producer: Wayne Watkins. Produced and compiled by Brad Benedict. Production assistance: Karen Myer and Wendy Brueder. Executive producer: Wayne Watkins. Remixed and digitally remastered by Bob Norberg. 6. 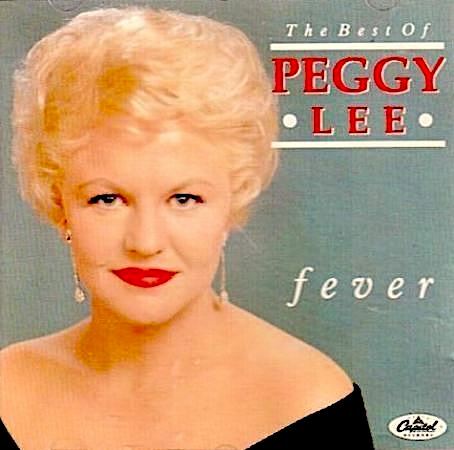 Title: Fever; The Best Of Peggy Lee / Format: CS & CD / Label: EMI / Cat. Num. : (United Kingdom) CdFever 1; also 72437 80361 2 8 / Rel. 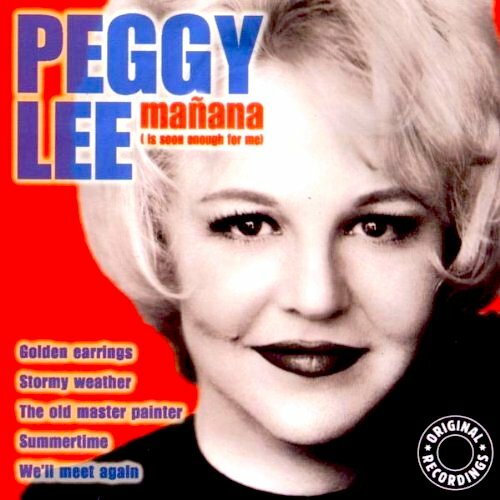 Year: 1992 / Tracks: 24 / Note: This excellent-sounding anthology includes a fair number of uplifting and even teasing Peggy Lee interpretations which professional compilers have generally passed over, in favor of the same tried-and-true hit numbers. Among the former: "I'm Just Wild About Harry," "Hey, Look Me Over," "It Could Happen To You," "Sneakin' Up On You," and "Come Dance With Me." 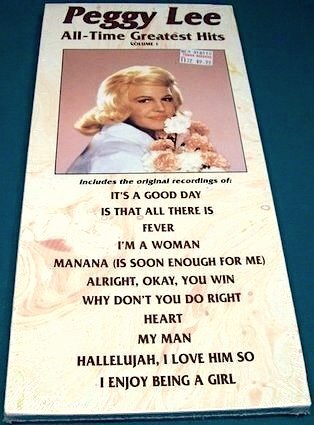 Those numbers are well integrated in a track listing that also makes room for a few of the aforementioned hits ("It's A Good Day," "Pass Me By," et cetera) and for some intimate, warm balladry ("Fly Me To The Moon," "The Folks Who Live On The Hill," et cetera). Compiled and produced by Alan Dell. 7. 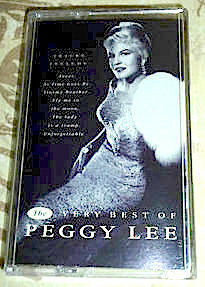 Title: The Very Best Of Peggy Lee / Format: CD / Label: EMI / Cat. Num. : (United Kingdom) 7243 5 27818 2 9 / Rel. 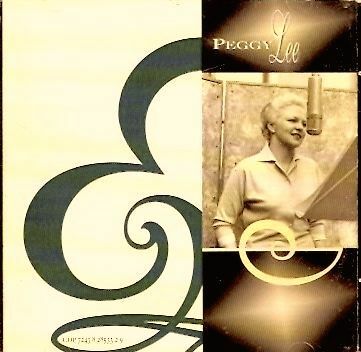 Year: 2000 / Tracks: 24 / Note: This may well be the most satisfactory single-disc Peggy Lee anthology ever made, with competition coming only from items #6, #4 and #3 above. Its sound quality is above average. (It should not be confused with a mediocre-quality CD that features the same photo on its front cover, and which is titled Greatest Hits. 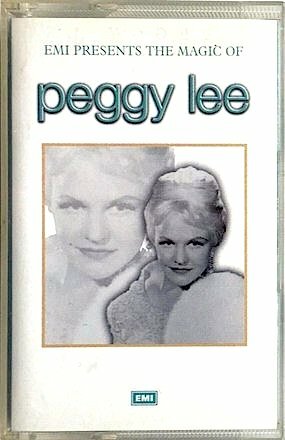 To my horror, the online store Amazon picks this questionable, low-fidelity, Public Domain CD as its "choice" for a Peggy Lee CD.) 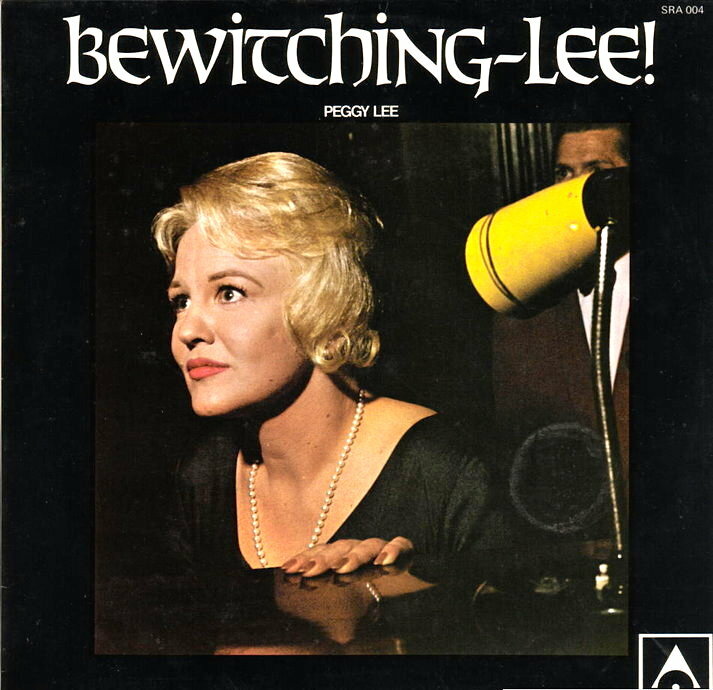 The time span covered by EMI's The Very Best Of Peggy Lee is suitably wide: 1947-1970. 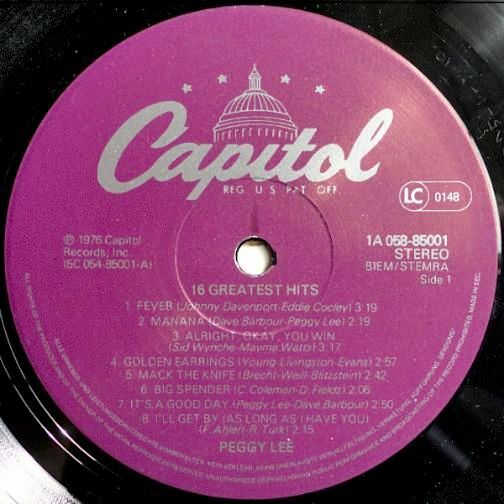 There are even three non-Capitol tracks, one of them being Lee's celebrated rendition of "Black Coffee." The other two are the correct soundtrack versions of "He's A Tramp" and "The Siamese Cat Song" ("correct" as opposed to the also very good but in reality non-soundtrack versions heard in many non-Disney issues). 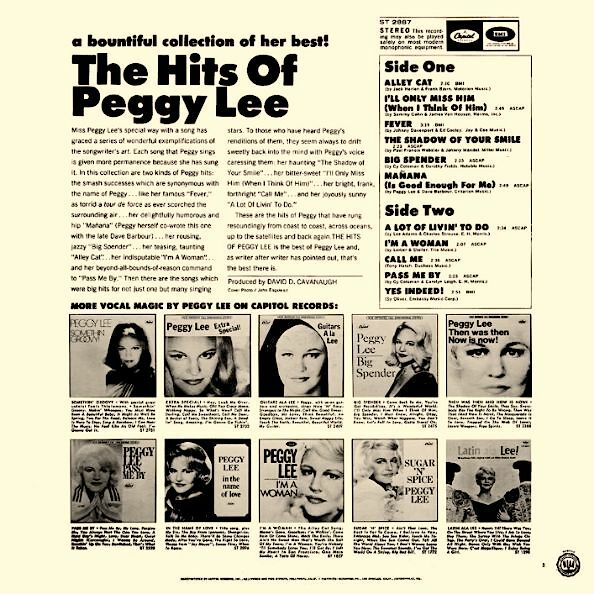 Among the other 21 tracks are all the major Capitol hits and the often-praised numbers ("Fever," "The Folks Who Live On The Hill," "Why Don't You Do Right"," "I'm A Woman," "Big Spender," "Till There Was You," etc. ), with the exception of "Is That Al There Is?" Lesser known picks, curiosities, and worthy selections include "Bali Ha'i," "You'll Remember Me," Things Are Swingin'," "I Enjoy Being A Girl," and "I Feel It." Remastered and remixed by Ron McMaster. 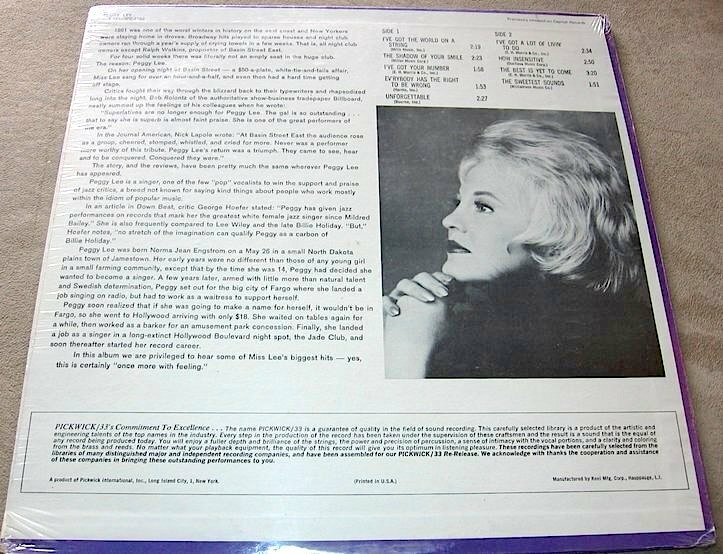 Liner notes by Mike McNally, who might have also been the unidentified producer. 8. 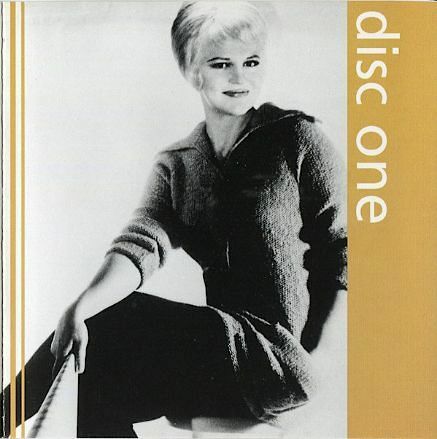 Title: The Early Years (Collectors Series, Volume 1) / Format: CS & CD / Label: Capitol / Cat. Num. : C4 5 93195 & Cdp 7 93195 / Rel. 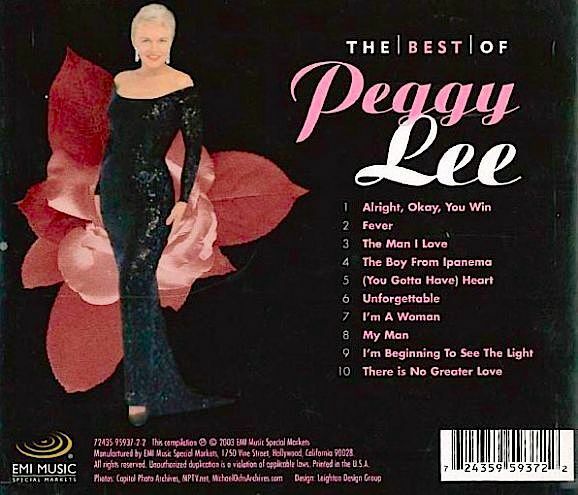 Year: 1990 / Tracks: 27 / Note: Widely favored among listeners, this tasteful collection of early Peggy Lee hits was mastered mostly from the original lacquer master session discs (the exceptions being two tracks which had to be sourced from full track mono master session tapes instead). As additional treats, the track listing contains two charming bits of studio chatter. Produced and researched by Ron Furmanek, to whom much of the project's technical and overall success is probably owed. Digitally remastered by Bob Norberg. Liner notes by Robin Callot. 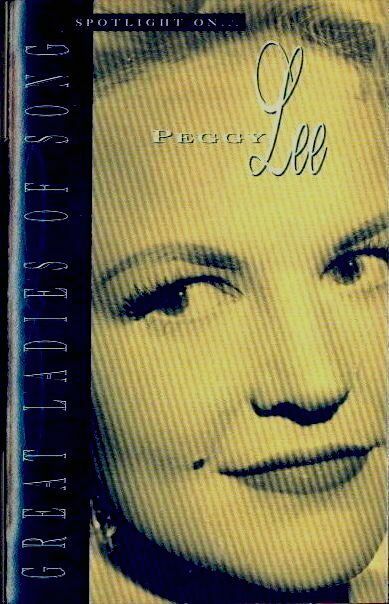 The prospective second Peggy Lee volume in this series was actually released in 2000 -- although it was not identified as a sequel -- under the title Rare Gems And Hidden Treasures. 9. 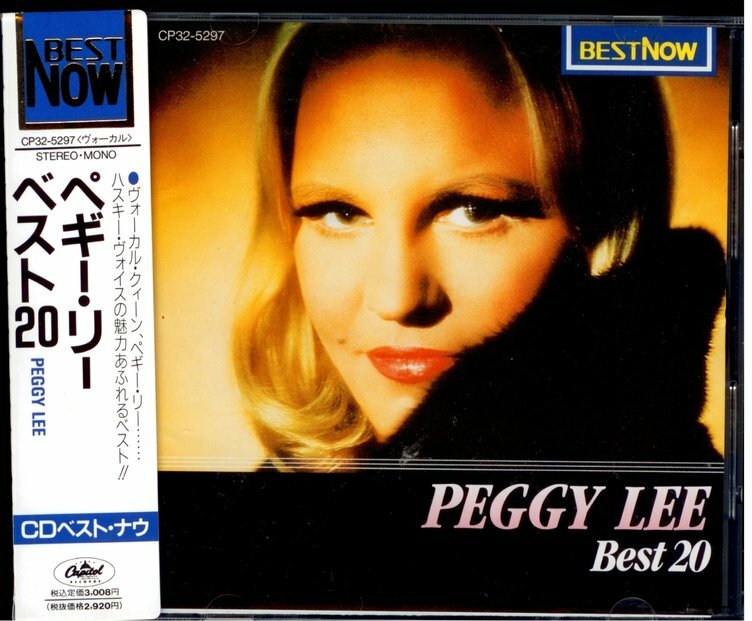 Title: The Best Of Peggy Lee / Format: CD / Label: EMI Special Markets / Cat. Num. : 95937 / Rel. Year: 1995 / Tracks: 10 / Note: Lacking liner notes and amounting to just 10 songs, this budget compilation would seem to have very little going for it. 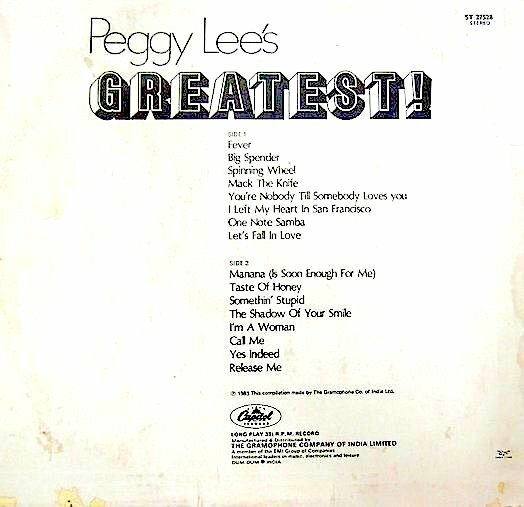 Upon listening, however, it provides the unexpected pleasure of fine sound quality and a track listing that combines hits such as "Fever" and "Alright, Okay, You Win" with various superior Lee interpretations that have generally gone unnoticed, such as "I'm Beginning To See The Light" and "The Man I Love." 1-5. 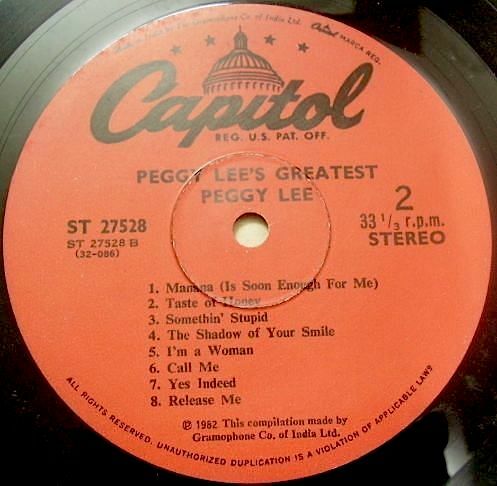 The above-shown issues were discussed in the page that this discography dedicates to Lee's main Capitol albums, and which was prepared long before the present page. These issues were placed in that page because (a) they were not overtly marketed as compilations at the time of their release and because (b) most of them included a significant number of tracks that were either previously unissued or brand new to vinyl at the time. Here is a quick rundown of each LP's contents. 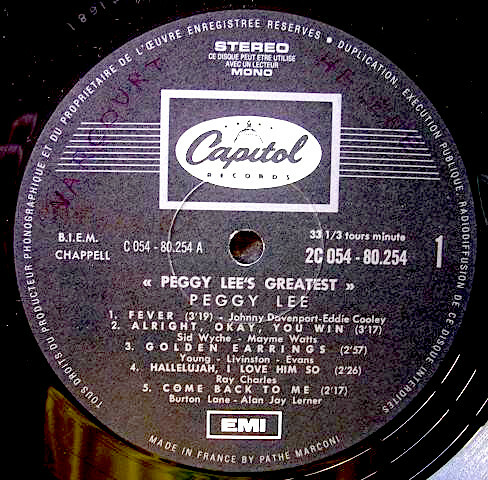 The 1950 album My Best To You contains numbers that Lee recorded in 1946 and 1947. 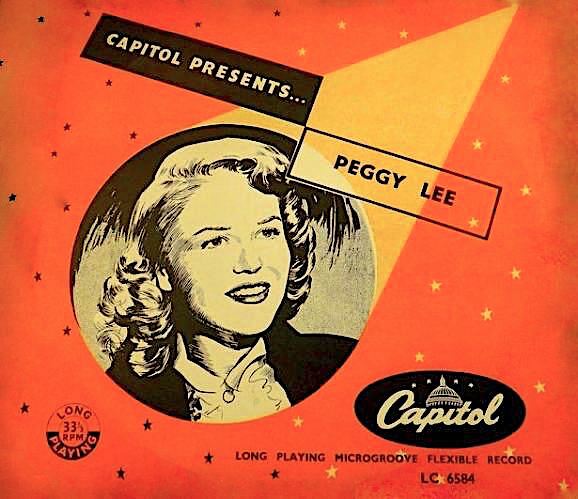 For the 1953 10" LP Capitol Presents ... Peggy Lee (herein represented by the cover of a different album -- due to my missing of the actual artwork -- that happens to use the same artwork), an in-house producer in the United Kingdom culled tracks from Lee's 1947-1950 Capitol period. 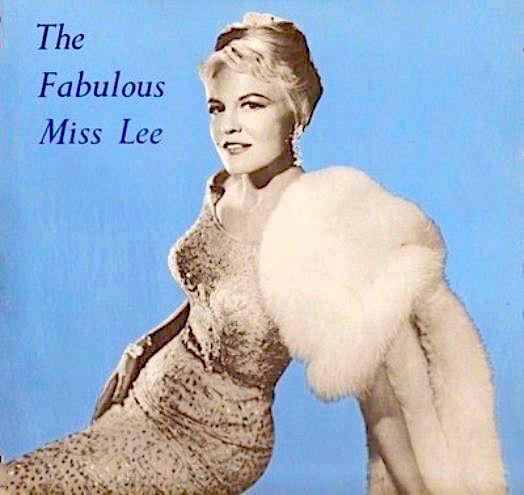 The 1963 World Record Club 12" LP The Fabulous Miss Lee was actually a reissue of Capitol Presents ... Peggy Lee, with a couple of its 4 additional tracks dating back to 1946. The 1960 USA Capitol album All Aglow Again! 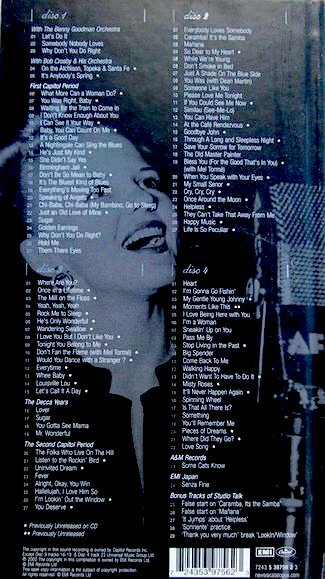 mixed tracks from 1947, 1952, 1957, 1958, and 1959 -- most of them originally released as singles, some others being previously unreleased tracks. Finally, Extra Special! 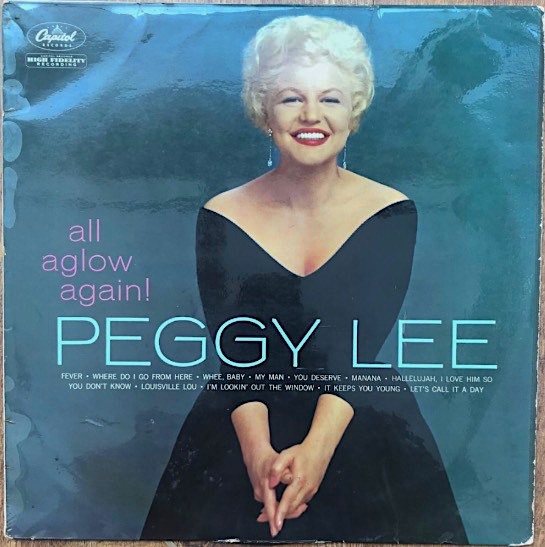 could be perceived as a sequel to All Aglow Again!, because it combines rare tracks with singles recorded between 1960 and 1966. 1. 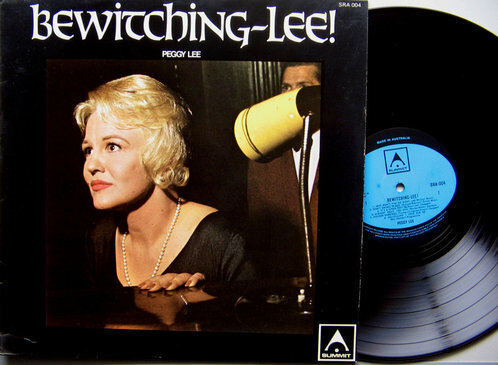 Title: Bewitching-Lee! (Star★Line Series) / Format: LP / Label: Capitol / Cat. Num. : (D)T 1743 / Rel. 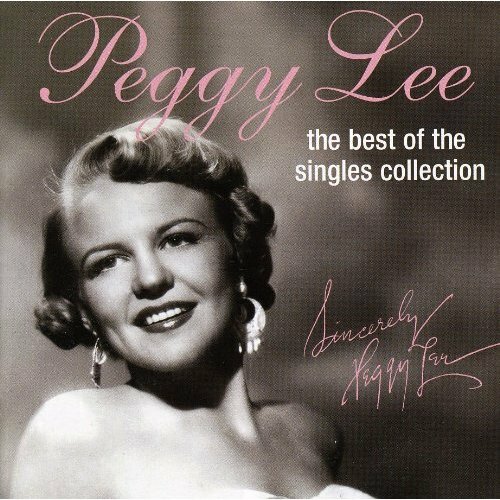 Year: 1962 / Tracks: 12 / Note: Of the dozen tracks in this compilation, two thirds consist of numbers recorded during the 1945-1947 period. The other four tracks date from 1958 and 1959. Shown here is the US edition. 2. 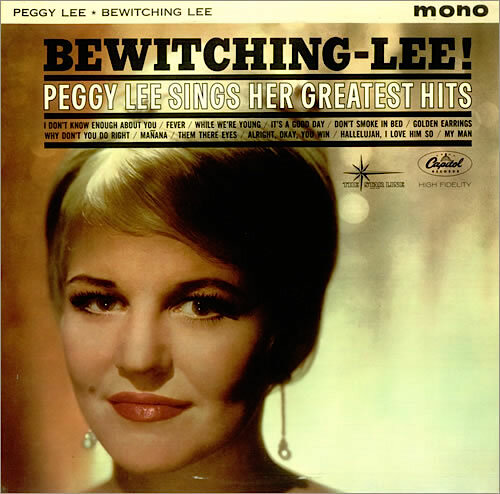 Title: Bewitching-Lee! / Format: LP / Label: Capitol / Cat. num. : 2LP 208 / Rel. Year: unknown / Tracks: 12 / Note: One of at least two Japanese vinyl editions of this album. 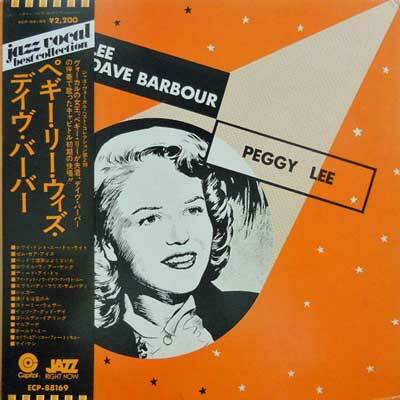 As customary in the case of vintage Japanese LPs, the vinyl is red. 3. 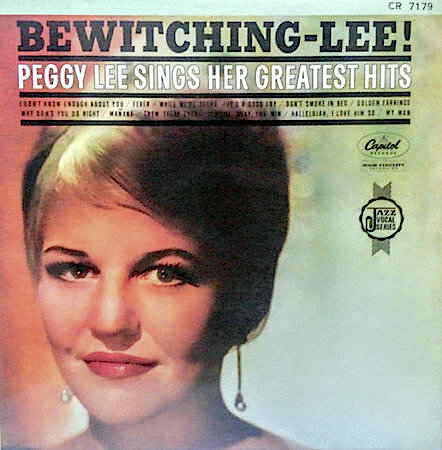 Title: Bewitching-Lee! 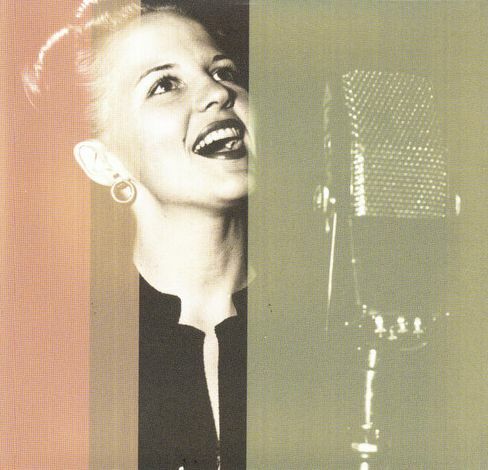 ("Jazz Vocal" Series) / Format: LP / Label: Capitol / Cat. num. : Cr 7179 / Rel. 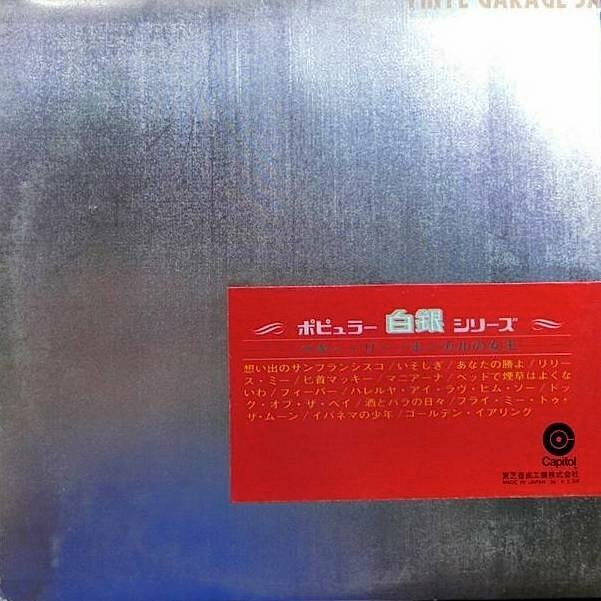 Year: unknown / Tracks: 12 / Note: One of at least two Japanese vinyl editions of this album. 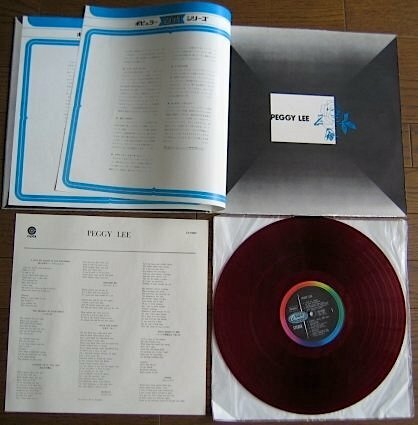 As customary in the case of vintage Japanese LPs, the vinyl is red. 4. 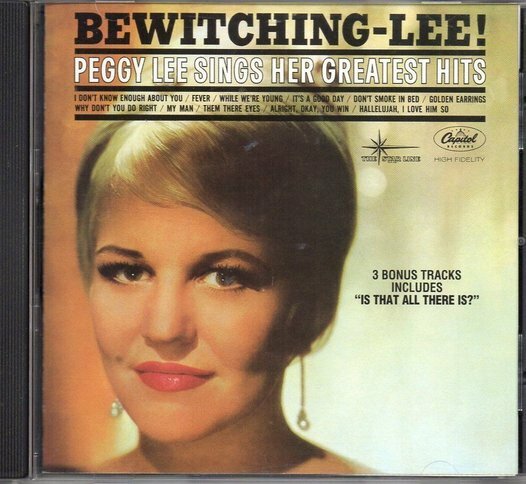 Title: Bewitching-Lee! (Star★Line Series) / Format: LP / Label: Capitol / Cat. Num. : T 1743 / Rel. 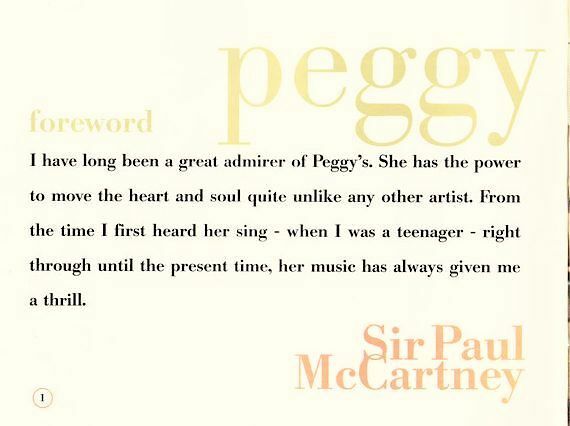 Year: 1962 / Tracks: 12 / Note: UK edition of the album. 5 & 8. 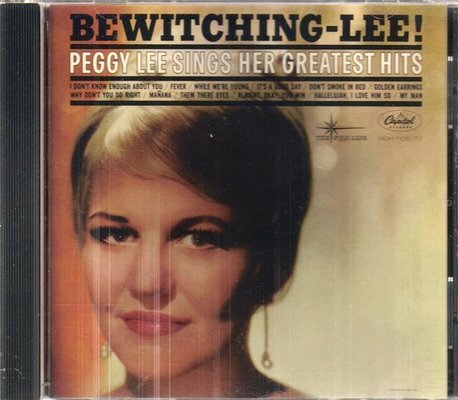 Title: Bewitching-Lee! / Format: CD / Label: Dcc / Cat. Num. : Dzs 179; also 7243 5 23863 2 1 / Rel. Year: 1999 / Tracks: 14 / Note: Digital reissue of item #1, with one deleted track ("Mañana) and three bonus tracks ("You Don't Know," "I'm Gonna Go Fishin'," and "Is That All There Is?"). The CD's front cover is shown on image #5, the back cover on image #8. 6 & 9. 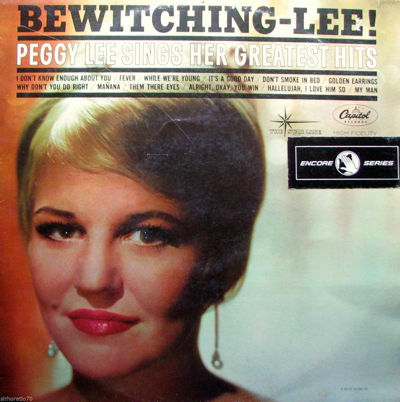 Title: Bewitching-Lee! / Format: audiophile LP & CD / Label: S&P / Cat. Num. : Sp 502 & Spr 709 [also Emi 7243 5 84239 2 1] / Rel. Year: 2003 / Tracks: 15 / Note: Digital reissue of item #1, with three bonus tracks ("You Don't Know," "I'm A Woman," and "Unforgettable"). Notice that two of the three bonus tracks are different from those in the preceding CD from the DCC label. 7 & 10. 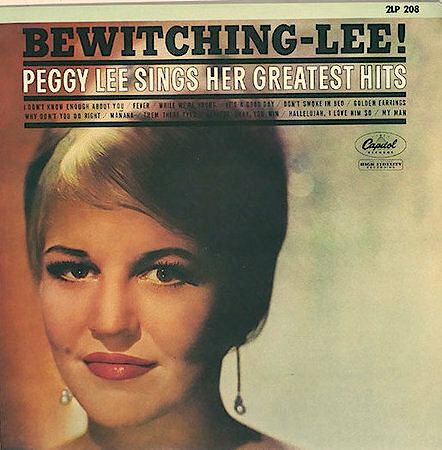 Title: Bewitching-Lee! / Format: audiophile LP & CD / Label: S&P / Cat. Num. : Sp 502 & Spr 709 [also Emi 7243 5 84239 2 1] / Rel. Year: 2003 / Tracks: 15 / Note: 180 gram vinyl counterpart of the preceding CD, containing the same bonus tracks. 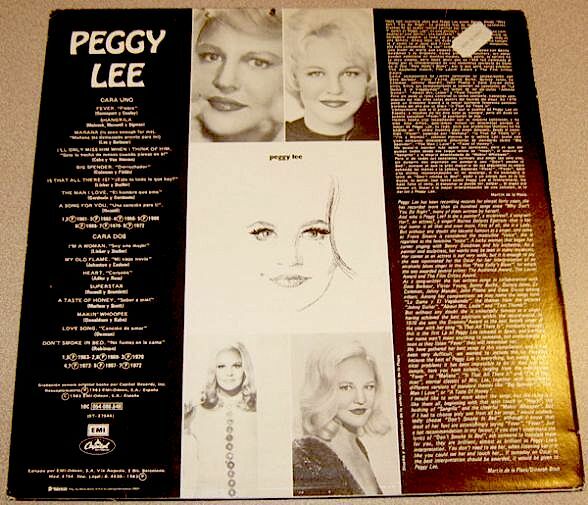 The LP's front cover is shown on image #7, the back cover on image #10. 11-13. 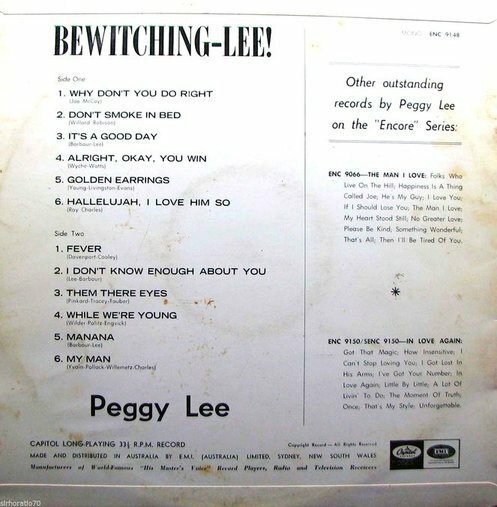 Title: Bewitching-Lee! (Encore Series) / Format: LP / Label: Capitol / Cat. Num. : (Australia) Enc 9148 / Rel. Year: 1964 & unknown / Tracks: 12 / Note: These three pictures show either two or three different Australian editions of the album under discussion. The differences between the first and the third item are vast and obvious. Yet they share the same catalogue number, tracks, and back cover. On the respective vinyl discs, the same blue-colored label is found, too. It is not clear to me which of the two is the original or earliest, though the first is the strongest candidate. Moving on to the second item, its close similarity to the third is just as obvious. However, the "encore series" logo of the second item is not on the same location as the third item. Such a divergence might or might not point to different editions. We could arrive to a conclusion if we were able to inspect a physical copy. (I have not been able to do so.) 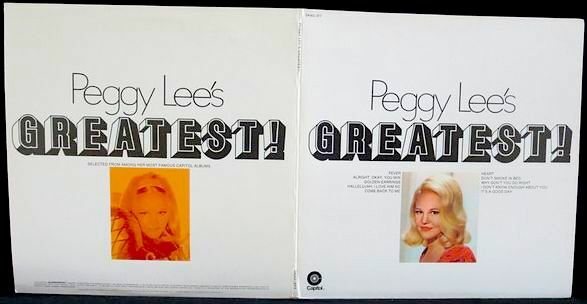 At issue is whether these two LP covers have the "encore series" logo imprinted on them, or whether the logos are instead mere stickers, glued to the covers. 14 & 15. 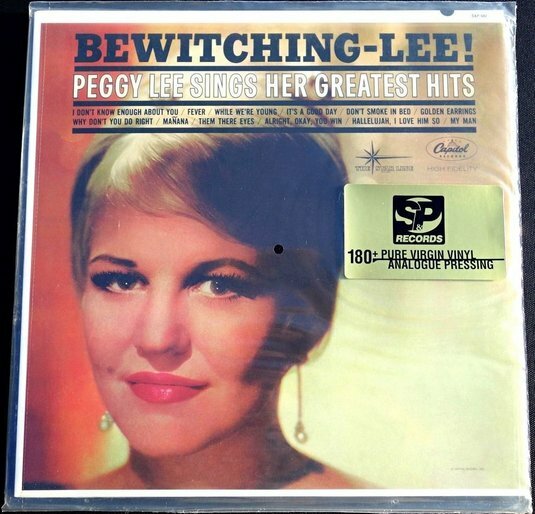 Title: Bewitching-Lee! / Format: LP / Label: Summit / Cat. Num. : (Australia) Sra 004 / Tracks: 12 / Rel. Year: unknown / Note: Reissue of item #1. (Same tracks, different artwork.) Presumed to be a licensed issue. 16. 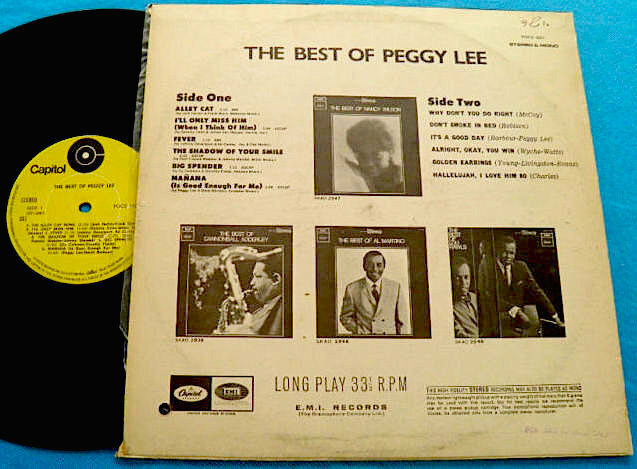 Title: The Best Of Peggy Lee / Format: LP / Label: Capitol EMI / Cat. Num. : (Israel) Pocs 1021 / Rel. 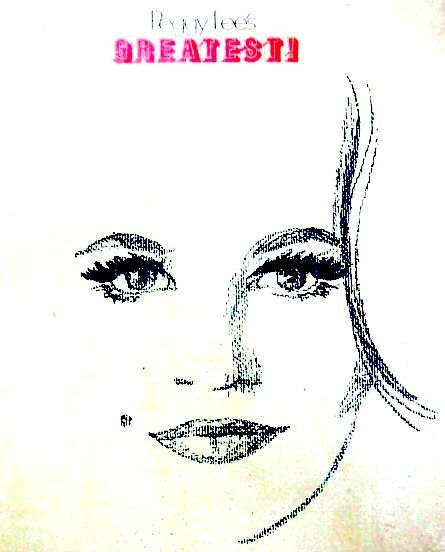 Year: unknown; post 1968 / Tracks: 12 / Note: Stamped on the back cover of this issue is the legend "for sale in Israel only." This Israeli issue actually combines tracks from two of the hits packages that Capitol released in the United States. 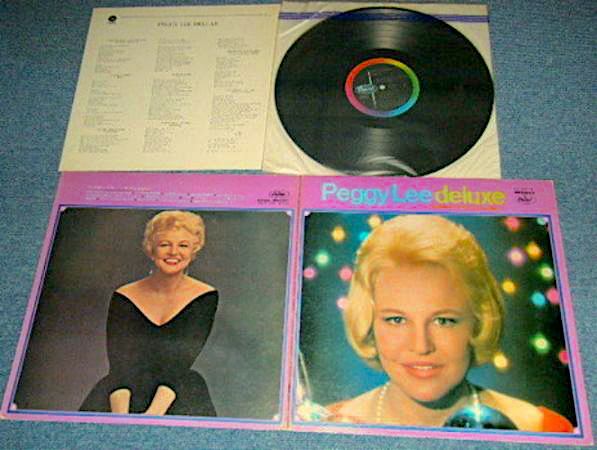 Side A (the first six songs) is the same as the A side of the 1968 Capitol album The Hits Of Peggy Lee (an album to be discussed below, in sections V and VI). 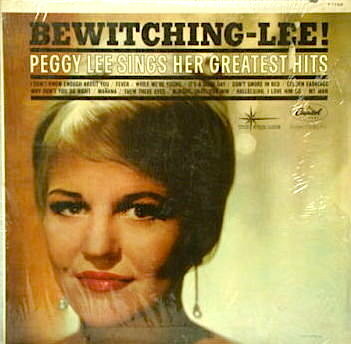 Side B is the same as the A side of the USA LP under discussion, the 1962 Capitol album Bewitching-Lee!. 17. 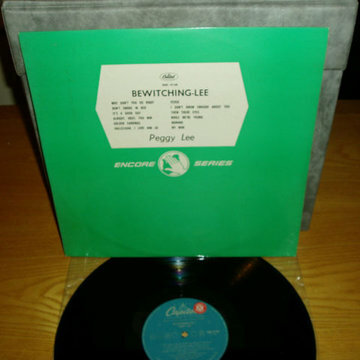 Title: Bewitching-Lee! / Format: 10" LP / Label: Capitol / Cat. Num. : (Netherlands) unknown / Rel. Year: unknown / Tracks: 10 / Note: As far as I know, this is the only 10" LP edition of what was a 12" LP album elsewhere. It contains 10 instead of 12 songs. "Don't Smoke In Bed" and "While We're Young" were the numbers dropped. 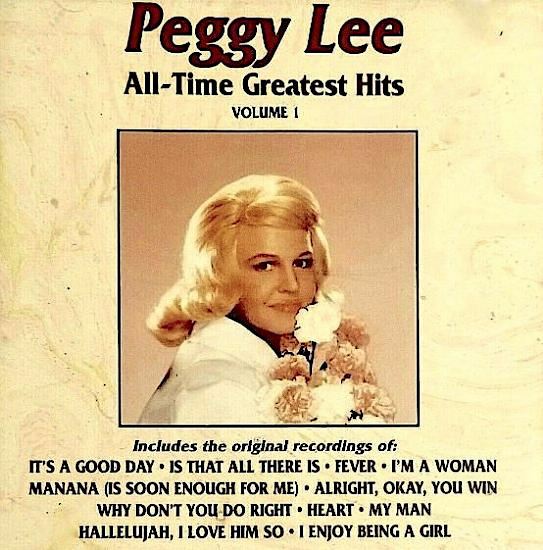 In this image of the front cover, notice the two blank spaces in the track listing. 18. 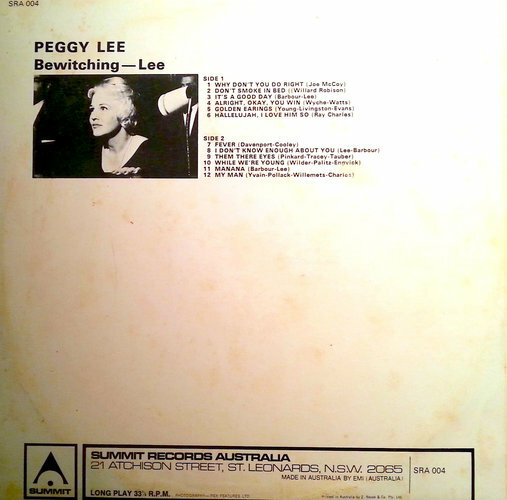 Back cover of the Australian reissue LP on Summit Records (images #14 & #15). 19. 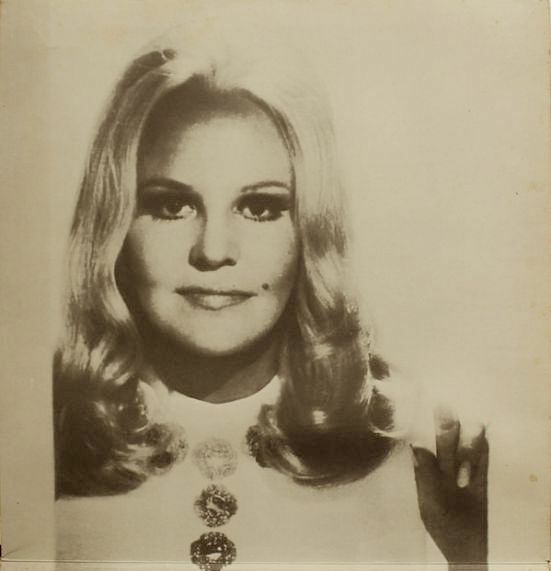 Back cover of the original American LP (image #1). 20. 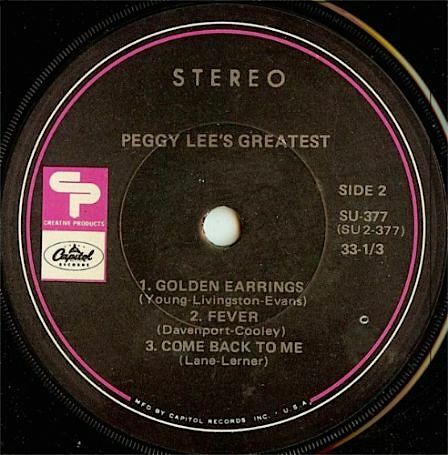 Back cover of one the reissue LPs from Australian Capitol's Encore Series (the one seen on the second of the three pictures, currently identified as image #12). 1. 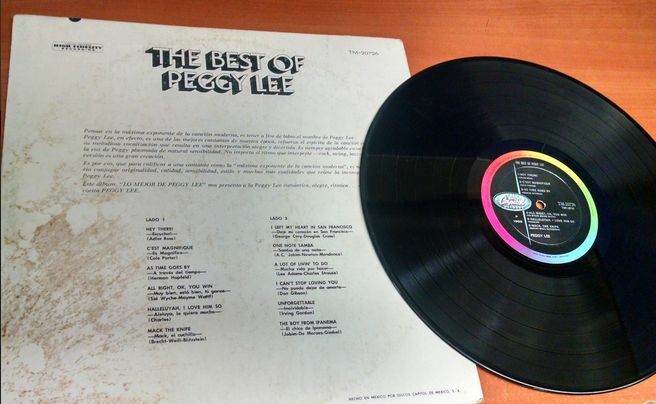 Title: The Best Of Peggy Lee / Format: LP / Label: Discos Capitol De México / Cat. Num. : (México) Tm 20726 / Rel. Year: ca. 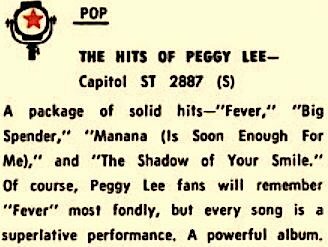 1965 / Tracks: 12 / Note: The year of release is approximate; 1966 and 1967 are also possibilities. 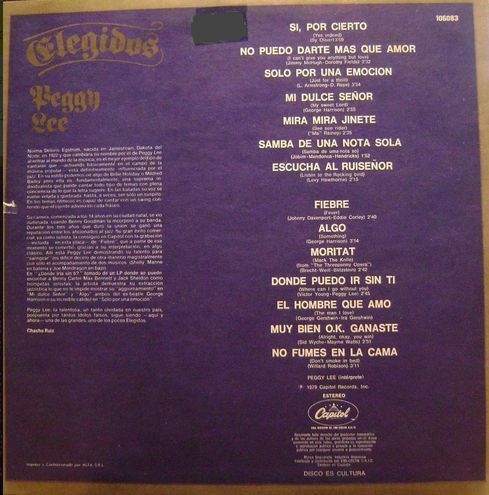 The back cover supplies the song titles in both English and Spanish. 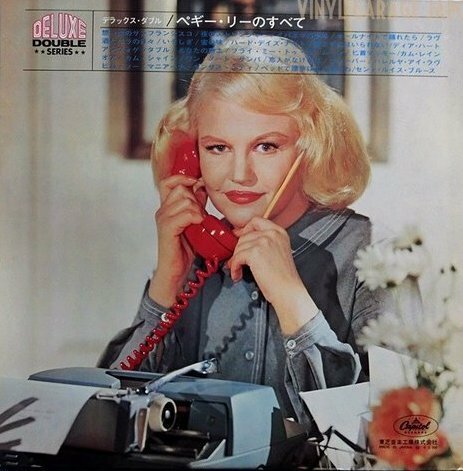 Oddly, this album (with such typical American Capitol cover) was never released in the United States. 3. 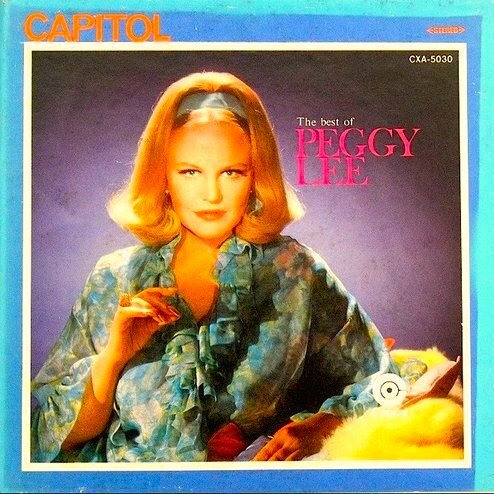 Title: The Hits Of Peggy Lee / Format: LP / Label: Capitol / Cat. Num. : (Asia) Csj 701 / Rel. 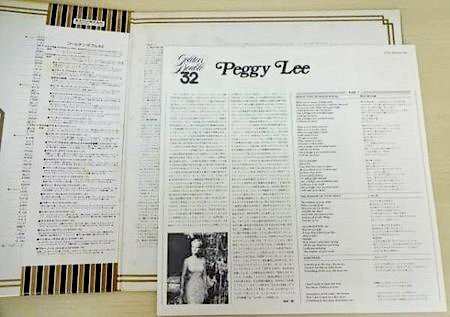 Year: unknown; according to an online source, October 1968 / Tracks: 11 / Note: According to one of the online sellers of the above-seen item, its date is 1968 and its specific country of origin Taiwan. 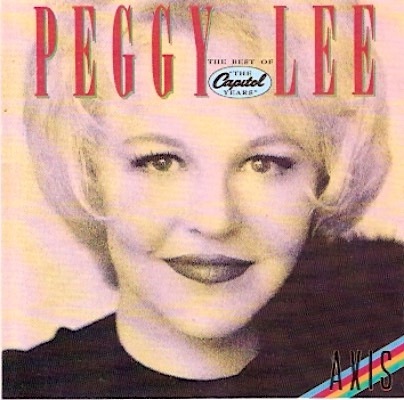 During the LP era, the mildly altered British version of this album may have been the most internationally disseminated package of Capitol hits by Peggy Lee. 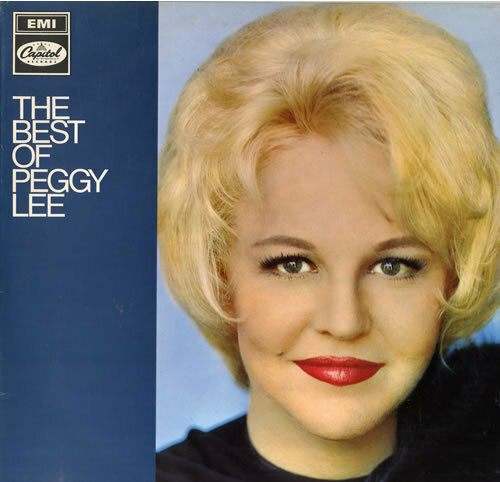 Bearing the more generic title The Best Of Peggy Lee, that British version will receive discussion in the next section. 4. 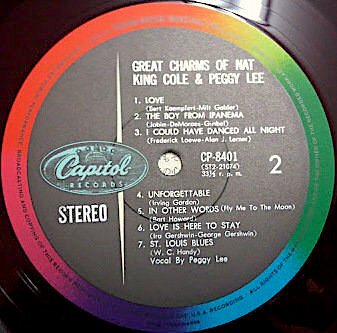 Label on the vinyl of the original American LP (side two). 5. 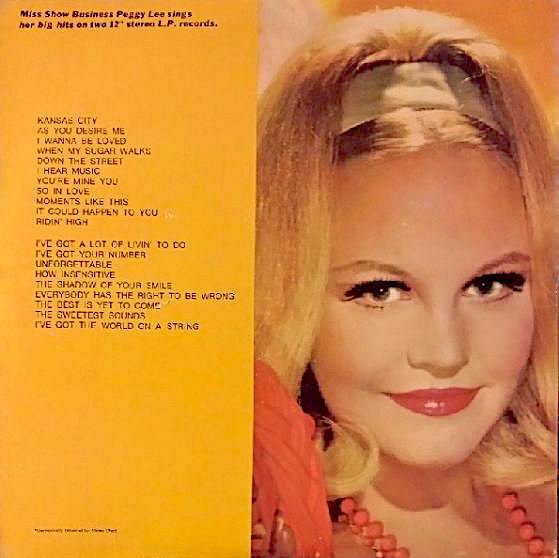 Back cover of the original American LP. 1 & 4-6. 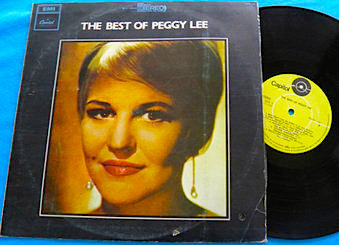 Title: The Best Of Peggy Lee / Format: LP & & CS & 8-Track / Label: EMI / Cat. Num. : (United Kingdom) (S)t 21141 & Tc-St 21141 & 8x 21141 / Rel. 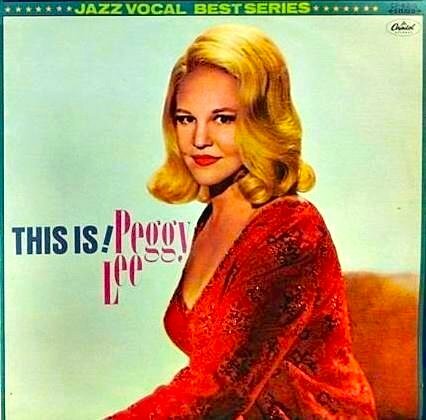 Year: 1968 / Tracks: 16 / Note: Thee album under discussion is actually the British version of the 1968 American LP The Hits Of Peggy Lee (discussed in section V above). 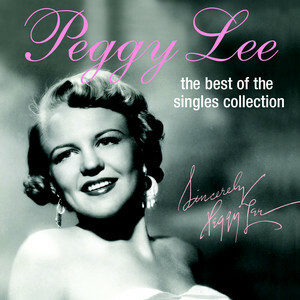 Granted that they have different titles and use different artwork, the American and the British albums share the same eleven tracks, and were released the same year. In the case of the British album, five tracks have been added to the original eleven, for a 16 total. 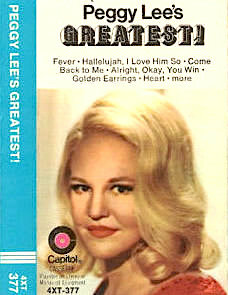 One rationale behind the inclusion of the five bonus tracks was probably that, in Great Britain, Lee was identified with most if not all of the added songs. 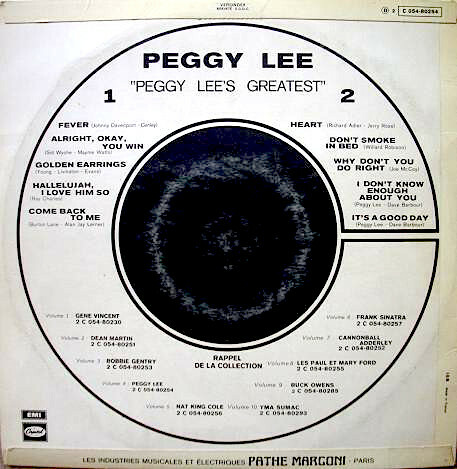 The first image above shows the front cover of this 1968 vinyl, which also came out on 8-track and cassette. Images of those other formats can be seen below (images #4, #5, #6). As for the other, red-colored artwork seen above, it belongs to later reissues, to be discussed next. 2-3. 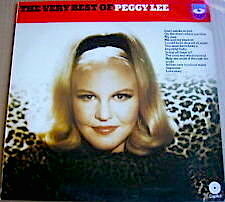 Title: The Best Of Peggy Lee / Format: LP & CS / Label: Emi Music For Pleasure / Cat. Num. : (United Kingdom) Mfp 5605 & TcMfp 5605 / Rel. Year: 1983 / Tracks: 16 / Note: Straight reissue of item #1, with a slightly altered cover. 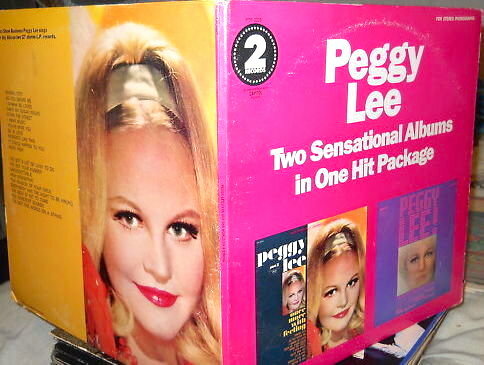 During the LP era, the 1968 album The Best Of Peggy Lee/The Hits Of Peggy Lee [British/American editions] became the most internationally disseminated package of Capitol hits by Peggy Lee. Some editions from other countries will be discussed immediately below, but they are not the only ones in existence. Through the present discographical page, other iterations of the album have been listed within different sections, for one reason or another. (Some of them are hard to spot or recognize at first, due to relatively minor modifications in artwork or tracks.) See, for instance, under years 1982 and 1984. 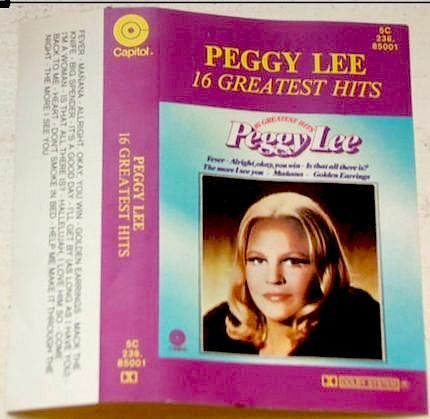 I will not be surprised to uncover yet more foreign editions of The Hits of Peggy Lee during future research. 7-8. 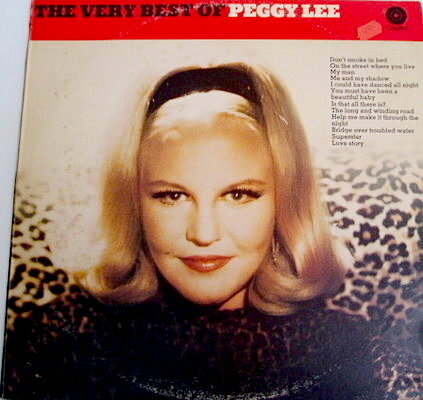 Title: The Best Of Peggy Lee ("The Very Best Of" Series) / Format: LP / Label: Emi Bovema / Cat. Num. : (Netherlands) 5C 054.80056 / Rel. 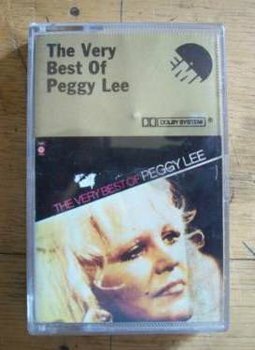 Year: unknown; no earlier than 1968 / Tracks: 11 / Note: Like the just-discussed British albums, this Dutch item is also a slightly modified edition of the 1968 American package The Hits Of Peggy Lee (section V above). Whereas the American album has just 11 tracks, this Dutch version rounds out its track total to 10. (The skipped number is "I'll Only Miss Her When I Think Of Her.") 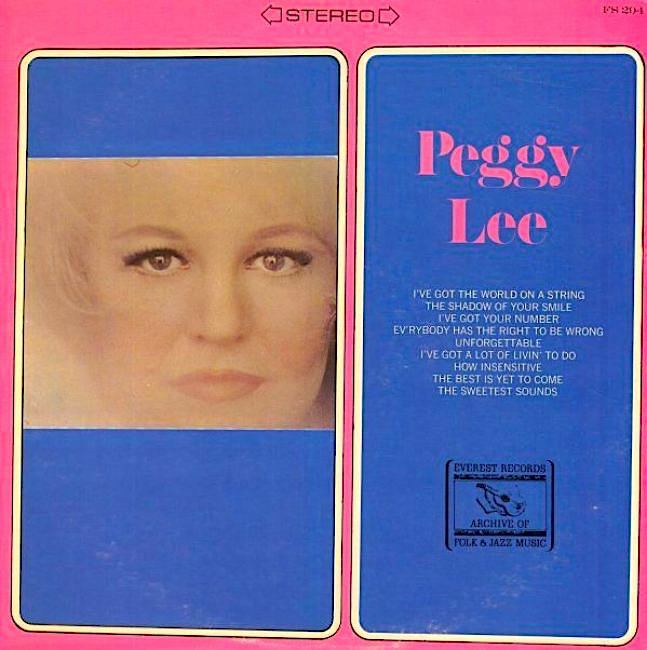 The album's back and front covers are seen in these two images. My thanks to Roland Bergevoet for his kind assistance with the research of this album, and for his generous gifting of his album copy to me. Images #9 and #10 are provided for complimentary purposes only. They showcase a commercially issued sampler LP, consisting of tracks culled from the albums in this Dutch Best Of series. 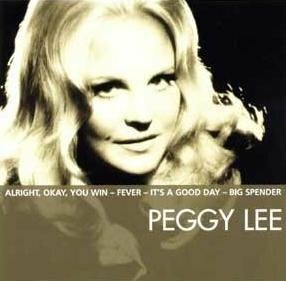 From the Peggy Lee volume, "Big Spender" was chosen for inclusion on this Very Best sample, whose catalogue number is 5c 054.24169 x. Finally, image #11 offers a peak at the series' catalogue, as advertised in the inner side of this sampler's record jacket. 12-13. 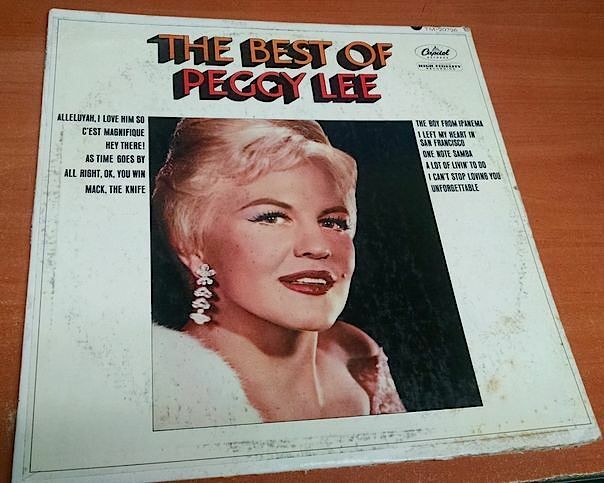 Title: The Best Of Peggy Lee / Format: LP / Label: Capitol EMI / Cat. Num. : (Israel) Pocs 1021 / Rel. 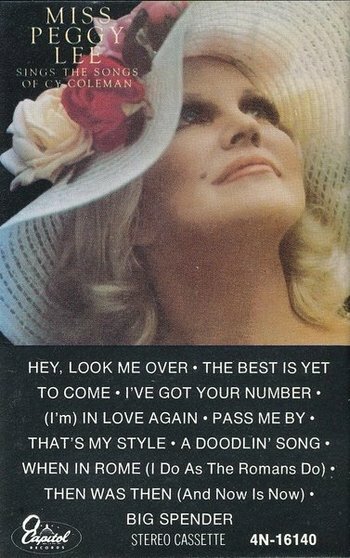 Year: unknown; post 1968 / Tracks: 12 / Note: Stamped on the back cover of this album is the legend "for sale in Israel only." This Israeli issue combines tracks from two of the hits packages that Capitol released in the United States. 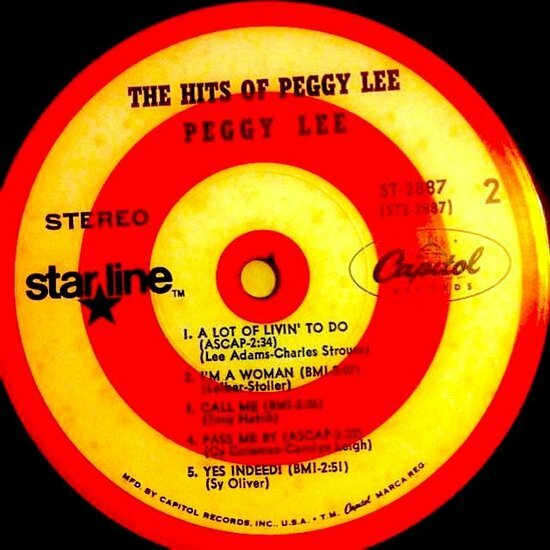 Side A (the first six songs) is the same as the A side of the 1968 USA Capitol album The Hits Of Peggy Lee. 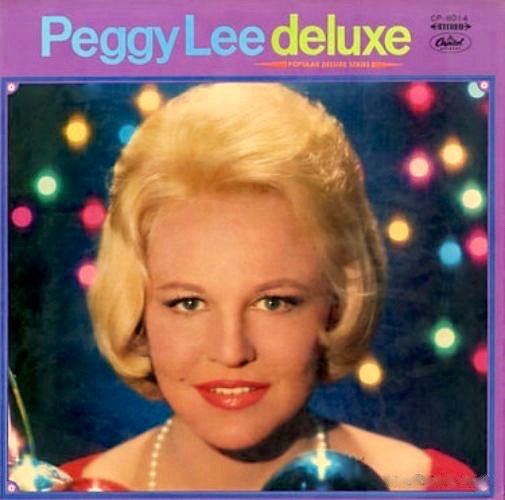 (As already explained, The Best Of Peggy Lee -- the main British album under discussion in this section -- is actually a reconfigured version of that USA album.) 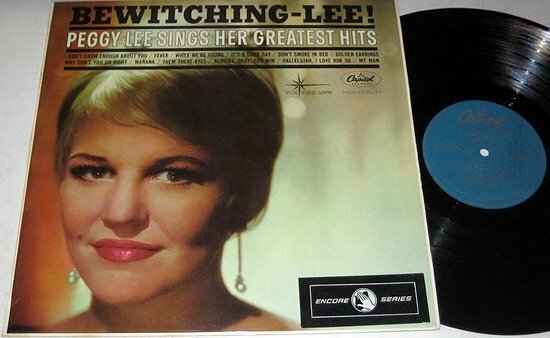 As for side B of this Israeli item, it is the same as the A side of the 1962 Capitol album Bewitching-Lee!. 14-15. 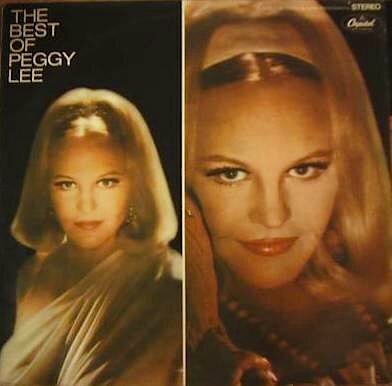 Title: The Best Of Peggy Lee / Format: LP / Label: Supraphon - EMI / Cat. Num. : (Czechoslovakia) 11 0466 1 / Rel. Year: 1988 / Tracks: 14 / Note: Abridged Czech edition of album #1 above. 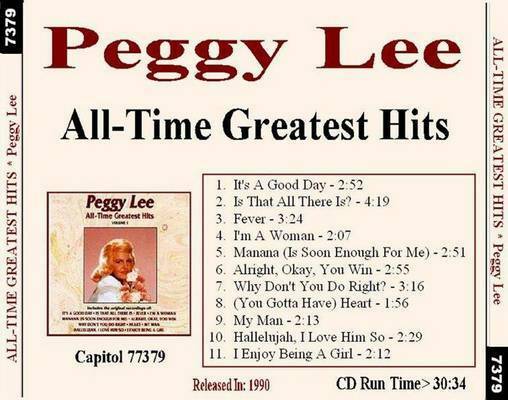 The two excluded tracks are "I'll Only Miss Him When I Think Of Him" and "Why Don't You Do Right?." Online, I have seen the same front cover in colors that oscillate from blue to green. I have no indication of any reissue activity for this particular item. At this point, In am incline to think that there is only one color (the one above), and that the other covers have been altered by the picture uploaders. Lamination could account for such variants in color, too. Ditto for discoloration, due to the passing of time. 1-3. 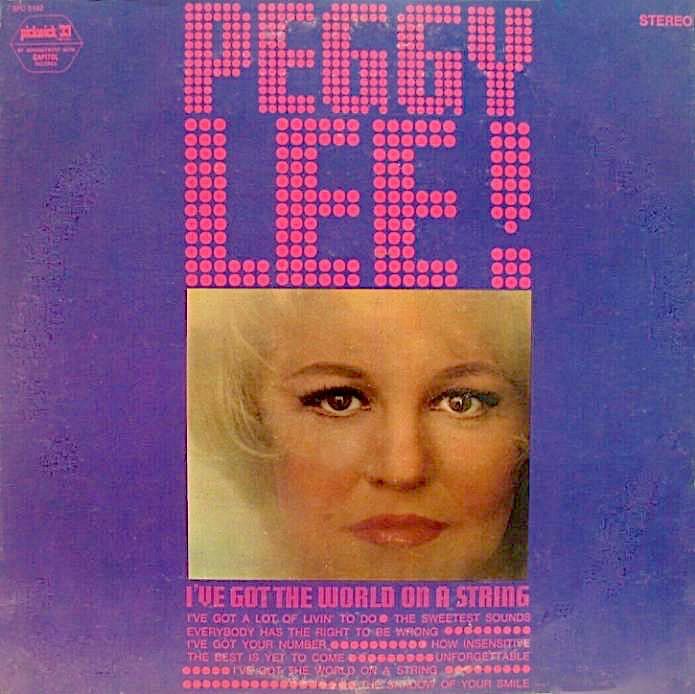 Title: Once More With Feeling - I've Got The World On A String ("2 Sensational Albums In 1 Hit Package") / Format: LP / Label: Pickwick / Cat. Num. : Ptp 2028 2 / Rel. 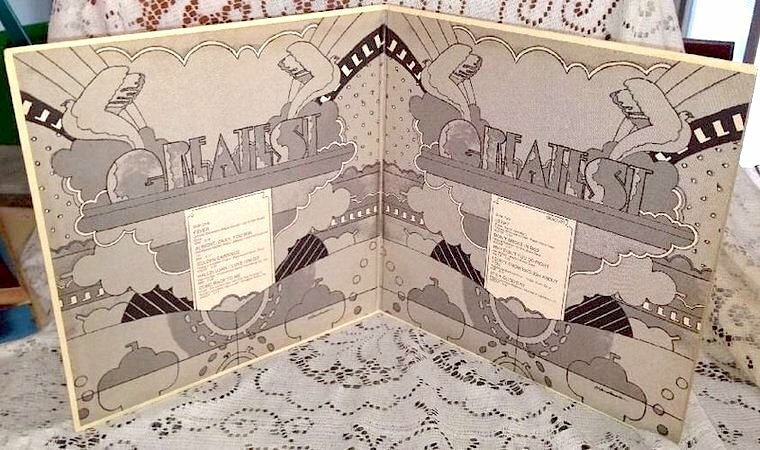 Year: 1968 / Vinyl Pieces: 2 / Tracks: 19 / Note: Shown above are the front and back covers of this gatefold album. 4 & 5. 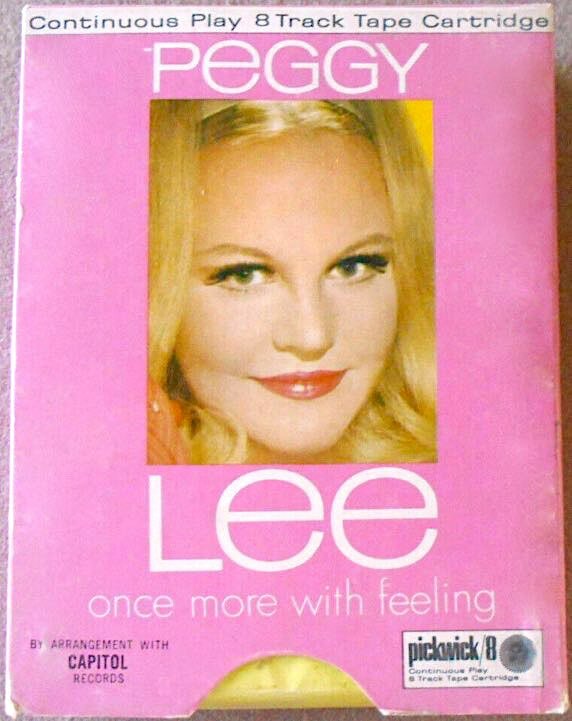 Title: Once More With Feeling / Format: 8-track & LP / Label: Pickwick / Cat. Num. : P8 139 & (S)Pc 3090 / Rel. 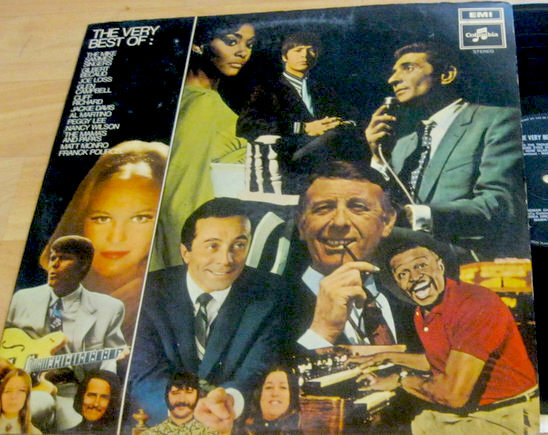 Year: 1968 / Tracks: 10 / Note: The two LPs that were part of the above-discussed gatefold album (images #1 to #3) were also sold separately, as single LPs. Seen herein is one of the single LP versions. 6. Title: I've Got The World On A String / Format: LP / Label: Pickwick / Cat. Num. : Spc 3192 (same tracks as Everest 294) / Rel. 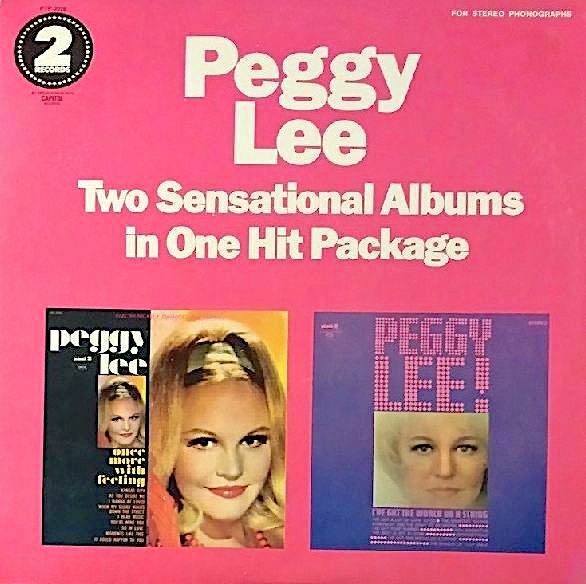 Year: 1968 / Tracks: 9 / Note: Note: The two LPs that were part of the above-discussed gatefold album (images #1 to #3) were also sold separately, as single LPs. Seen herein is one of the single LP versions. 7. 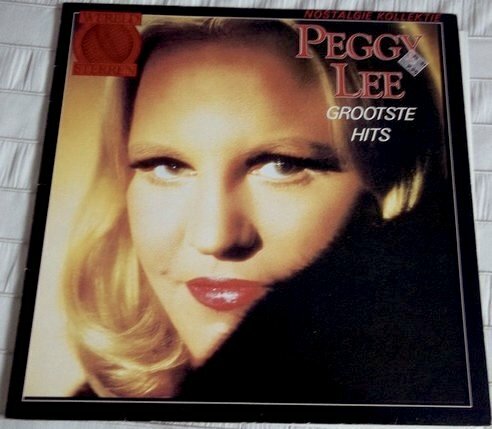 Title: Peggy Lee ("Archives of Folk & Jazz Music" Series) / Format: LP / Label: Everest / Cat. Num. : Fs 294 (same tracks as Pickwick 3192) / Rel. Year: 1974 / Tracks: 9 / Note: Reissue of item #6. Released on Pickwick's sub-label, Everest. 8. 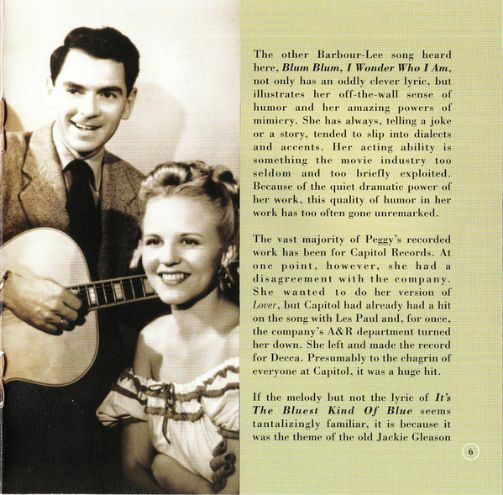 Back cover of the LP shown in image #6. 9. 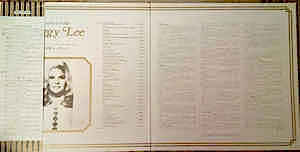 Inner sides of the gatefold LP album seen in images #1 to #3. VIII. 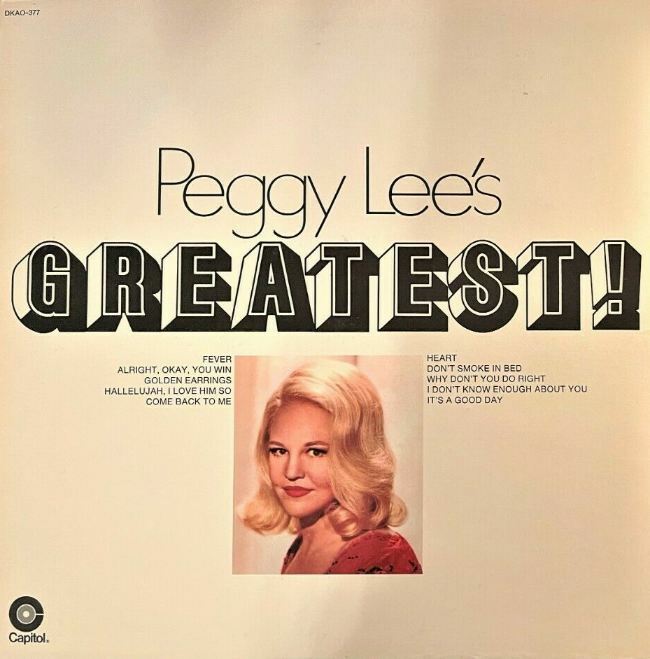 1969: PEGGY LEE'S GREATEST! 1-4. 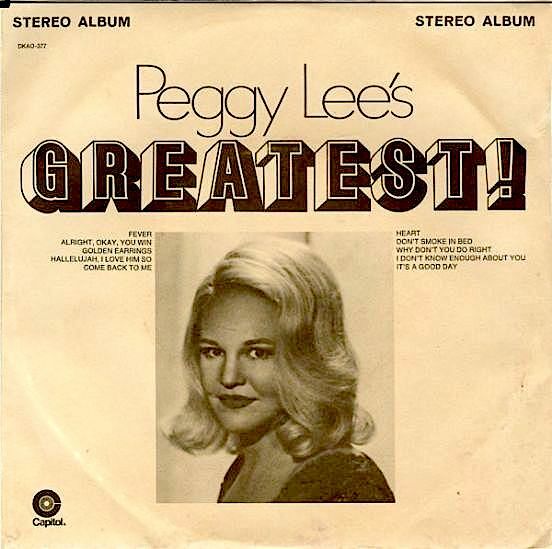 Title: Peggy Lee's Greatest! / Format: 8-Track & CS & LP & Reel / Label: Capitol / Cat. Num. : 8xt 377 & 4xt 377 & Dkao 377 & X 377 / Rel. Year: 1969 and later / Tracks: 10 / Note: Eight-track and cassette editions of this 1969 budget compilation, which Capitol reissued at least twice in the 1970s. 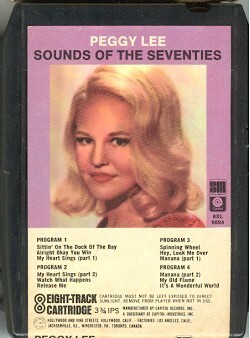 (The first two images show two different eight-track editions, the other cassette editions which are also visually different from one another.) The most common format, LP, will be showcased below. On the other hand, the fourth formant will not be showcased at all: unfortunately, I'm currently missing images for that configuration. There is actually a fifth configuration, EP, which will be discussed next. 5-7. 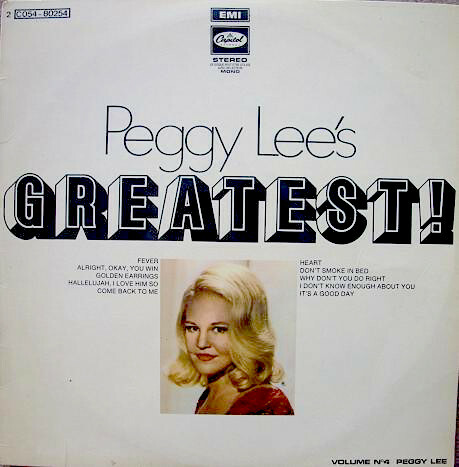 Title: Peggy Lee's Greatest! / Format: jukebox EP / Label: Capitol Creative Products (for Little LP's Unlimited) / Cat. Num. : Su 377 / Rel. Year: 1971 / Tracks: 6 / Note: Duophonic 33.3 rpm item. 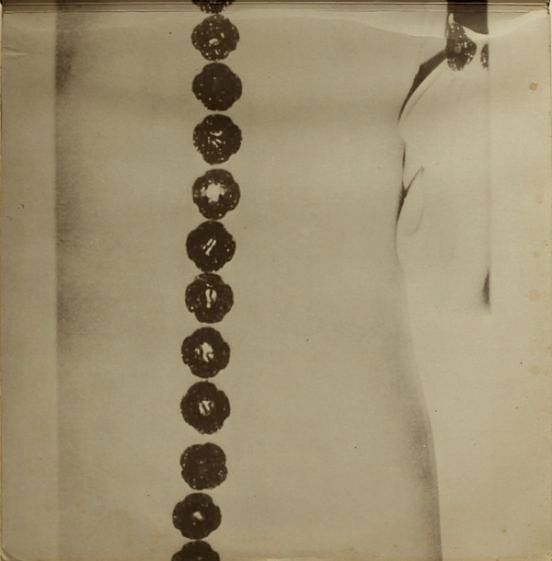 Although the EP's front cover lists all ten songs found in the other configurations (LP, cassette, etc. ), only six of those tracks are actually included. The actual track contents are revealed instead on the back cover, and laso and on the labels of the vinyl discs. 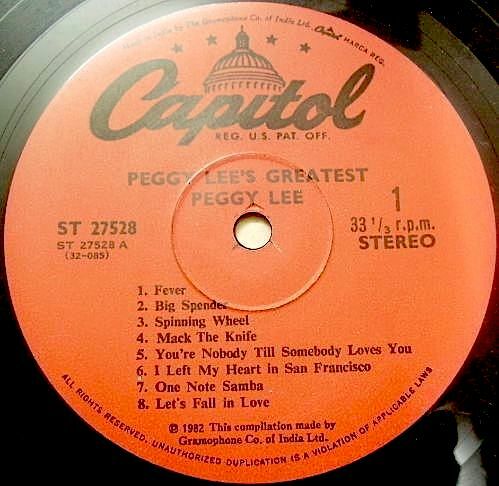 The releasing company was not Capitol per se, but a licensee, which also receives due credit only on the album's back cover. 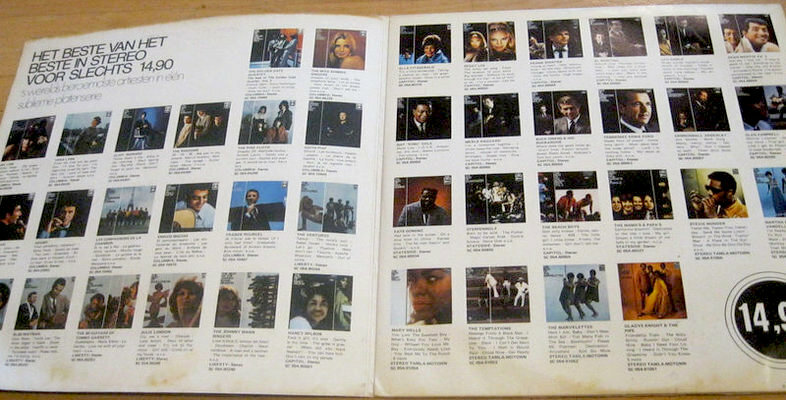 In their four years of existence (1970-1974), Little LP's Unlimited offered about 180 jukebox EPs. Their production was presumably based on patrons' demand. Precious few of them were Capitol items. 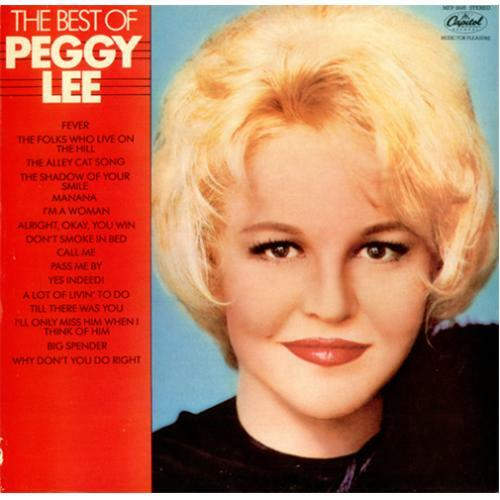 From a cursory look at a nearly complete catalogue listing, I can mention just five, from the following Capitol artists: Glen Campbell, Nat King Cole, Merle Haggard, Sonny James, and the only female in the bunch, Peggy Lee. 8-9. 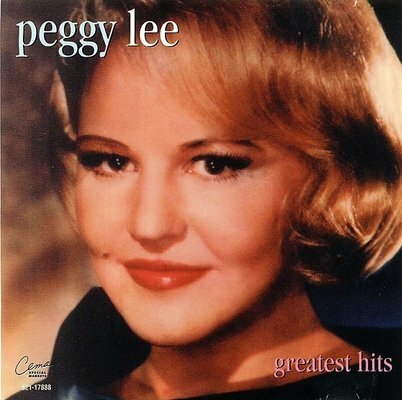 Title: Peggy Lee's Greatest! 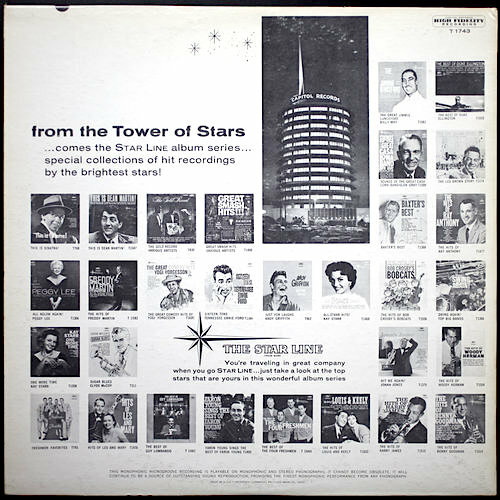 ("Star★Line" Series) / Format: LP / Label: Capitol / Cat. Num. : Dkao 377 / Rel. Year: 1969 / Tracks: 10 / Note: Original American LP edition of the item under discussion. Gatefold album. Simulated stereo. The album self-identification as a member of the Star★Line series appears only on the vinyl. Pictures of this vinyl issue and its reissues will be presented, for comparison, next. 10-13. 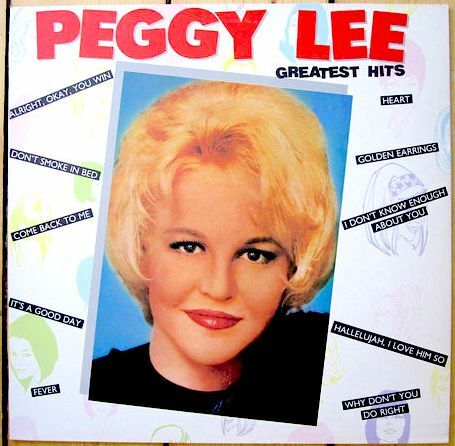 Title: Peggy Lee's Greatest! 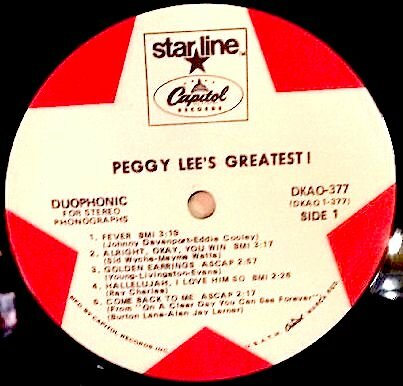 ("Star★Line" Series) / Format: LP / Note: In the LP format, the album under scrutiny enjoyed at least three (re-)issues from American Capitol. All three editions have the same cover artwork. The differences manifest themselves in the coloring and design on the label that is attached to the vinyl disc. 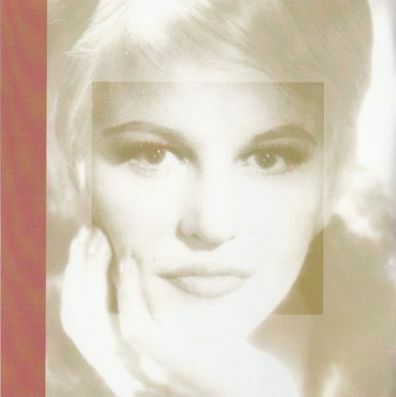 The first of these images showcases the label of the original edition (1969). The orange-golden edition must have been released in or around 1972. The blue one (image #12) probably dates from 1981 or 1982. 14-16. 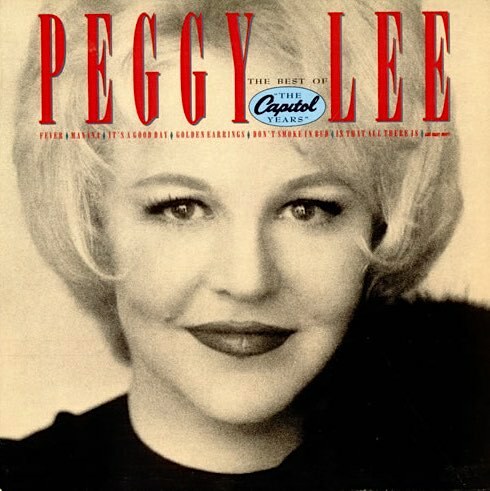 Title: Peggy Lee's Greatest! / Format: LP / Label: Pathé Marconi / Cat. Num. : (France) 2C 054 80.254 / Rel. 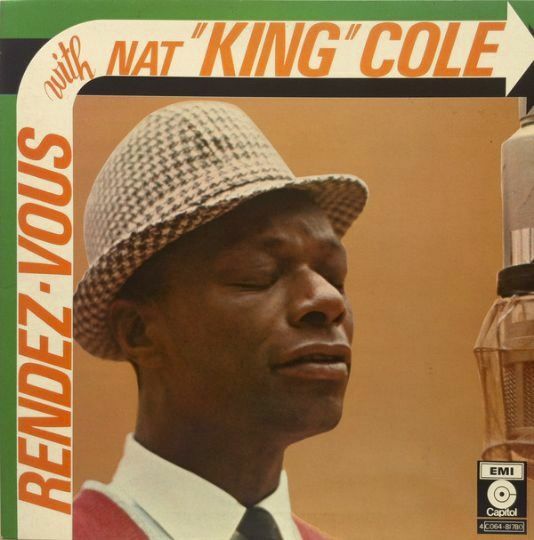 Year: unknown / Tracks: 10 / Note: French LP edition. Same tracks as the American original, in simulated stereo, but not a gatefold album, and not part of the Star★Line series. Instead, it identifies itself as a fourth volume of what I presume to be a French counterpart to that series. Also issued in other European countries, including Germany (same catalogue number) and Portugal (11C 076 80254, according to one online account). 17-19. 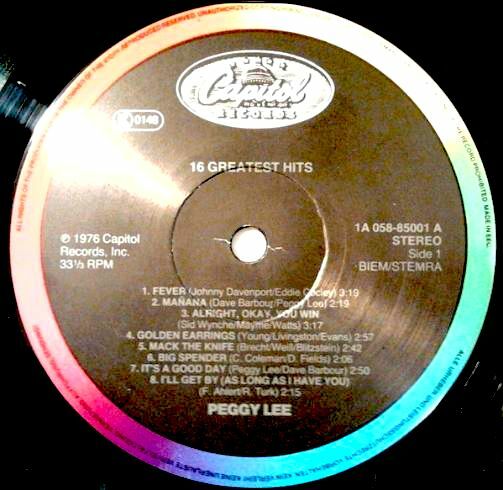 Title: Greatest Hits / Format: LP / Label: CAPITOL / Cat. Num. : (Italy) 1802541 / Rel. 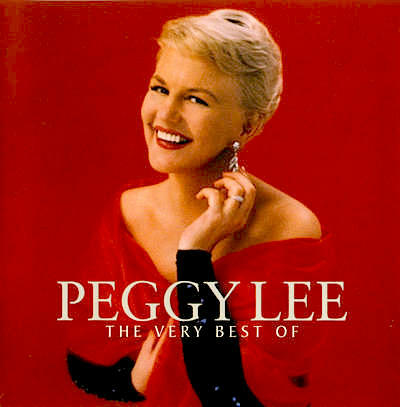 Year: 1984 / Tracks: 10 / Note: Same tracks as on the original American edition of Peggy Lee's Greatest! 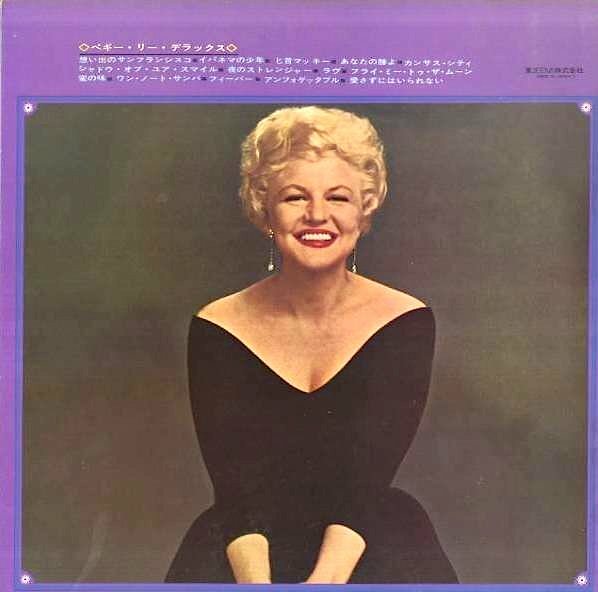 (despite using a front photo that is distinctive of another hits package, and despite a title that is partially different from Peggy Lee's Greatest!, too). 20-21. 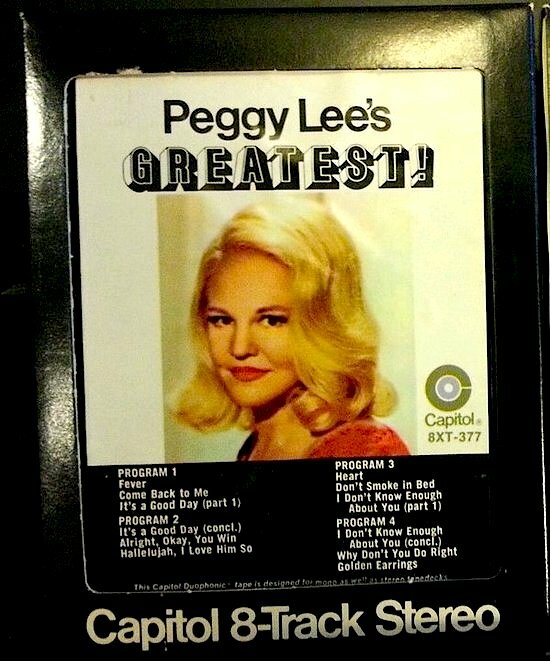 Title: Peggy Lee's Greatest! / Format: LP / Label: Capitol CBS / Cat. Num. : (Israel) St 052 80254 / Rel. Year: 1977 / Tracks: 10 / Note: Israeli edition of item #1. Same tracks as the American original. No Star★Line identification. Not a gatefold album. Simulated stereo. 1-3. 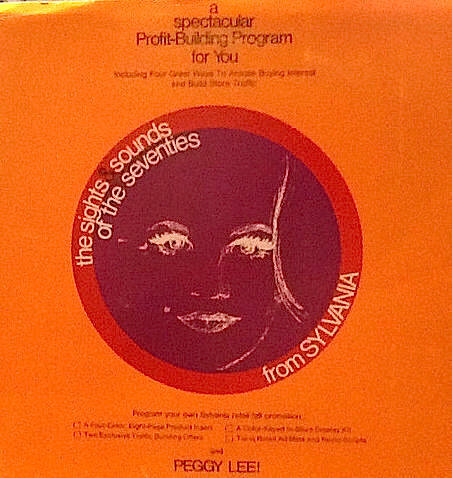 Title: The Sights & Sounds Of The Seventies / Format: LP + Promotional Kit / Date: Fall 1970 / Note: A sales kit, sent out to electronics stores that were selling Sylvania's TV consoles and record players during the fall of 1970, and also during the holiday period. 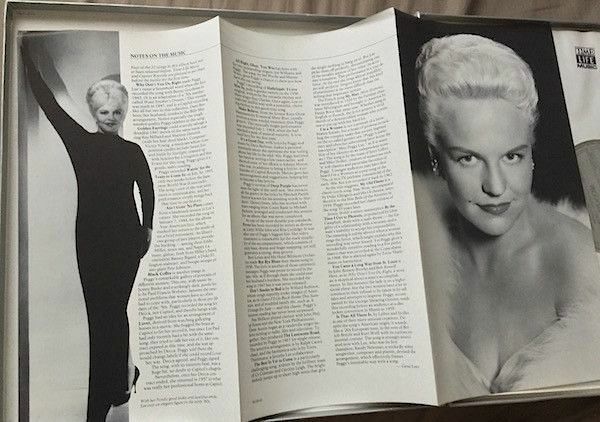 Most of the the kit's contents can be seen in the first image: a Peggy Lee LP, a letter from an ad agency, and a foldout or 'portfolio' (barely visible behind the letter). Some of these items will be separately discussed below. Of the other two images above, I believe that the second displays the kit's front cover -- or, at any rate, its main pictorial artwork. The third and last image above illustrates how electronics outfits were being advised to position their in-store displays. 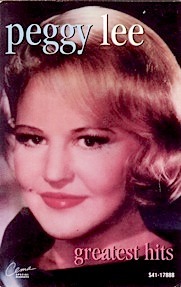 According to this illustration, posters with large-size images of Peggy Lee were to be placed above the sales counters and on top of Sylvania TV sets. 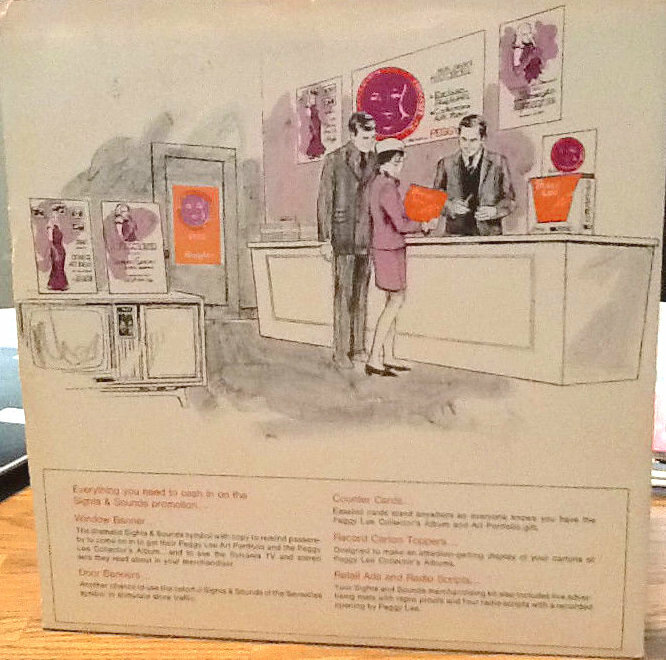 Posters and the album itself (both recognizable by their orange coloring) were prominently on display as well. 4. Title: Sights Of The Seventies / Format: Ad / Date: 1970 / Note: More promotional material. Although I have no corroboration, I assume that this particular ad was part of the above-described kit (with which I am acquainted only through the images supplied herein). 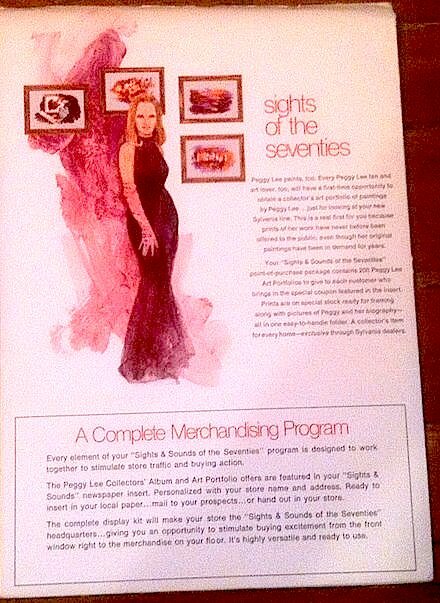 According to the ad, which might have been attached to the portfolio which will be described in the next entry, this will be the customers' "first-time opportunity to obtain a collector's set portfolio of paintings by Peggy Lee." We are also told that "prints of her work have never before been offered to the public." 7 & 8. 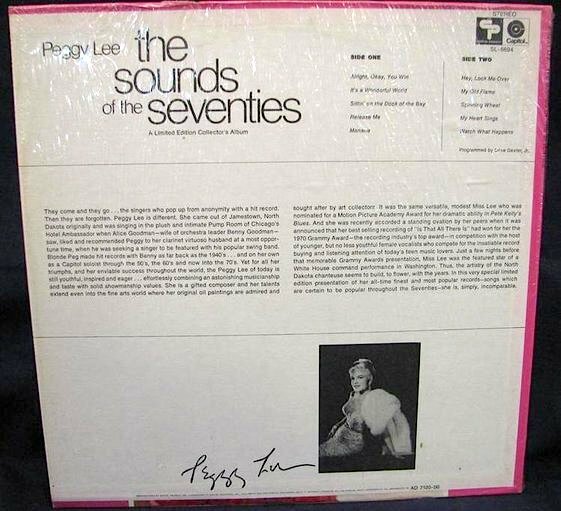 Title: The Sounds Of The Seventies / Format: LP & 8-Track & CS / Label: Capitol Special Markets / Cat. Num. : Sl 6694 & [?4xl] 6694 & 8xl 6694 / Rel. 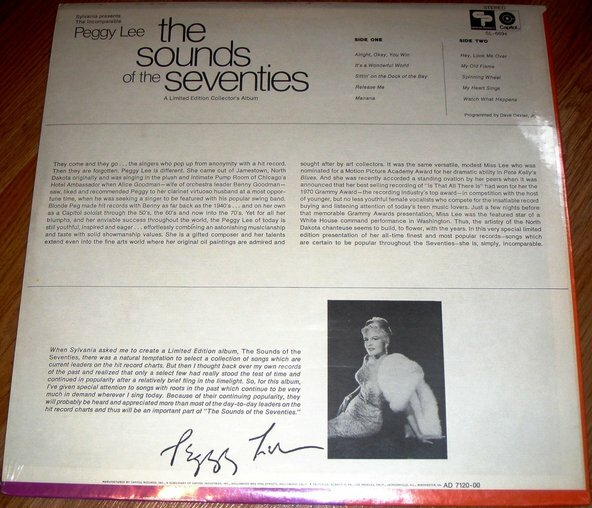 Year: 1970 or 1971 / Tracks: 10 / Note: The Sounds Of The Seventies was released twice, first as an exclusive promotional LP commissioned by Sylvania (item #6), and later as a LP (item #7) and 8-track cartridge (item #8). 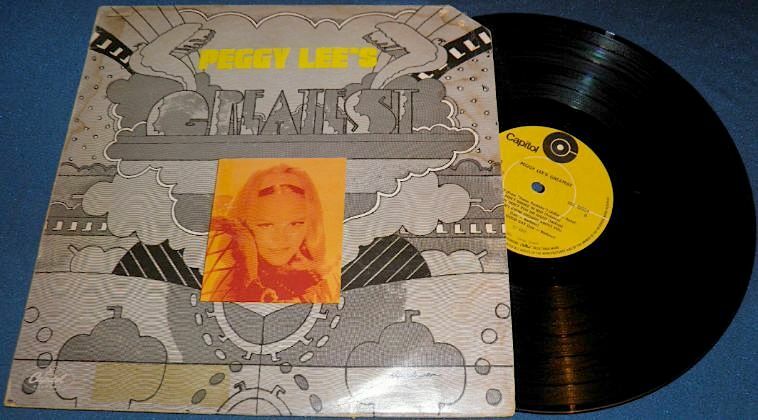 Note that the original LP was issued under the label's Creative Products logo, while the edition under discussion herein was released by the Capitol Special Markets branch. Other differences includes the entirely dissimilar artwork and the fact that this Special Markets reissue excluded the art booklet that accompanied the original LP edition. 9. 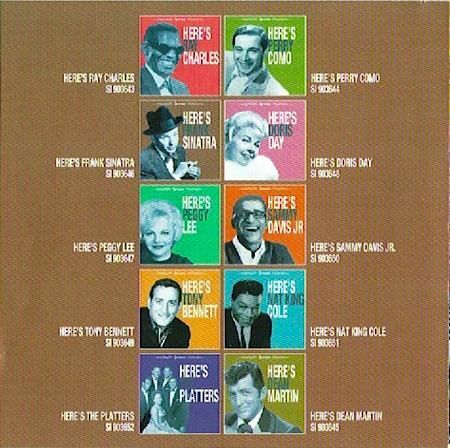 Record company insert that was part of the original Capitol Creative Products LP edition (image #6). 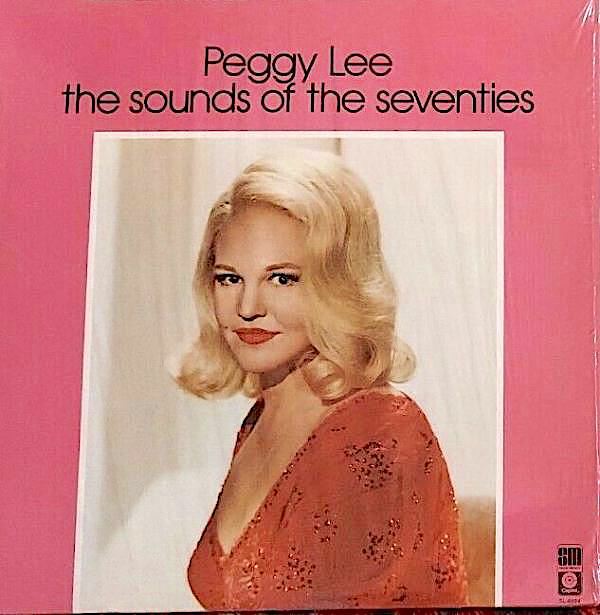 It explains the promotional campaign to which Peggy Lee's Sounds Of The Seventies was tied. 10. 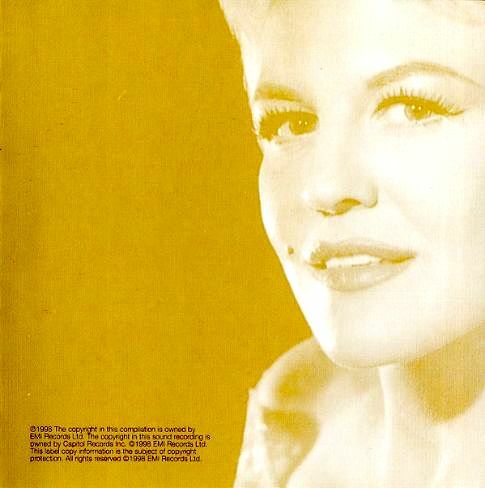 Back cover of the Capitol Creative Products LP edition (image #6). 11. 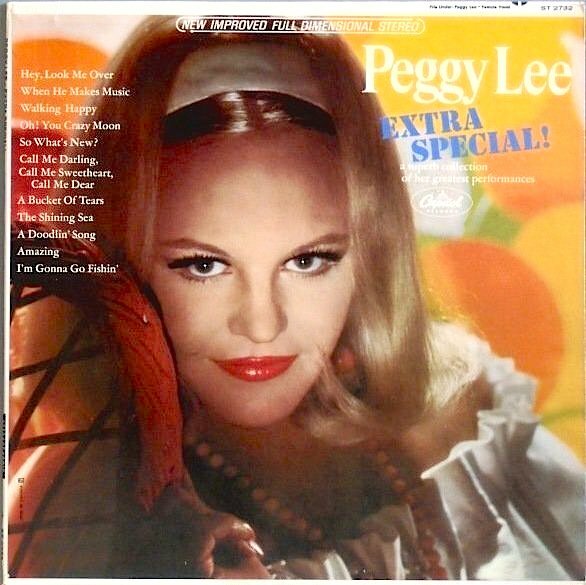 Back cover of the Special Markets LP edition (image #7). These back covers might look identical, but they are not. The Special Markets version (#7) is missing two self-identifying features from the original edition (#6). 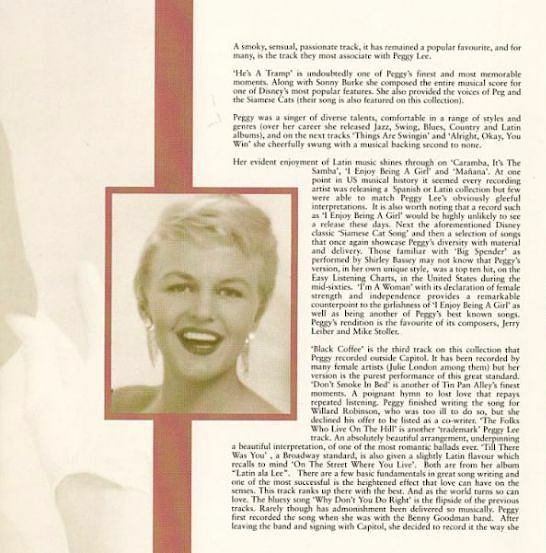 First, only the Creative Products item features the words "Sylvania presents the incomparable Peggy Lee." 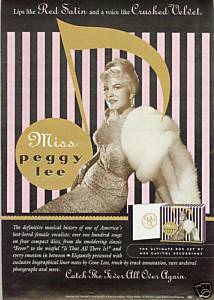 Second, the Special Markets edition lacks a note, signed by Peggy Lee, that can be found at the bottom of the original edition's back cover. 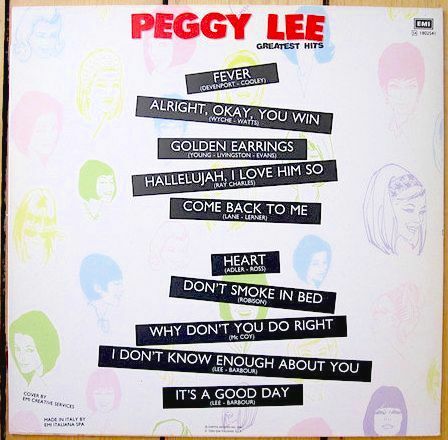 The note was most likely written not by Lee but by the album's producer and annotator, Dave Dexter, Jr., although he would not have written it without the singer's tacit approval. 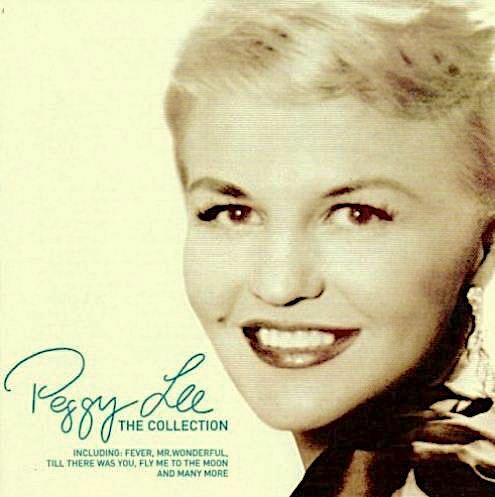 In spite of the note's suggestion that Lee was the one who chose the songs for this compilation, Dexter, Jr. is likelier to have been the one who picked them. 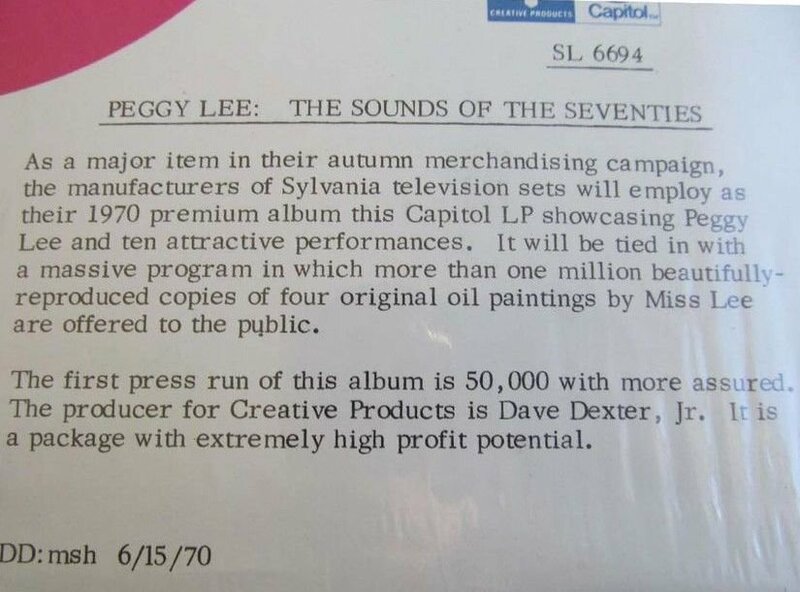 The note, in its entirety, reads as follows: "When Sylvania asked me to create a Limited Edition album, The Sounds of the Seventies, there was a natural temptation to select a collection of songs which are current leaders on the hit record charts. 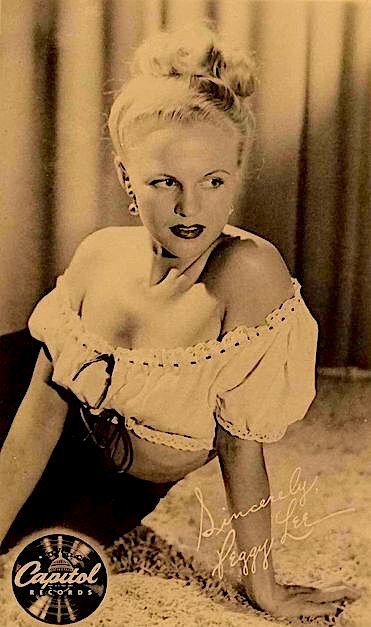 But then I thought back over my own records of the past and realized that only a select few had really stood the test of time and continued in popularity after a relatively brief fling in the limelight. So, for this album, I've given special attention to songs with roots in the past which continue to be very much in demand wherever I sing today. Because of their continuing popularity, they will probably be heard and appreciated more than most of the day-to-day leaders on the hit record charts and thus will be an important part of The Sounds of the Seventies." Naturally, this note is a marketing ploy, and as such, a box lax when it comes to historical accuracy. 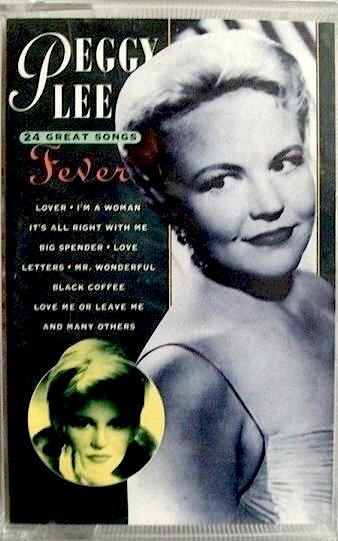 The thought that only a handful of Lee's numbers had stood the test of time is not likely to have crossed her mind, but even if it had, songs such as "Hey Look Me Over," "Release Me," or her 1969 version of "My Old Flame"could have hardly qualified as numbers perennially requested in her concerts. 1. 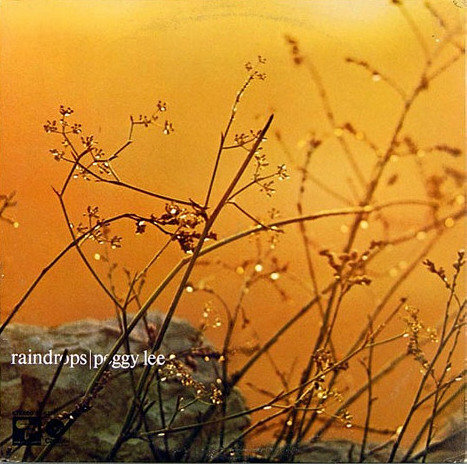 Title: Raindrops / Format: LP / Label: Capitol Creative Products / Cat. Num. : Sl 6723 / Rel. 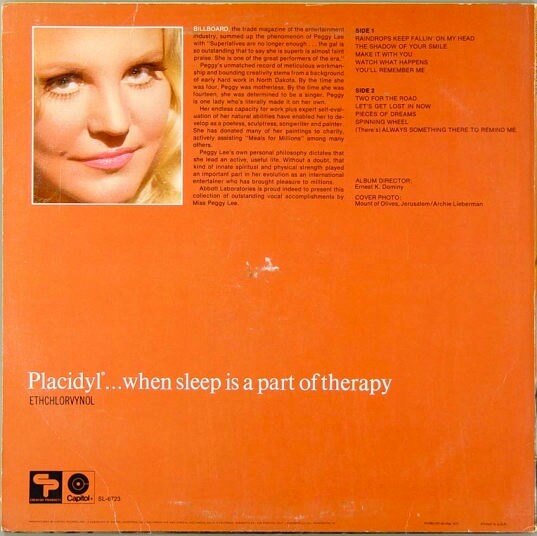 Year: 1971 / Tracks: 10 / Note: Abbott Laboratories commissioned this premium album from Capitol Creative Products. It was later reissued on Capitol Special Markets. 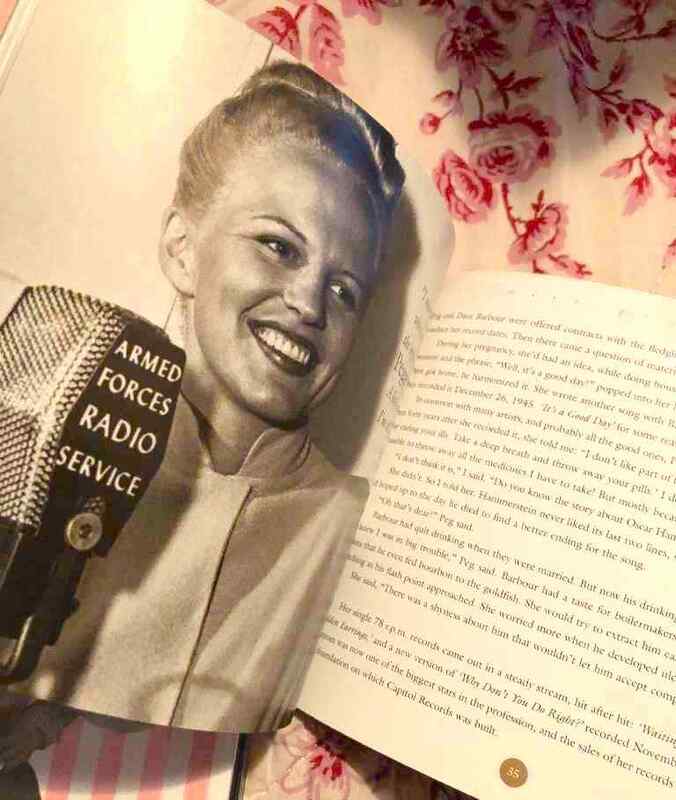 Pictures of the reissue, which bears no connection to Abbott Laboratories, have been supplied below. 2. 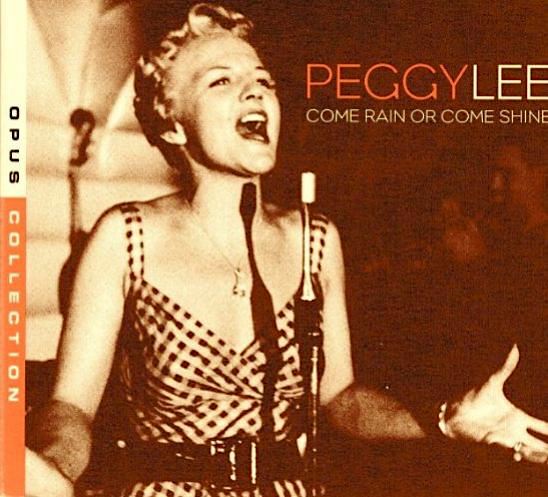 The original, premium edition of Raindrops was packaged with a pre-printed card signed by Peggy Lee. The card addresses the target Abbott Laboratories client as "dear doctor" and reads as follows: "for an entertainer, applause is a very personal and immediate sign of appreciation, and so this album is my way of applauding you in the medical profession. It's a special album that we've worked out with Abbott Laboratories, and my great hope is that it will give you pleasure - perhaps at a time when you have a real need for a moment's relaxation. 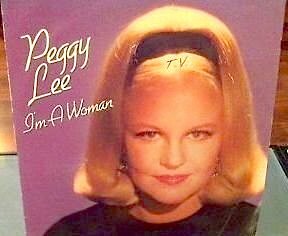 With thanks for all you've done, Peggy Lee." 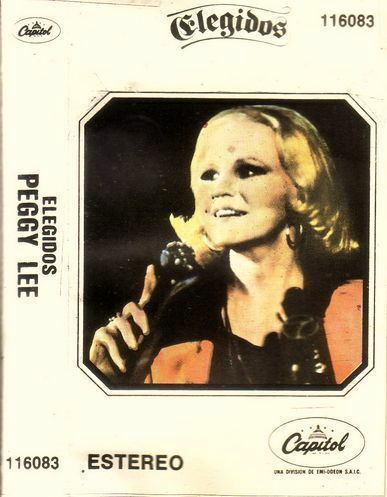 The Raindrops reissue from Capitol Special Markets does not include this card. 3. Capitol Creative Products' premium album Raindrops came with this insert, too. 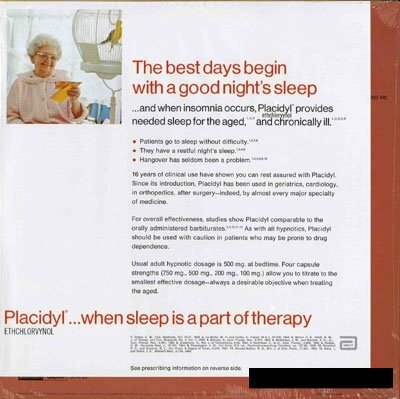 It advertises Placidyl, a sleeping pill manufactured by Abbott Laboratories. Copies of the album were actually sent by Abbott to its clients, as a promotional tie-in. 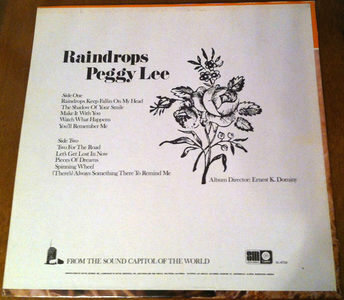 The Capitol Special Markets reissue of Raindrops does not contain this insert. 4. Back cover of the Capitol Creative Products LP. 6-8. 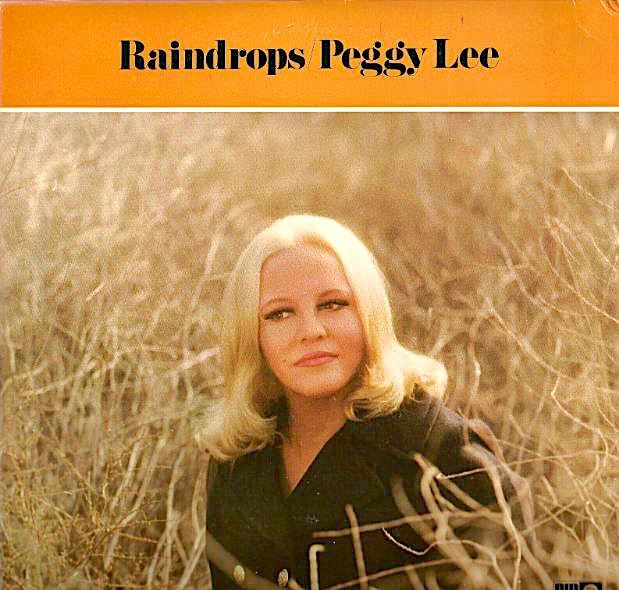 Title: Raindrops / Format: LP & 8-track & CS / Label: Capitol Special Markets / Cat. Num. : Sl 6723 & 8xl 6723 & Smi 6723 / Rel. 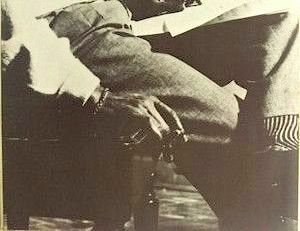 Year: 1971 / Tracks: 10 / Note: Reissue of the album discussed in entry #1. Not a premium album. 9-11. 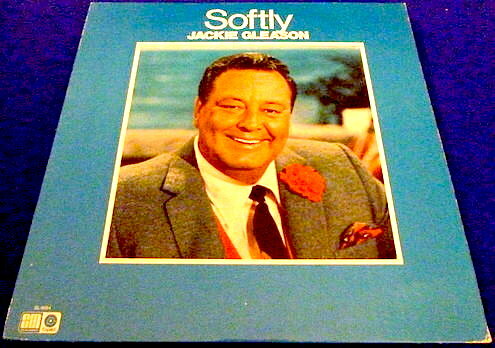 Capitol Creative Products also prepared a Jackie Gleason album for Abbott Laboratories. 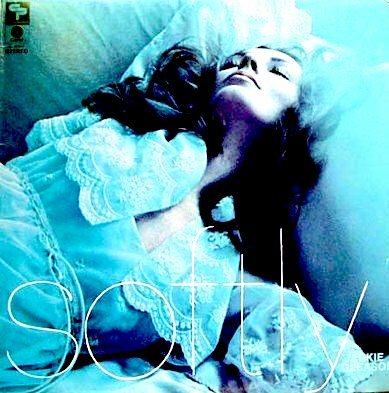 Titled Softly (Sl-6664) and given a 1970 date in online discographies, it shares numerous similarities with Raindrops. 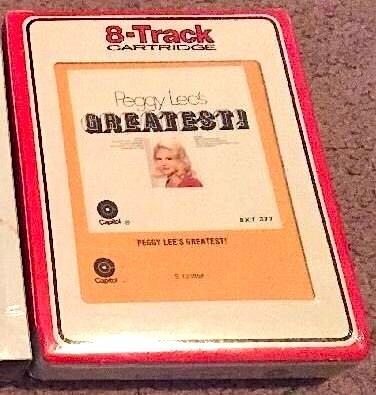 Among them: the fact that Capitol Special Markets reissued it later on both LP and 8-track cartridge. 12-14. 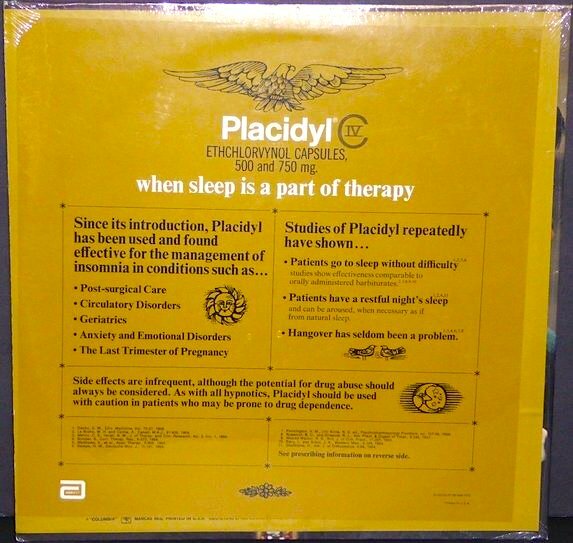 More albums commissioned by Abbott Laboratories on behalf of Placidyl. These were prepared by record labels other than Capitol. 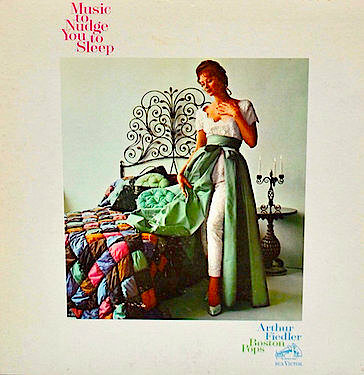 Back in 1963, RCA Victor released Music To Nudge You To Sleep, an anthology of numbers by Arthur Fiedler And The Boston Pops Orchestra. 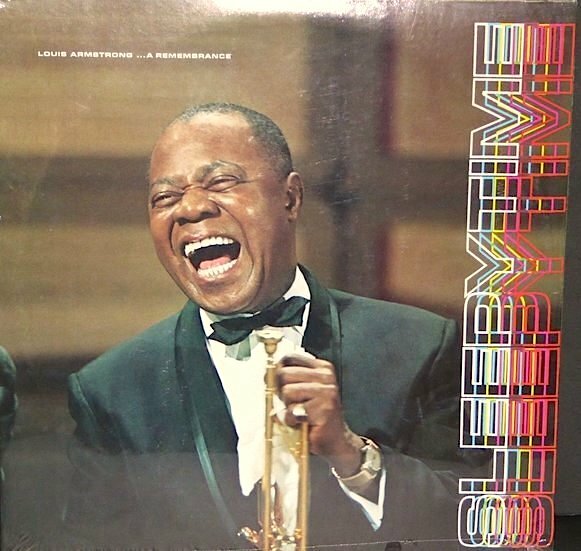 Louis Armstrong's Sleepytime; A Remembrance was put together by Columbia Special Products in 1972. 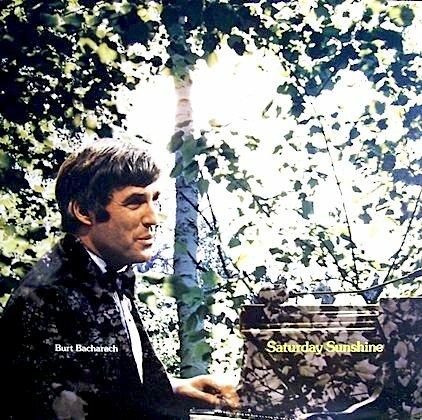 Burt Bacharach's Saturday Sunshine came out on Kapp Records in 1973. 1 - 3. 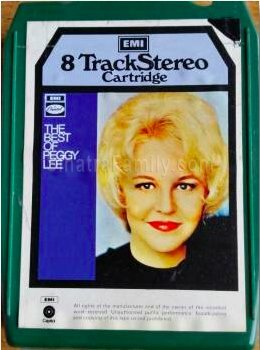 Title: The Very Best Of Peggy Lee ("Very Best" Series) / Format: 8-Track & CS & LP / Label: EMI / Cat. Num. : (United Kingdom) 8x 23168 & Tc 23168 & St 23168 (also 062.81537) / Rel. 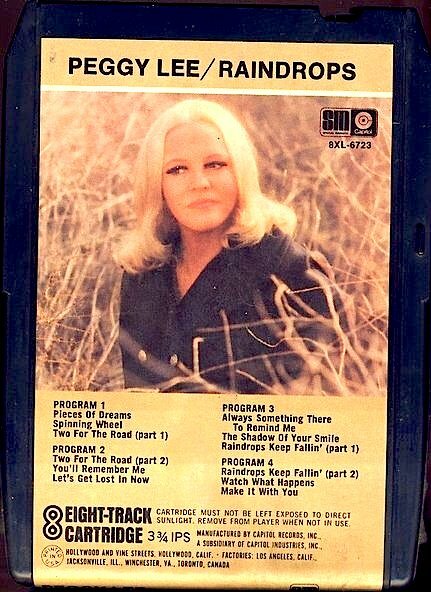 Year: 1973 / Tracks: 16 / Note: Image #3 offers a more expansive view of the cassette tape shown in the first image. The LP is on display on Image #2. 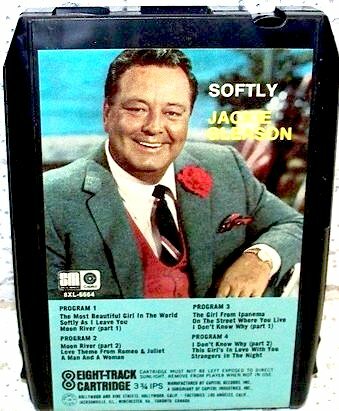 To see the 8-track configuration, check image #7 below. 4 - 6. Same issue discussed in entries 1 to 3 above, in various configurations. 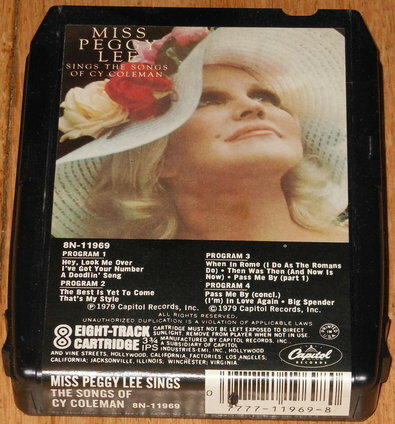 The first image shows its 8-track cartridge. 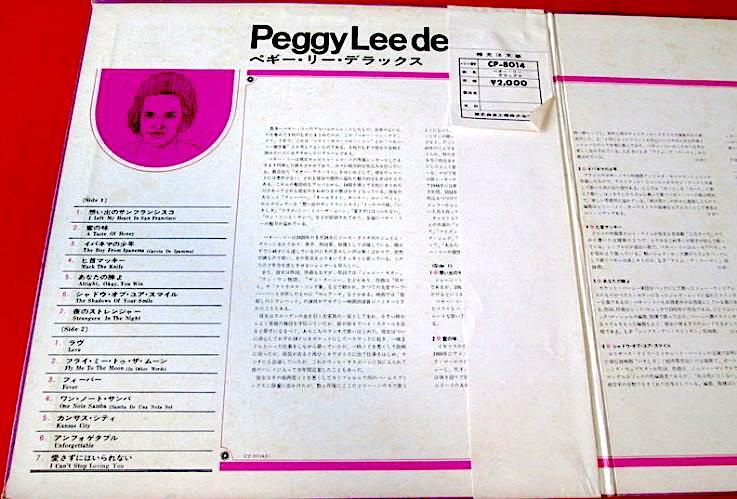 The second image spotlights the Japanese edition of the cassette, numbered Imd 1614 and containing the same 16 tracks. 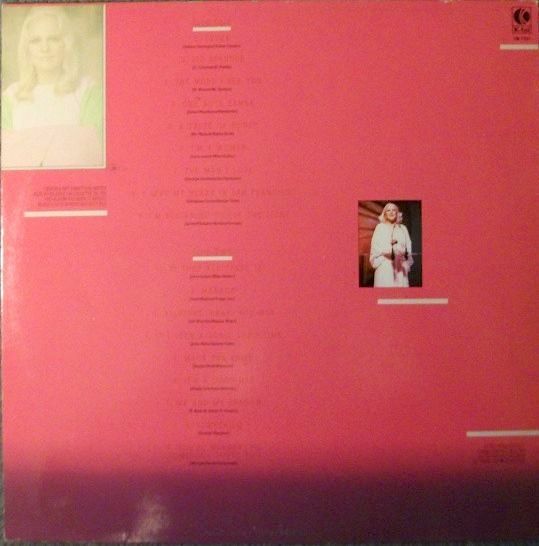 On display in the third image is the back cover of the LP, whose front cover is shown in image #2 above. 7 - 9. 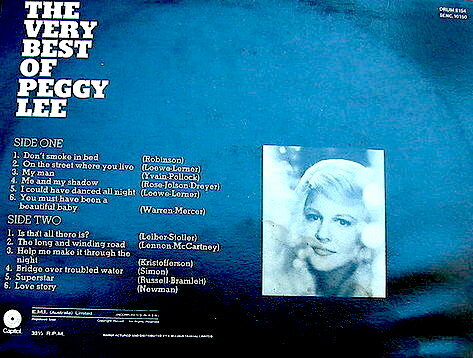 Title: The Very Best Of Peggy Lee / Format: LP & CS & / Label: EMI / Cat. Num. : (Australia) Senc 10150 & TcSenc 10150; also Drum 8154 & Drum TcSenc 8154 ) / Rel. 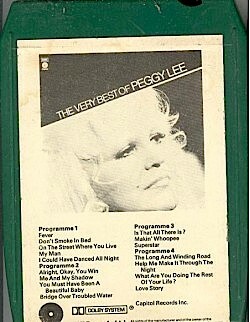 Years: 1974 / Tracks: 12 / Note: Australian edition of item #1, with different artwork and an abbreviated track listing. The album has actually been issued twice in Australia. Image #7 shows the first Australian LP edition. Images #8 and #9 show the reissue edition, which was part of the Drum series, and which came out on both LP and cassette. 1. 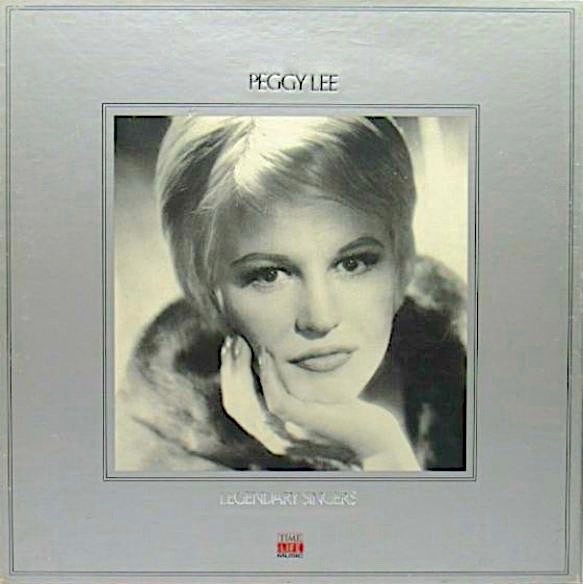 Title: Peggy Lee On Silver Screen / Format: LP / Label: Capitol / Cat. Num. : (Japan) Ecp 80797 / Rel. Year: 1973 / Tracks: 12 / Note: This is a collection of songs that are, for the most part, connected to movie soundtracks. 1 & 2. 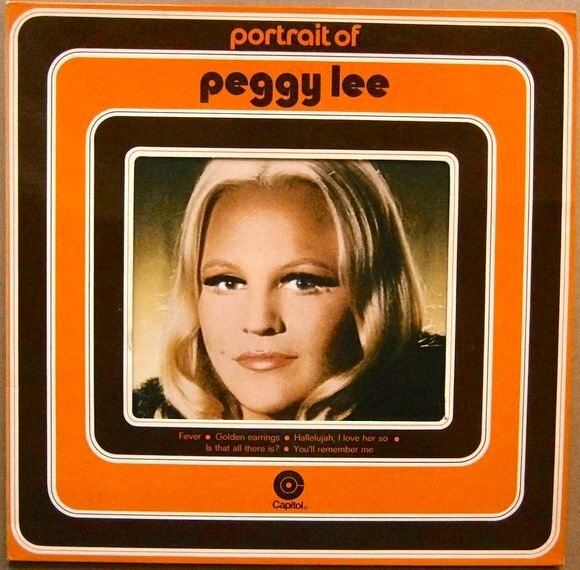 Title: Portrait Of Peggy Lee / Format: LP / Label: EMI Bovema / Cat. Num. : (Netherlands) 5c 056 80836 / Rel. Year: 1973 / Tracks: 14 / The release date applies to the first item only. The LP seen in the second picture seems to be a reissue, date unknown. The catalogue number is the same for both items. 3. Another view of item #1. 4. 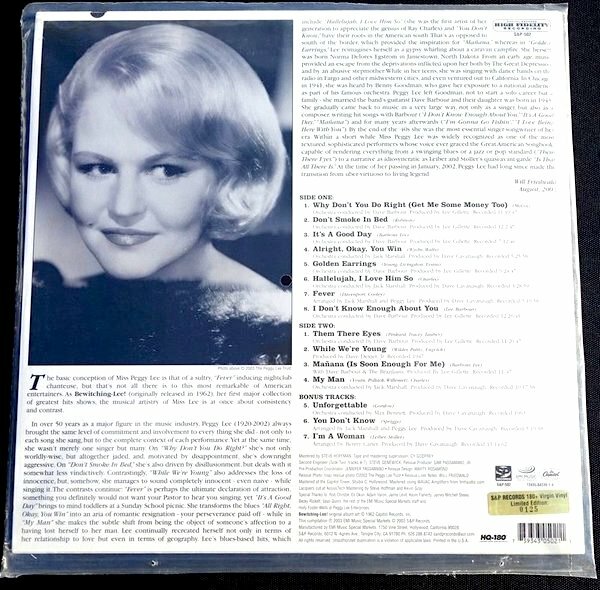 Title: The Peggy Lee Collection / Format: LP / Label: EMI Bovema / Cat. Num. : (Netherlands) 5c 056 80836 / Rel. Year: ca. 1975 / Tracks: 14 / Note: Reissue of item #1. Same tracks, same catalogue number; different front cover, different title. 5. 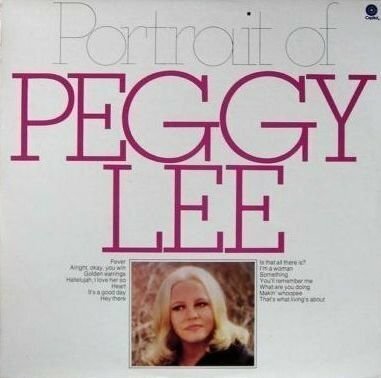 Title: Portrait Of Peggy Lee / Format: LP / Label: Capitol / Cat. Num. : (Australia) Senc 10063 / Rel. 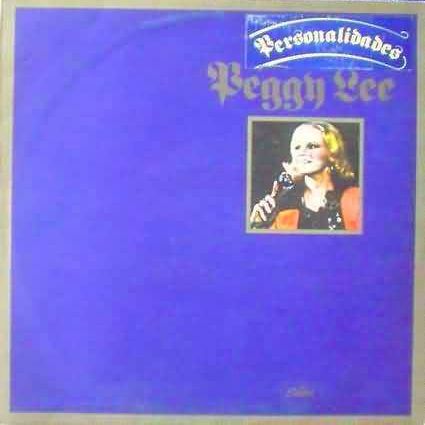 Year: 1973 / Tracks: 14 / Note: Australian edition of the 1973 Dutch LP. Same tracks, same title; different catalogue number, different front cover. 1. 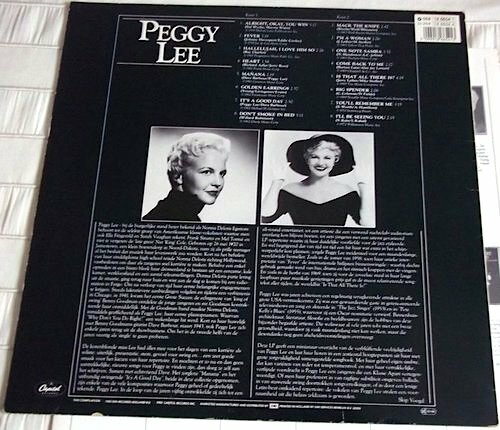 Title: Peggy Lee ("Archives of Folk & Jazz Music" Series) / Format: LP / Label: Everest / Cat. Num. : Fs 294 / Rel. Year: 1974 / Tracks: 9 / Although it does not identify itself as such, this Everest LP is actually a reissue of the album I've Got The World On A String (second image above), originally released on Pickwick Records. For further specifics, see section VII above. 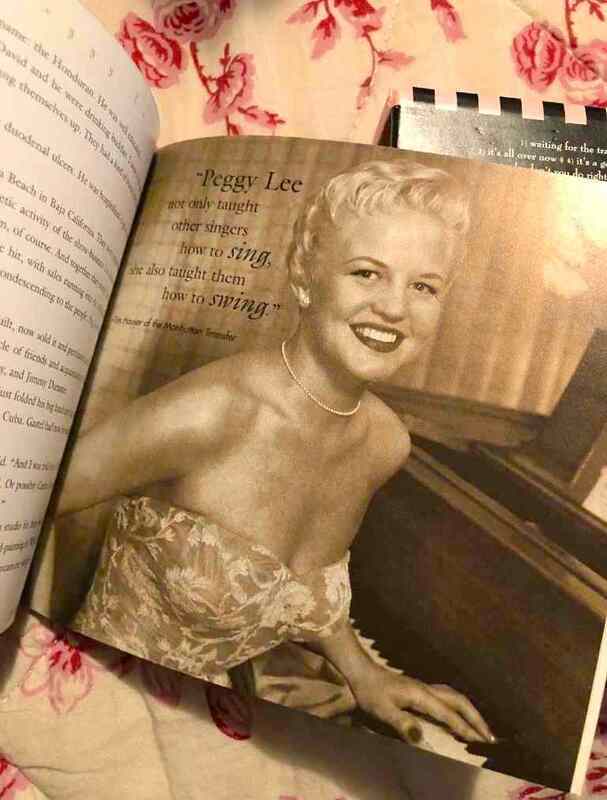 For illustration purposes, I have included pictures of not only Peggy Lee's but also Nat King Cole's volume in the series. These are apparently gatefold albums, with a photo of each artist covering the inner covers, and thus doubling as a poster. The Cole and Lee posters can be seen right above. Two of the volumes (Cole, Louis Prima) were also released on cassette tape. 1. 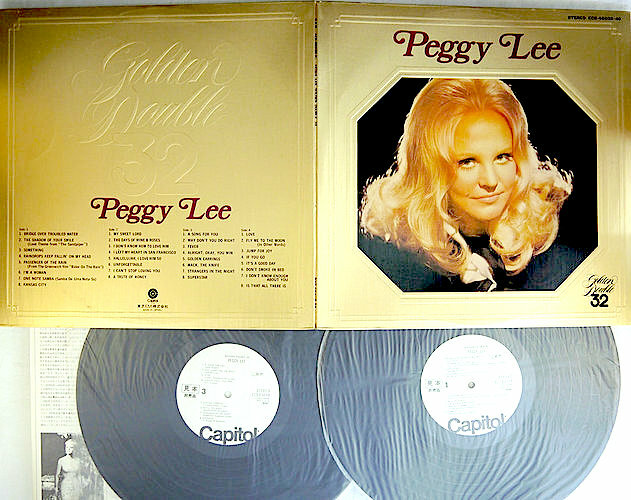 Title: Peggy Lee ("Golden Double 32" Series) / Format: LP / Label: Capitol / Cat. Num. : (Japan) Ecs 65039 - 65040 / Rel. Year: 1976 / Pieces: 2 / Tracks: 32 / Note: Gatefold album that includes a 6-page booklet, containing mostly lyrics. 1. 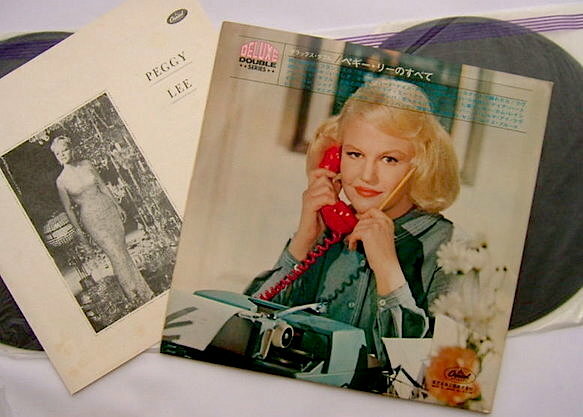 Title: Peggy Lee ("Best 20" Series) / Format: LP / Label: Toshiba EMI / Cat. Num. : (Japan) Ecs 90049 / Rel. Year: 1976 / Tracks: 20 / Note: This LP should not be confused with a 1988 CD (shown below) that bears the same title but contains different tracks. 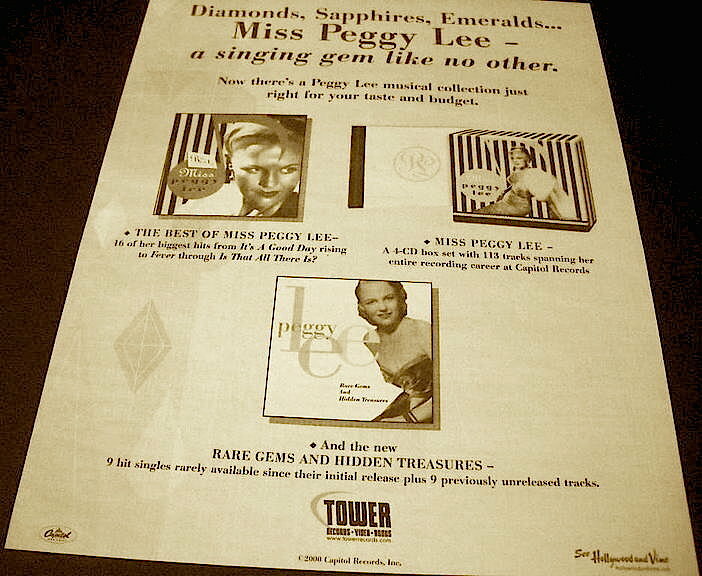 The second of the above-shown images spotlights the booklet or insert that came with the LP. 1 & 2. 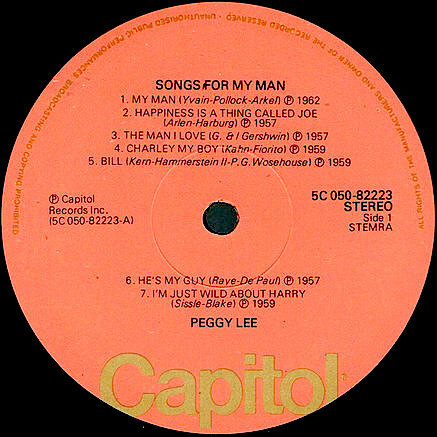 Title: Songs For My Man / Format: CS & LP / Label: EMI / Cat. Num. 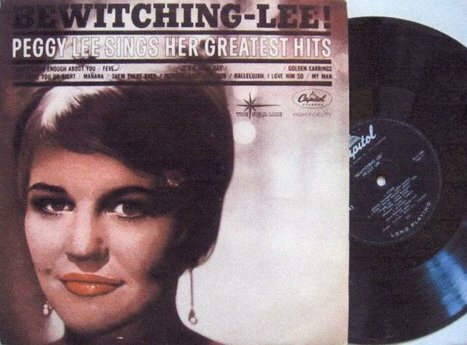 : (Netherlands) 5c 050.82223 & (United Kingdom) Caps 1006 ; also reissued by EMI as Vine 1020 / Rel. Year: 1977 / Tracks: 14 / Note: These British and Dutch pressings feature the exact same tracks. Their respective front covers are identical, too. Shown here is a British copy, front (#2) and back (#1). 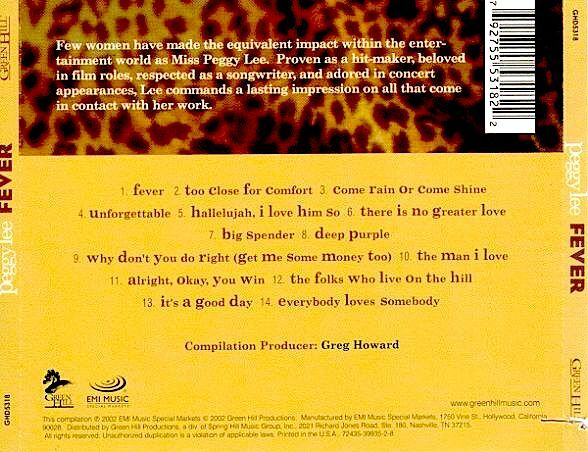 Songs For My Man is a stereophonic album, but three of its tracks come from an album that received only a monophonic release (The Man I Love). Hence those three tracks are presented here in electronically re-channeled variants. 3. 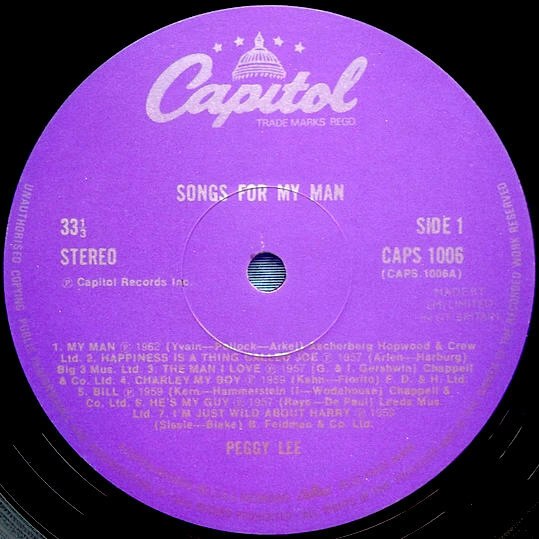 Title: Songs For My Man / Format: CS & LP / Label: Axis / Cat. Num. : (Australia) Tc.Axis 6329 & Axis 6329 / Rel. Year: 1977 / Tracks: 14 / Note: A third edition of the item under discussion. EMI issued this particular edition on Axis, its Australian sub-label. 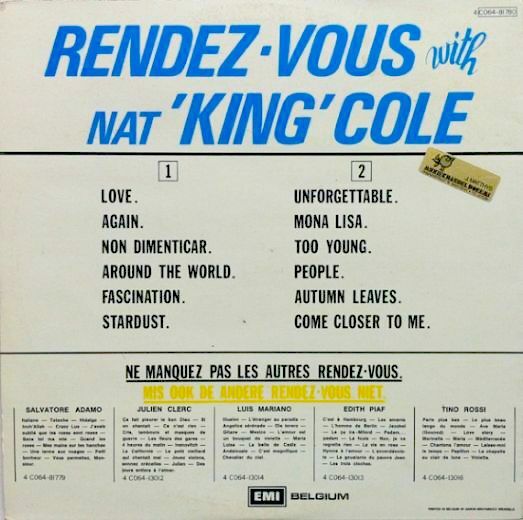 Both its artwork and notes (on the back cover, not pictured) are identical to those found on the European editions. Differences are circumscribed to the logos and data which identifies it as an Axis issue. As for the cassette editions of Songs For My Man, I have yet to seen physical copies or photos of any of them, but they can be safely assumed to feature the same artwork as the LP editions. 4-6. 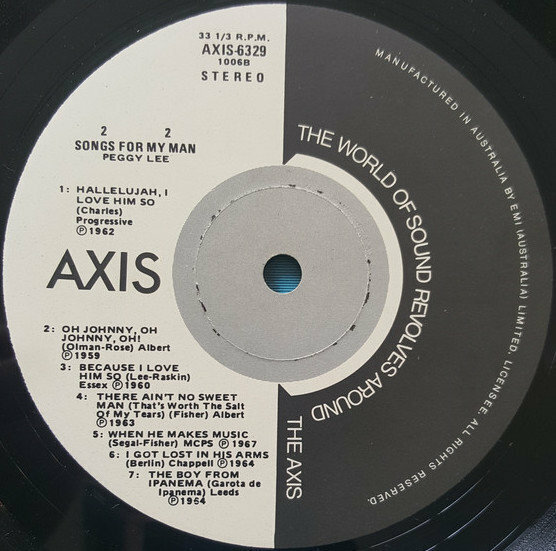 Title: Songs For My Man / Format: LP / Note: These three images showcases the physical label of each of the aforementioned vinyl editions, beginning with the British and ending with the Australian pressing. The Dutch edition occupies the middle position. 1 - 3. 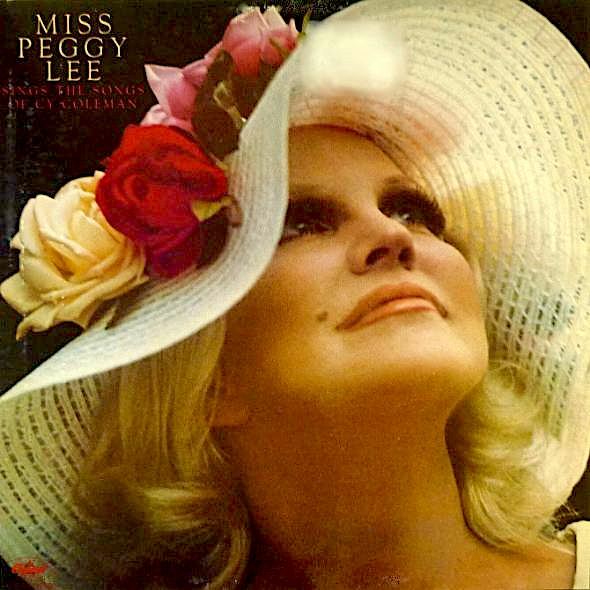 Title: Miss Peggy Lee Sings The Songs Of Cy Coleman / Format: Cs & LP & 8-Track / Label: Capitol / Cat. Num. : 4n 16140 & Sn 11969 (reissued as Sn 16140) & 8n 11969 / Rel. 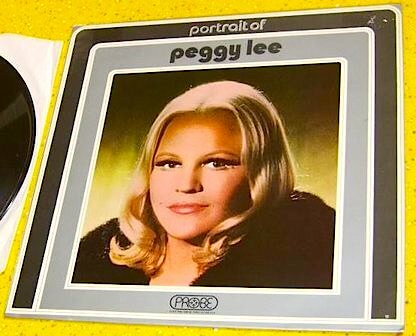 Year: 1979 / Tracks: 10 / Note: At the original time of its release, this Capitol album might have misled customers into believing that Peggy Lee had recorded a new album for Capitol. 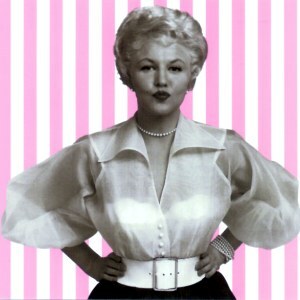 It is instead an anthology of material that she had recorded while she was still signed to the company. 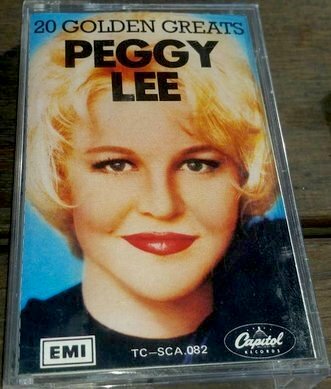 When Miss Peggy Lee Sings The Songs Of Cy Coleman was issued, seven years had elapsed since Lee and the label had parted company. 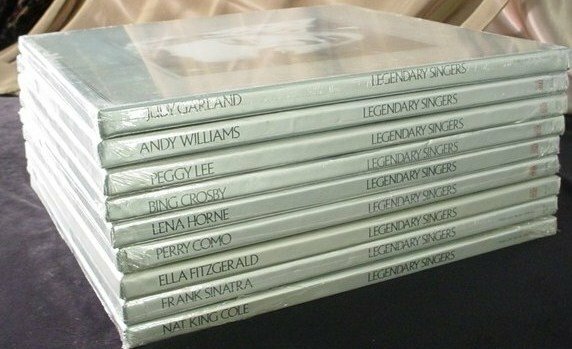 As for the 10 tracks included, all of them were recorded between 1961 to 1965. 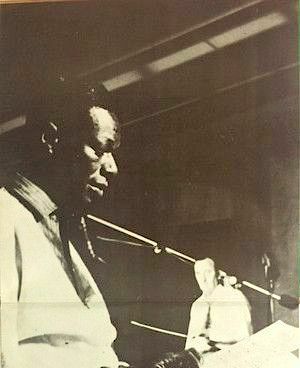 (Lee recorded 4 additional Coleman compositions for Capitol. 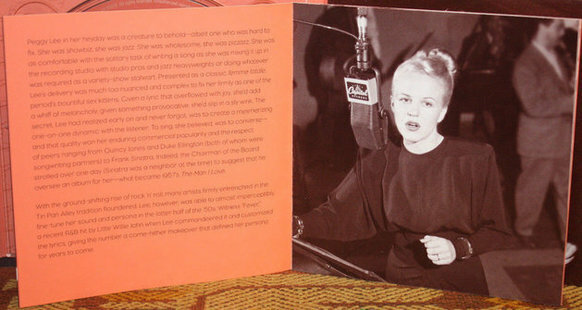 She sang more Coleman compositions in her concerts, too.) Notice that the above-shown cassette and 8-track copies bear different catalogue numbers. My LP copy bears catalogue number Sn 16140 and calls itself "a Capitol re-issue." It thus seems that this album was originally issued under number 11969 in at least two of these three formats, and reissued as 16140, again in a minimum of two formats (or possibly all three, but I have no corroboration). 1 & 2. 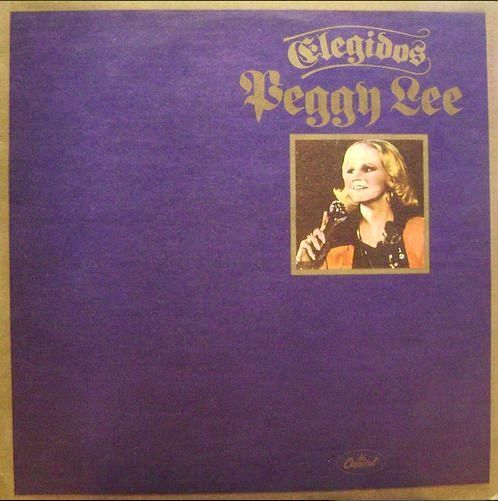 Title: Peggy Lee ("Elegidos/Personalidades" Series) / Format: CS & LP / Label: Capitol / Cat. Num. : (Argentina) 116083 [CS] & 106083 [LP] / Rel. 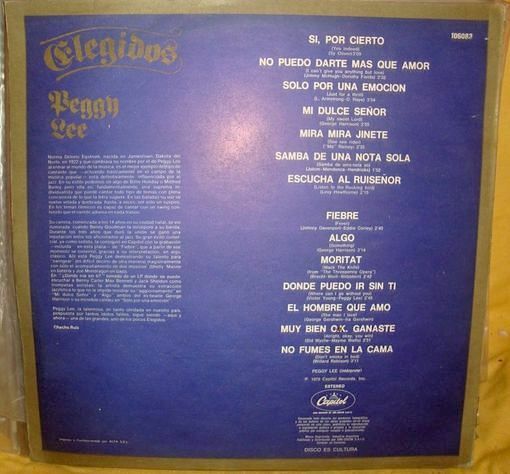 Year: 1979 / Tracks: 14 / Note: If online sellers are to be trusted, these two Argentinian LP releases (Elegidos, Personalidades) were issued in the same year and contain the exact same tracks. 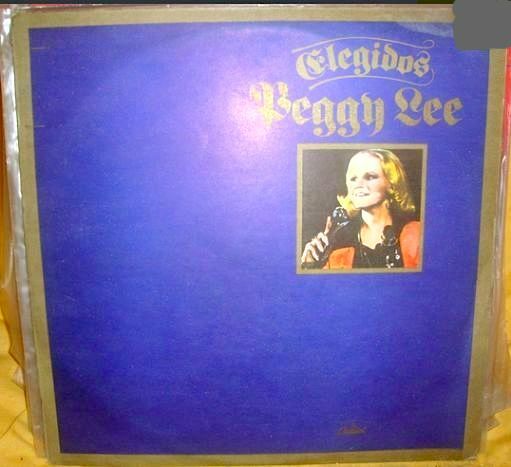 So far, I have been able to locate the track listing and release year for Elegidos only. Another conceivable possibility would be that the series met with legal objections (or complaints from another label), on account of its name of choice. In that scenario, Capitol would have released just a few album copies with the problematic name, before shifting to the more acceptable one. 1. 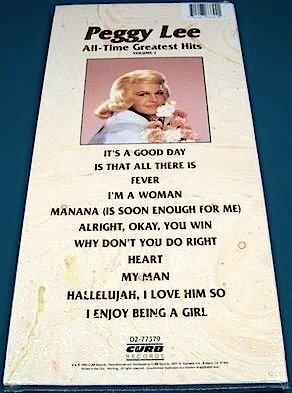 Title: I'm A Woman / Format: 8-Track & LP / Label: Cema Special Markets / Cat. Num. : 8xl 8298 & Sl 8298 / Rel. Year: 1982 / Tracks: 20 / Note: Prepared by Cema Special Markets for the Columbia House record club. XXIV. 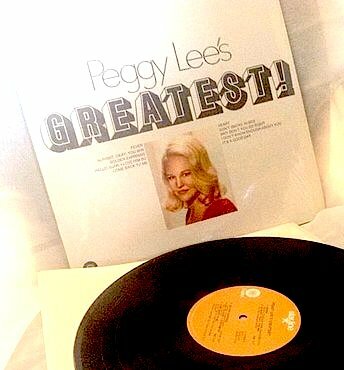 1982: PEGGY LEE'S GREATEST! 1 & 2. 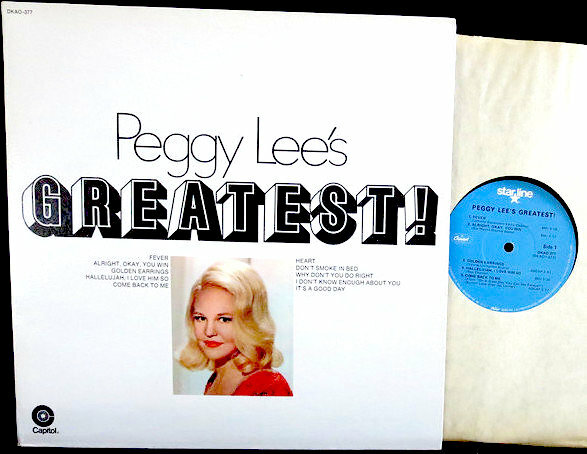 Title: Peggy Lee's Greatest! / Format: LP / Label: Capitol - Gramophone Company Of India / Cat. Num. : (India) St 27528 / Rel. 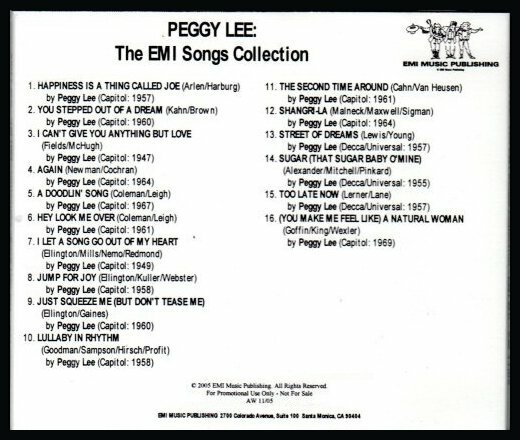 Year: 1982 / Tracks: 16 / Note: In addition to the expected hit numbers ("Fever," "Mañana," "I'm A Woman"), this Indian compilation includes various selections that were seldom included in Lee's compilations of the LP era ("One Note Samba," "Something Stupid," "A Taste Of Honey"). 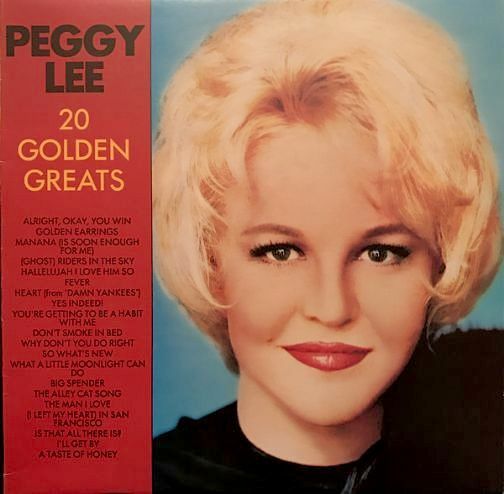 All but a couple tracks date from the 1963-1969 period, including no less than six tracks taken from the album I'm A Woman ("Little Boat," "You're Nobody Till Somebody Loves You," "I Left My Heart In San Francisco," "Mack The Knife," "A Taste Of Honey" and the title cut). 1 - 4. 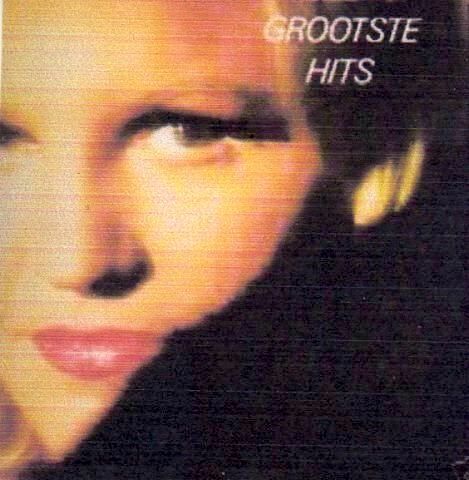 Title: Grootste Hits (Wereld Sterren) (Nostalgie Kollektie Series) / Format: LP / Label: EMI Bovema / Cat. Num. : (Netherlands) 1A 064 86654 / Rel. Year: 1983 / Tracks: 16 / Note: A comparison of the first and third images above leads to the conclusion that this LP was reissued at least once. Only one of the front covers in these two images features the words "wereld sterren" and "nostalgia kollektie." 1. 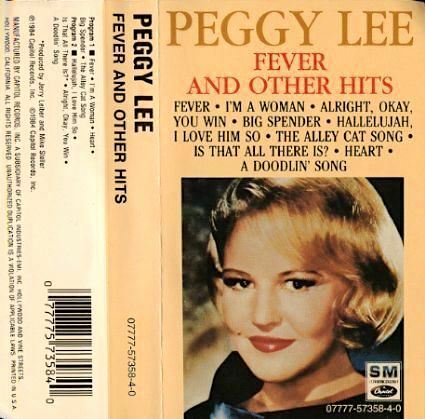 Title: Fever & Other Hits ("10 Best" Series) / Format: CD / Label: Cema Special Markets / Cat. Num. : Cdl 57358 / Rel. Year: 1990 / Tracks: 10 / Note: This is Cema's CD reissue of a budget compilation that Capitol had originally issued in 1984. Back then, the configuration of choice had been cassette tape; see pictures in the row below. 2. Title: Fever & Other Hits ("10 Best" Series) / Format: CD / Label: Cema Special Markets / Cat. Num. : Cdp 7 243 8 36258 2 6 / Rel. Year: 1990 / Tracks: 10 / Note: A lightly reconfigured version of the CD under discussion. It is curious to see the use of an entirely different catalogue number (presumably, Capitol-EMI's internal number for the issue, as opposed to Cema's own). 3. 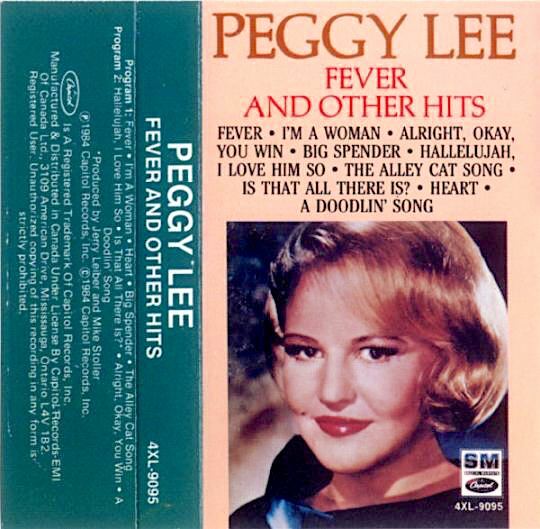 Title: Fever & Other Hits ("10 Best" Series) / Format: CD / Label: Cema Special Markets / Cat. Num. : (Canada) 07777 57358 2 6 (also Cdl 57358) / Rel. Year: 1990 (compact disc) / Tracks: 10 / Note: Yet another slightly reconfigured versions of the CD under discussion. This one identifies itself as Canadian. 4. 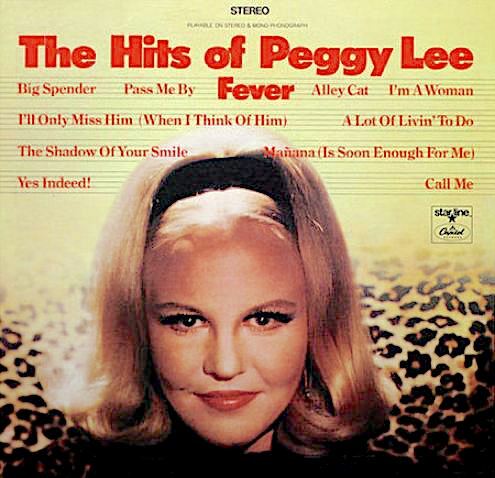 Title: Fever & Other Hits ("10 Best" Series) / Format: CS / Label: Capitol / Cat. Num. : 07777 57358 4 0 / Rel. Year: 1984 / Tracks: 10 / Note: Original issue of the item under discussion, which was reissued as a CD in 1990. 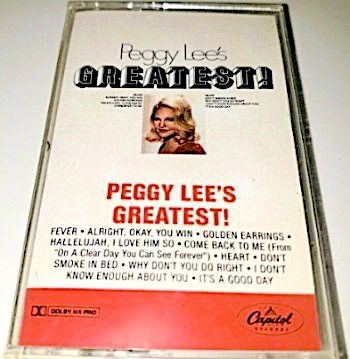 As can be seen, the graphics and style were changed from cassette to compact discCD, in part because the CD was incorporated to a series with its own distinctive artwork. By e xchanging a conjunction for an ampersand, the title of the issue underwent a tiny modification, too. 5. 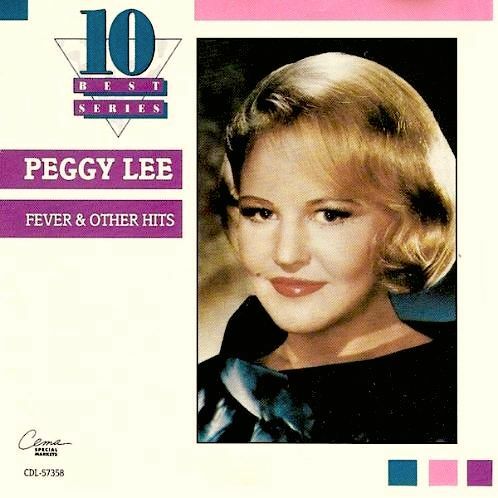 Title: Fever & Other Hits ("10 Best" Series) / Format: CS / Label: Capitol / Cat. Num. : (Canada) 4xl 9095 / Rel. Year: 1984 / Tracks: 10 / Note: Canadian version of the original issue. 6. 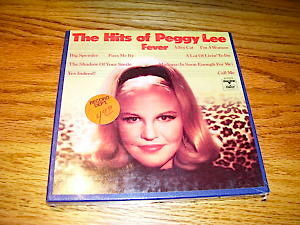 Title: Fever & Other Hits ("The Priceless Collection" Series) / Format: CS & CD / Label: Collectables / Cat. Num. : Col cd 9321 / Rel. Year: 2003 / Tracks: 10 / Note: Licensed CD reissue of the item under discussion. 1-2. 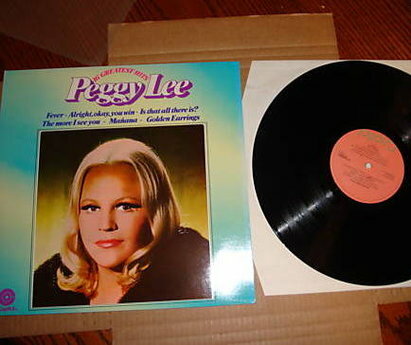 Title: Peggy Lee ("20 Golden Greats" Series) / Format: LP / Label: EMI / Cat. Num. : (Australia) Sca 082 / Rel. 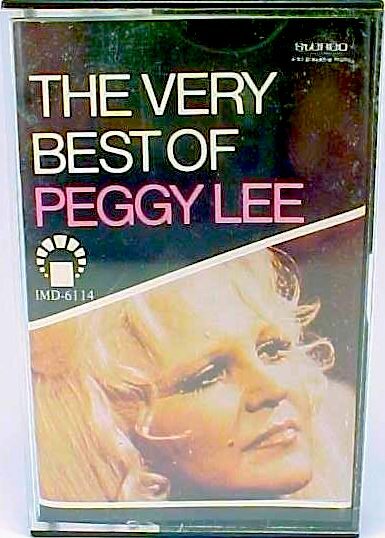 Year: 1984 / Tracks: 20 / Note: Included in this album were various interpretations that had hardly ever made it to Peggy Lee compilations from the LP era, and which yet deserved to be better known -- namely, "(Ghost) Riders In The Sky," "What A Little Moonlight Can Do," "The Man I Love," and "You're Getting To Be A Habit With Me." 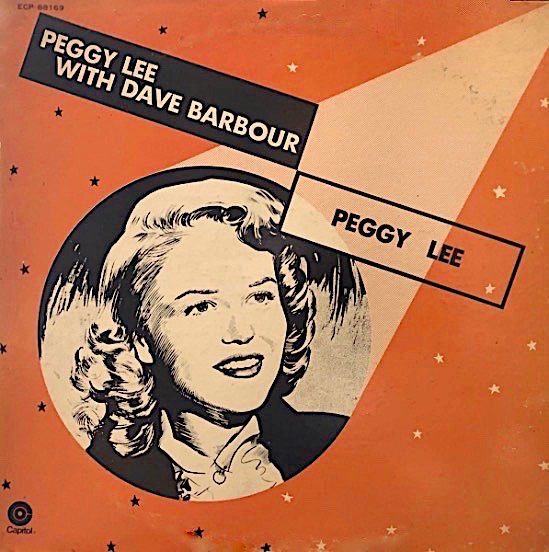 If we leave aside such worthwhile additions to the track program, however, this release turns out to be one more iteration of the 1968 British LP The Best Of Peggy Lee. 4. 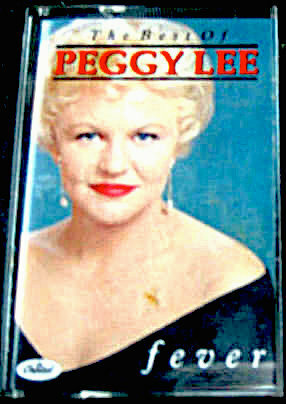 Title: Peggy Lee ("20 Golden Greats" Series) / Format: CD / Label: Emi / Cat. Num. : (Australia) Cdmid 166224 / Rel. Year: 1989 / Tracks: 20 / Note: As can be seen right above, the CD edition of this issue has the same title as the earlier LP edition, but partially different artwork, as well as a different catalogue number. 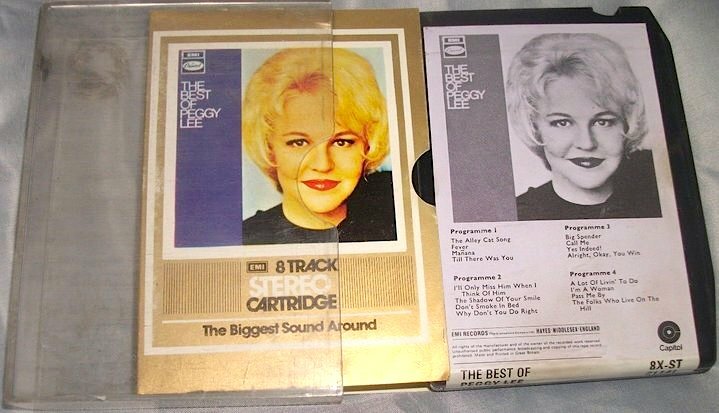 To reiterate, both CD and LP are essentially variations on the 1968 British anthology The Best Of Peggy Lee (section VI above). 1 - 3. 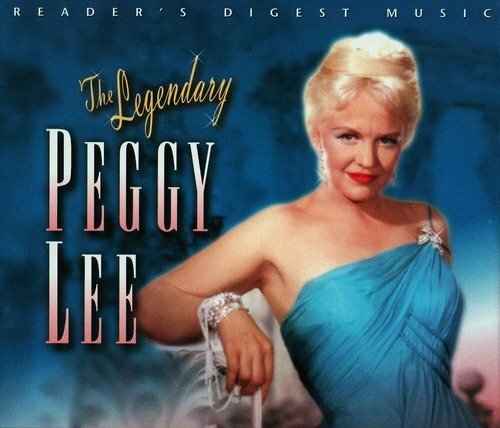 Title: Peggy Lee ("Legendary Singers" Series) / Format: CS & LP / Label: Time Life Music / Cat. Num. : 4 Lgd 07 & Slgd 07 / Rel. 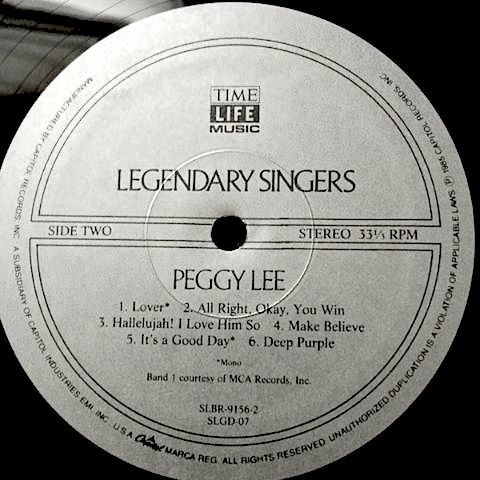 Year: 1985 / Discs: 2 [LP] / Tracks: 22 / Note: Boxed set, part of a worthwhile 'classic singers' series from Time-Life. 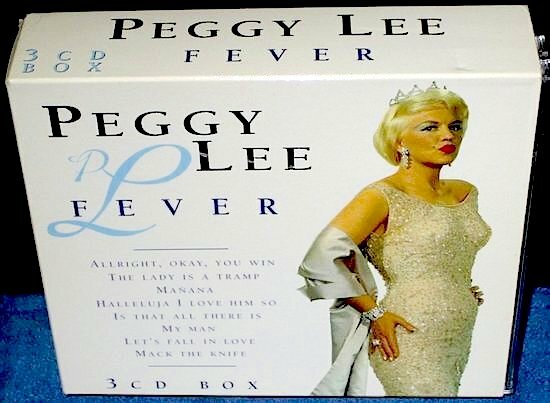 The first of the above-seen images shows the front cover of the Lee set, whereas the last presents the front cover of the set's informative booklet. More booklet pics can be seen below. 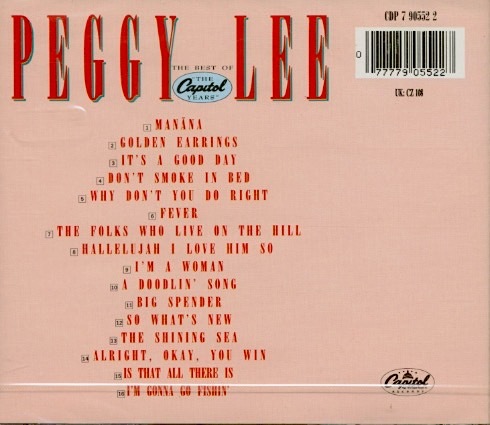 This set was the very first to release some worthwhile Lee performances that had hitherto remained buried in the vaults, two of them being on the side pictured below (tracks #4 and #6). 4 & 5. 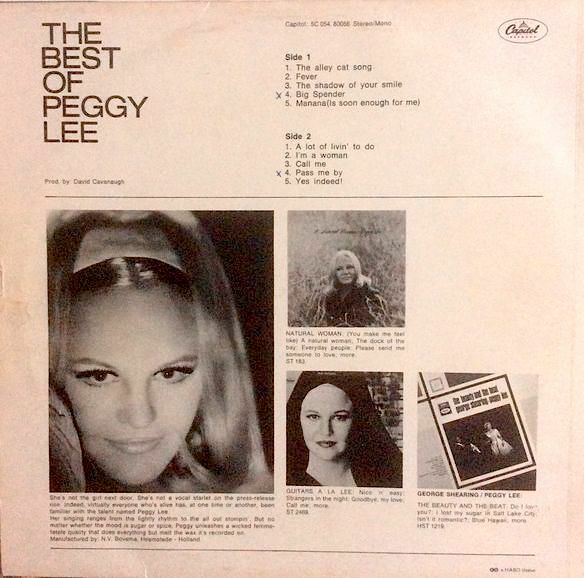 Title: The Best Of Peggy Lee / Format: LP & CS / Label: Axis / Cat. Num. : (Australia) 701739 & Tc 701739 4 / Rel. Year: 1988 / Tracks: 16 / Note: Axis was an EMI budget subsidiary. The year 1988 is a production date, and there is no other date on this reissue. It might have been actually released on a later year. 6. 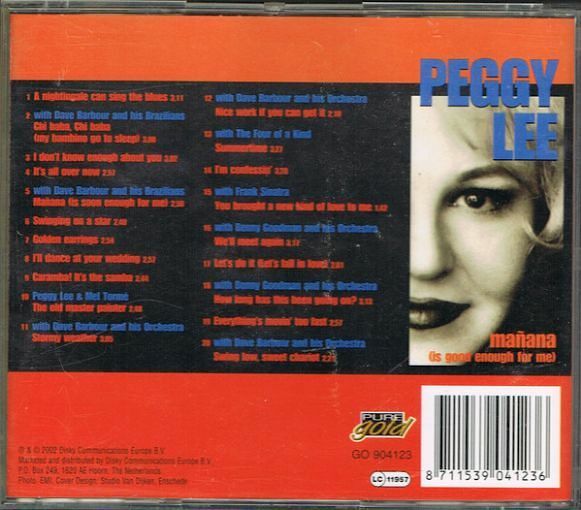 Front and back covers of the CD shown in image #3. Notice that this item contains not one but three identification numbers. In addition to Cdp 7 90552 2, there are the codes F Pm 516 and UK Cz 108. The F PM letters would seem to be a Pathe Marconi prefix, indicating distribution in France. Since the third id number is preceded by the letters "UK," I assume it to be a special code for British-distributed or British-manufactured discs. To further complicate matters, it should be added that copies of this EMI issue can also be found with a fourth number, 1294. 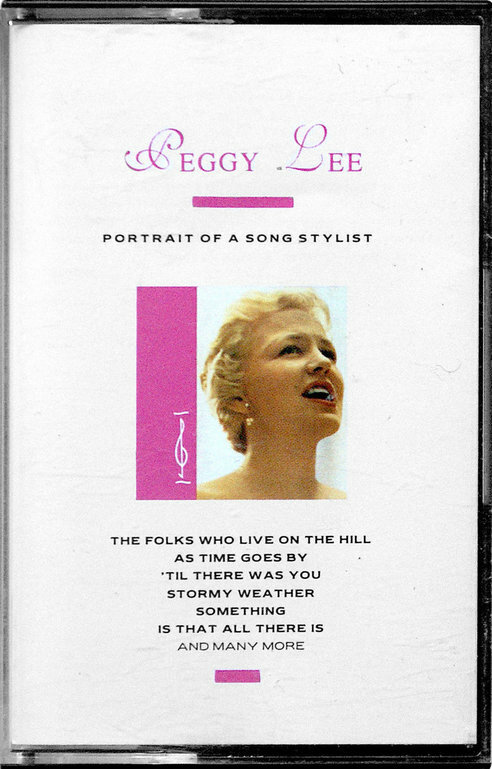 It can indeed be seen in the jacket of the cassette version (image #1), and I believe that it also appears in the back cover of the LP version (image #2). Music lists indicate that it is part of all three configurations, but my CD copy doesn't have it. 7. 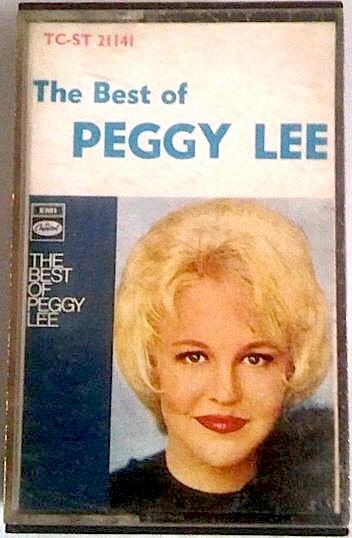 Title: The Best Of Peggy Lee / Format: CD Label: EMI Cat. Num. : (Australasia) 07777 905522 7 / Rel. Year: 2003 / Tracks: 16 / Note: This Autralasian issue uses the artwork originally found in some of the items discussed in section VI above (year 1968). However, its track listing is identical to the one found in the other items discussed in the present section. It may thus be considered the CD counterpart of the above-mentioned Australian LP and cassette (entries #4 & #5). 1 & 2. 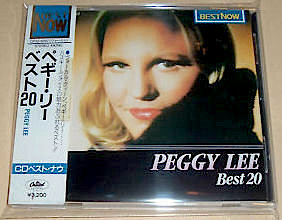 Title: Peggy Lee ("Best Now" - "Best 20" Series) / Format: CD / Label: Toshiba-EMI / Cat. Num. : (Japan) Cp 32 5298 / Rel. 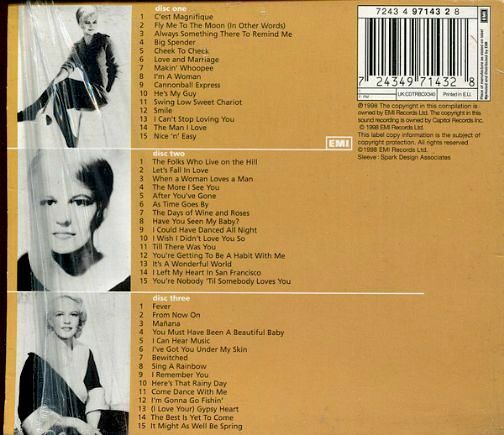 Year: 1988 / Tracks: 20 / Note: Shown herein are two photos of the same CD, and also its back cover. 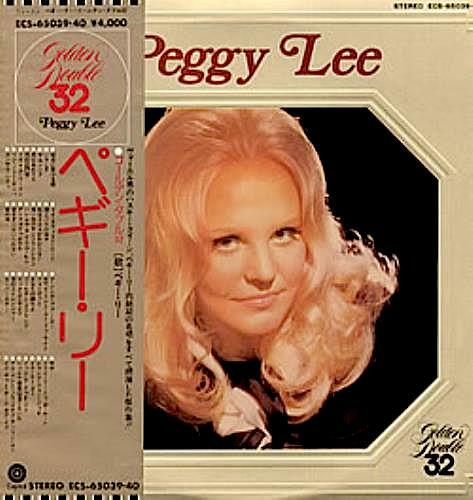 Please notice that there is also a 1976 Japanese LP that has the same front cover and bears the same title, Peggy Lee ("Best 20" Series). Despite such similarities, this CD and that LP (shown in its own separate entry above, year 1976) have different track listings. No more than five songs are common to both issues. 3 & 4. 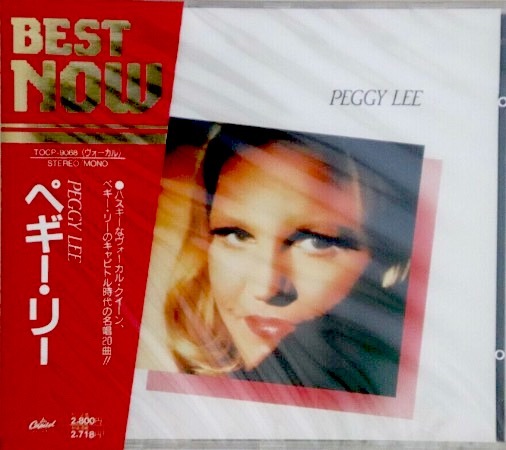 Title: Peggy Lee ("Best Now" Series) / Format: CD / Label: Toshiba-EMI / Cat. Num. : (Japan) Tocp 9068 / Rel. Year: 1990 / Tracks: 20 / Note: Reissue of the item seen in images #1 and #2. 1. 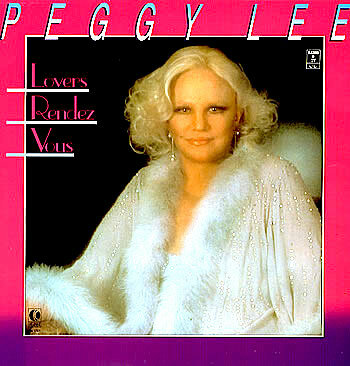 Title: Lovers' Rendezvous / Format: CS & LP / Label: K-Tel / Cat. Num. : (Netherlands) Tn 1722 & Tn 1721 / Rel. Year: 1988 / Tracks: 18 / Note: Licensed issue. 1 & 2. Title: Seductive / Format: CS & CD / Label: Pair / Cat. Num. : Pcdk 2 1194 & Pcd 2 1194 / Rel. Year: 1989 / Tracks: 16 / Note: Licensed issue. 1-5. Title: All-Time Greatest Hits, Volume 1 / Format: CD & CS / Label: Curb / Cat. Num. : D2 71518 77379 & D4 71518 77379 / Rel. Year: 1990 / Tracks: 11 / Note: Licensed issue. As can be seen above, Curb issued not only a regular CD version but also a longbox version. There is also a cassette edition, not shown here. In spite of the implications inherent to this item's title, no volume 2 was ever released. 1-2. 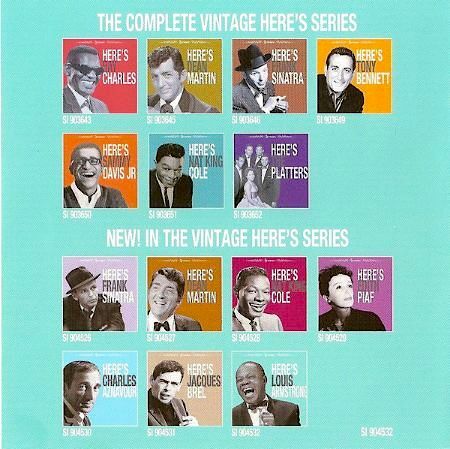 Title: The Early Years (Collectors Series, Volume 1) / Format: CS & CD / Label: Capitol / Cat. Num. : C4 5 93195 & Cdp 7 93195 / Rel. Year: 1990 / Tracks: 27 / Note: This issue identified itself as a volume one. The prospective second volume was released ten years, and it did not even identify itself as a sequel. It was given the title Rare Gems And Hidden Treasures. 3. 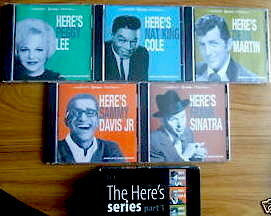 Title: The Early Years (Collectors Series & "Hits Songs For You" Series) / Format: CD / Label: Toshiba EMI / Cat. Num. : Tocp 7384 / Rel. Year: 1992 / Tracks: 27 / Note: Japanese edition of item #1. 4. 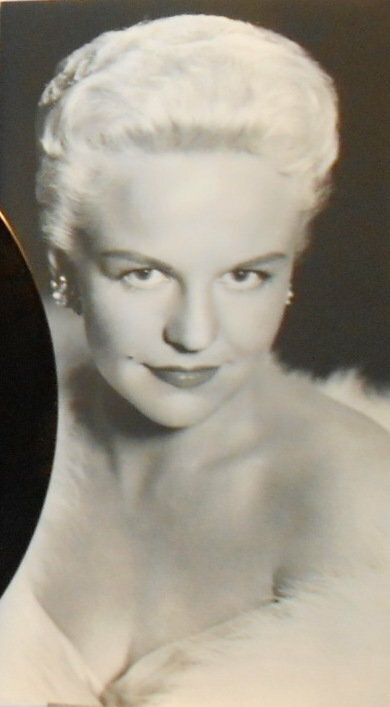 A Capitol publicity shot, taken at the same photographic session as the shot that graces the front cover of the CD under discussion. 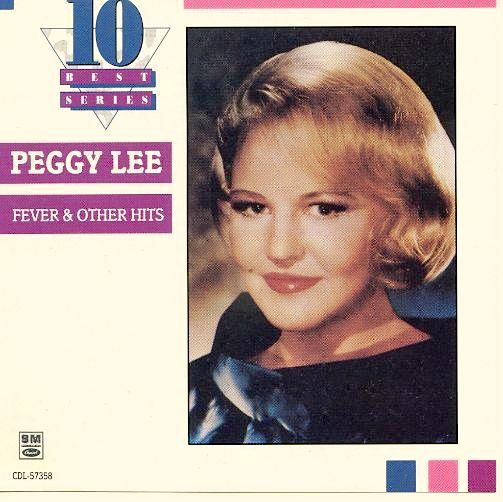 A third shot, showing a smiling Peggy, has circulated as well. 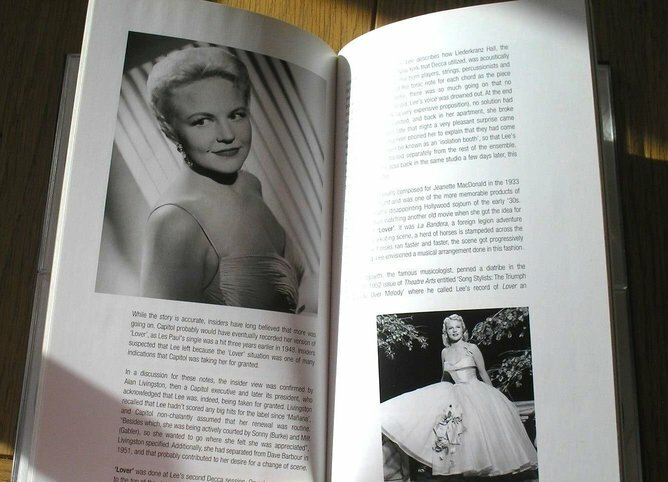 The latter was most notably used for a series of issues titled If I Could Be With You, whose respective front covers can be seen in this page (fourth row of images). 1. 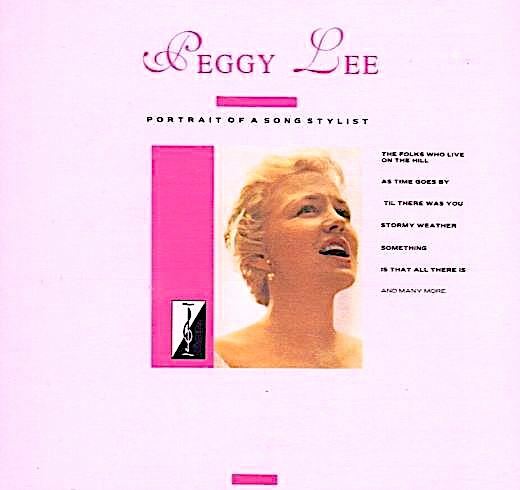 Title: Peggy Lee ("Portrait Of A Song Stylist" Series) / Format: CD & CS / Label: Harmony Collection / Cat. Num. : (United Kingdom) Har cd 116 & Har c 116 / Rel. Year: 1990 / Tracks: 14 / Note: Licensed issue. 1 & 2. 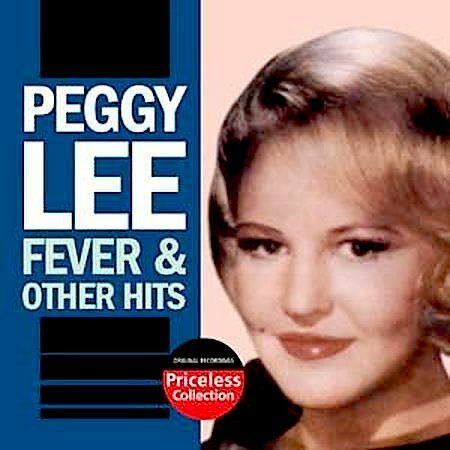 Title: Fever; The Best Of Peggy Lee / Format: CS & CD / Label: EMI / Cat. Num. : (United Kingdom) 72437 80361 2 8; also listed as CdFever 1 / Rel. Year: 1992 / Tracks: 24 / Note: Produced by Alan Dell. Very good sound quality. 1 & 2. Title: Classics / Format: CS & CD / Label: Curb / Cat. Num. : 0071518 77629 23 / Rel. Year: 1993 / Tracks: 10 / Note: Licensed issue. 1 - 3. 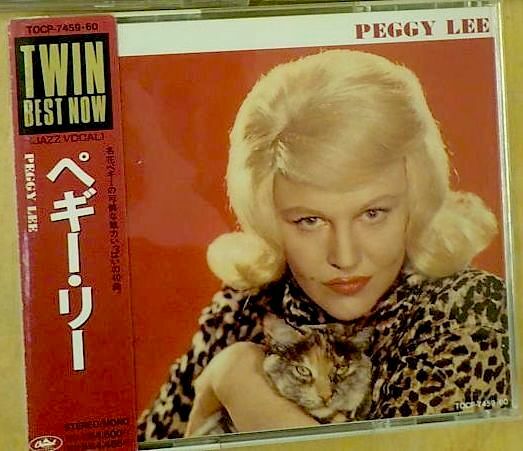 Title: The Beautiful Music Company Presents Peggy Lee / Format: CS & LP & CD / Label: Beautiful Music / Cat. Num. : Bmcs S12 56958& Bmclp S12 56958 & Bmc S12 56958 / Rel. Year: 1993 / Tracks: 24 / Note: Licensed issue. 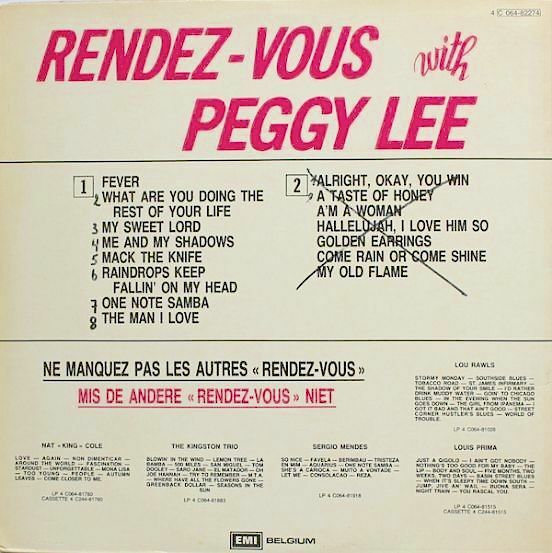 The full title is not printed in the cover, but it can be found in other parts of this release, one of them being the back cover. 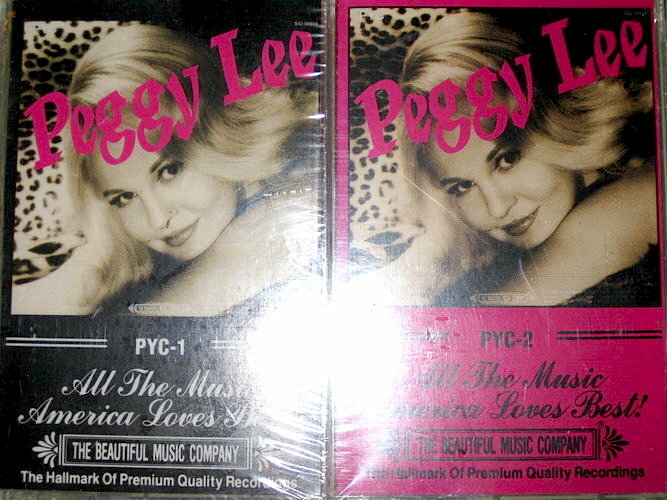 Issued as two cassettes (images #1 & #2), two LPs inside one album jacket (image #3), and one CD. 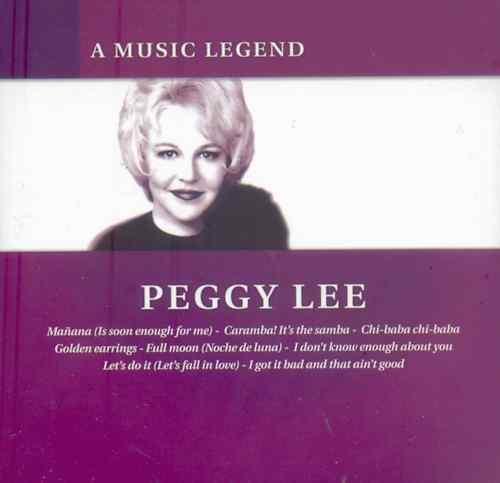 The sound recording copyright of The Beautiful Music Company Presents Peggy Lee is credited to CEMA Special Markets. Of the 24 tracks, nearly three fourths are Capitol masters. 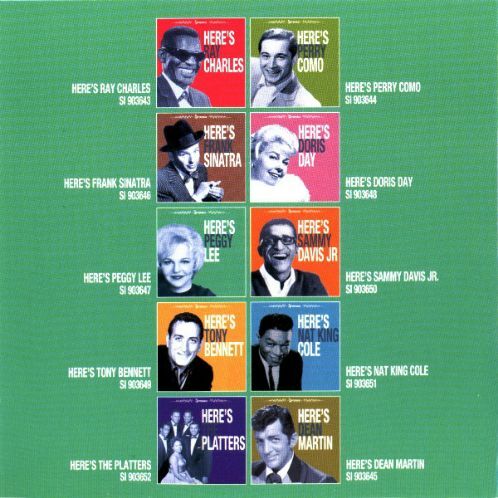 The other 7 are Decca masters, identified as being included through the "courtesy of MCA Records." 1-4. 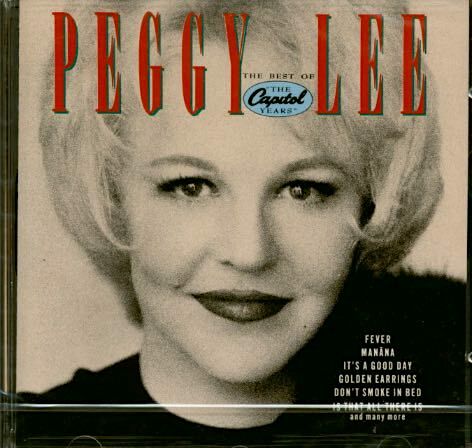 Title: Spotlight On... Peggy Lee ("Great Ladies And Gentlemen Of Song" Series) / Format: CS & CD / Label: Capitol / Cat. Num. : 7243 8 28533 4 3 / Rel. 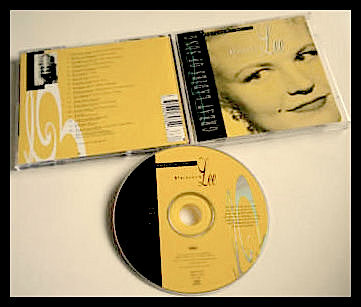 Year: 1995 / Tracks: 18 / Note: The first image shows the cassette, the other images the CD (including the back page of the CD's booklet, below). 1 & 2. 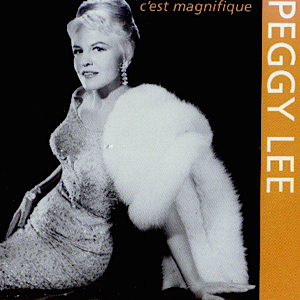 Title: The Very Best Of Peggy Lee / Format: CD & CS / Label: EMI - Music For Pleasure / Cat. Num. : (United Kingdom) 7243 8 56805 2 6; also Mfp 6342 / Rel. Year: 1997 / Note: Same tracks as item #3. 3 & 4. 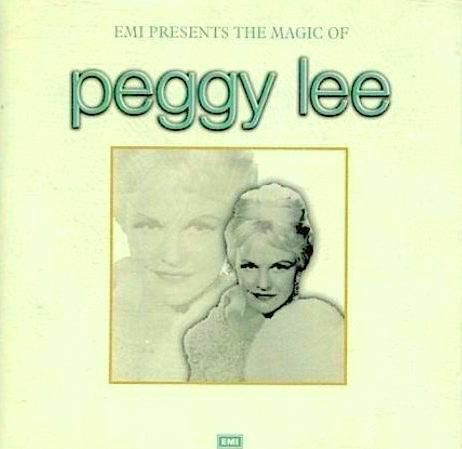 Title: EMI Presents The Magic Of Peggy Lee / Format: CD & CS / Label: EMI (also Music For Pleasure?) / Cat. Num. : (United Kingdom) 7243 8 57013 2 0 & 7243 8 57013 4 4; also Tcmpf 6371 & Mfp 6371 / Rel. Year: 1997 / Note: Exact same tracks as in items #1 & #2. 5 & 6. 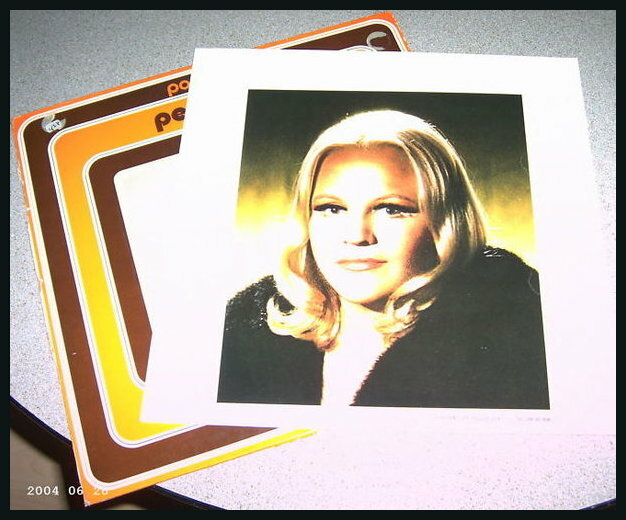 Title: EMI Presents The Magic Of Peggy Lee / Note: Shown below, more pictures of item #3. 1 & 2. 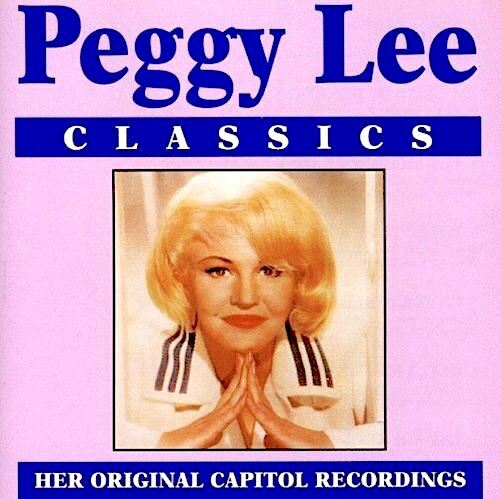 Title: Peggy Lee ("A Touch Of Class" Series) / Format: CD / Label: Disky / Cat. Num. : (Netherlands) Tc 862652 / Rel. Year: 1997 / Tracks: 16 / Note: The Dutch label Disky was affiliated to EMI; it primarily licensing from the major. 3. 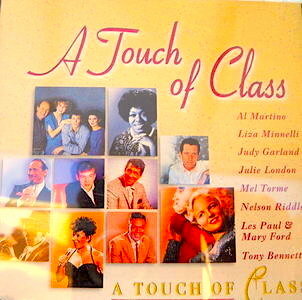 Title: A Touch Of Class / Format: CD / Label: Disky / Cat. Num. : (Netherlands) Tc 887112 / Rel. Year: 1998 / Tracks: 18 / Note: Series sampler. Each track featured a different artist. 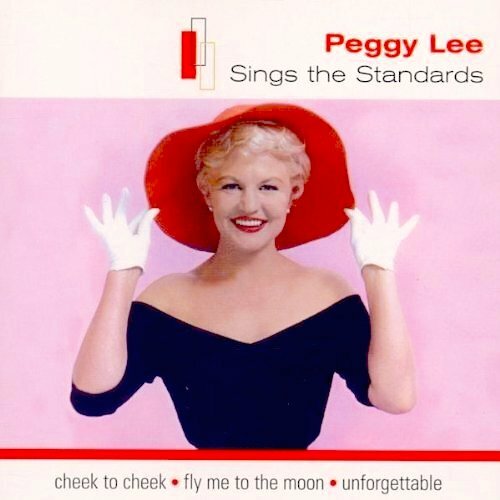 Peggy Lee's track is "The Lady Is A Tramp." 1 - 5. Title: Fever / Format: CD / Label: Disky / Cat. Num. : (Netherlands) Hr 883492 / Rel. Year: 1997 / Discs: 3 / Tracks: 42 / Note: Disky was affiliated to EMI. 1 & 2. 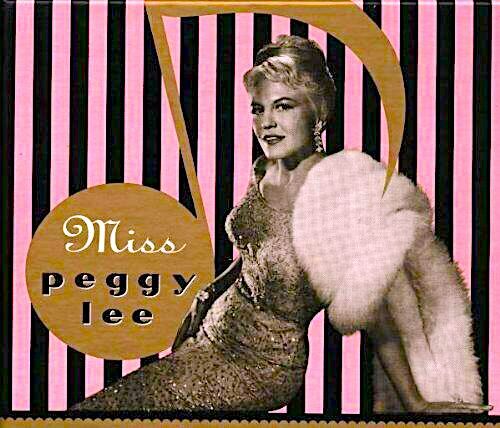 Title: Miss Peggy Lee / Format: CD / Label: Capitol / Cat. Num. : 0777 7 97826 2 8 (discs #97827, #97828, # 97829, #97830) / Rel. 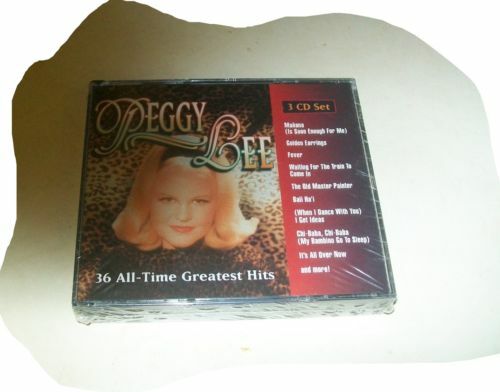 Year: 1998 / Discs: 4 / Tracks: 113 / Note: Image #2 shows the front cover of this set's cardboard box, while Image #1 displays the front cover of the jewel case that houses the CDs. 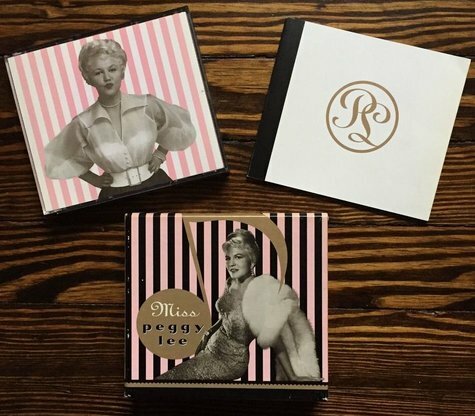 Image #3 showcases the fronts of the jewel case, the booklet, and the cardboard box. 3. Panoramic view of the boxed set under discussion. 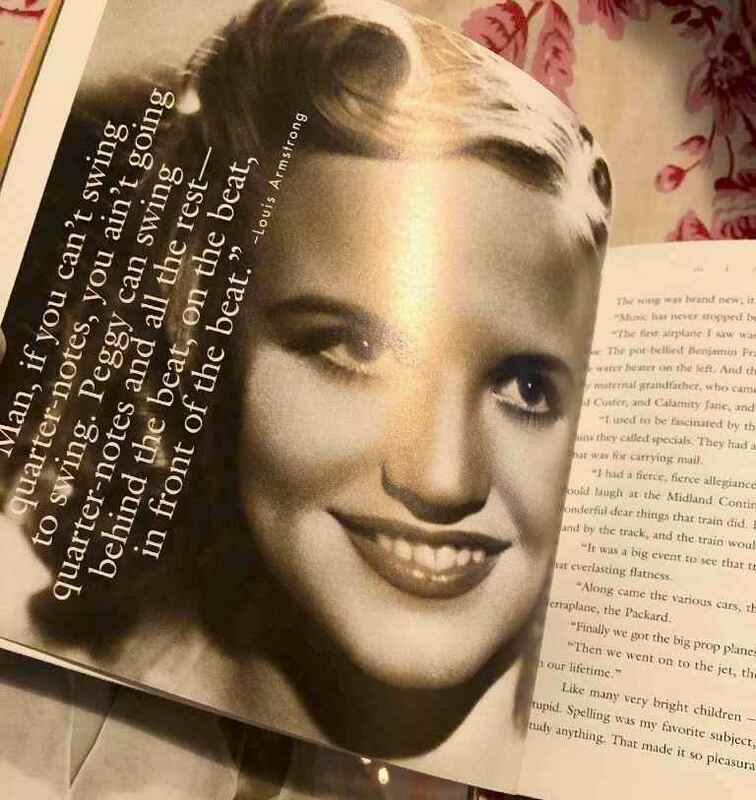 The second row of pictures highlight the set's booklet. 4. 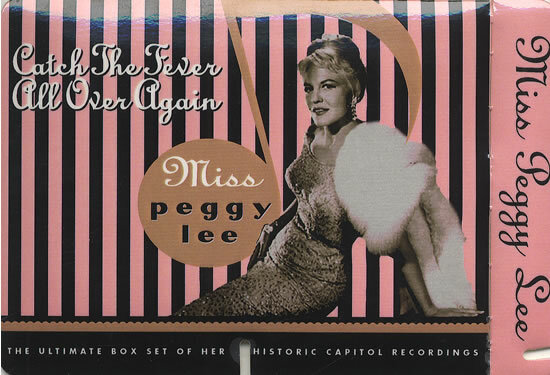 Title: The Best Of Miss Peggy Lee / Format: CD / Label: Capitol / Cat. Num. : 7243 4 97308 2 3 / Rel. 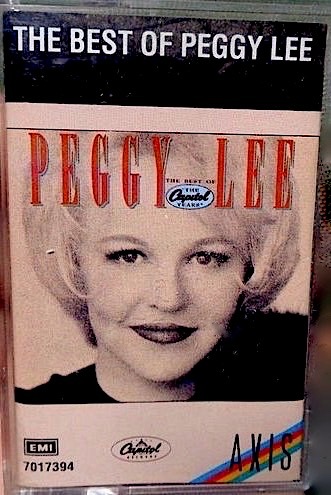 Year: 1998 / Tracks: 16 / Note: This CD was culled from the aforementioned boxed set Miss Peggy Lee. 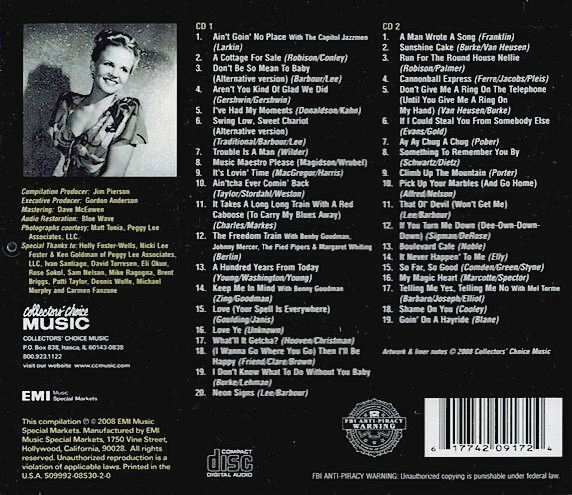 It contains 16 of the 29 tracks found in the set's first CD. 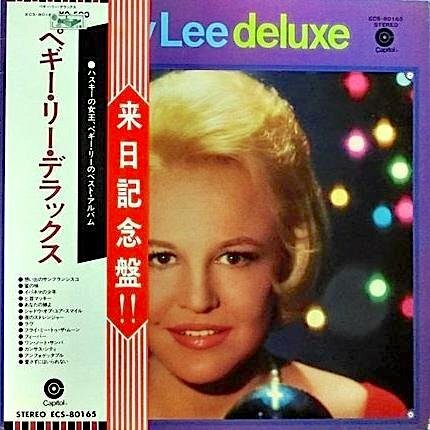 Though not a particularly notable or desirable release, it has probably become Lee's most widely known compilation during the CD and MP3 era, due to continued pressings from EMI and to its consequent, easy availability through the popular commercial site Amazon. Shown in the image above are both the back and front cover. 5 & 6. 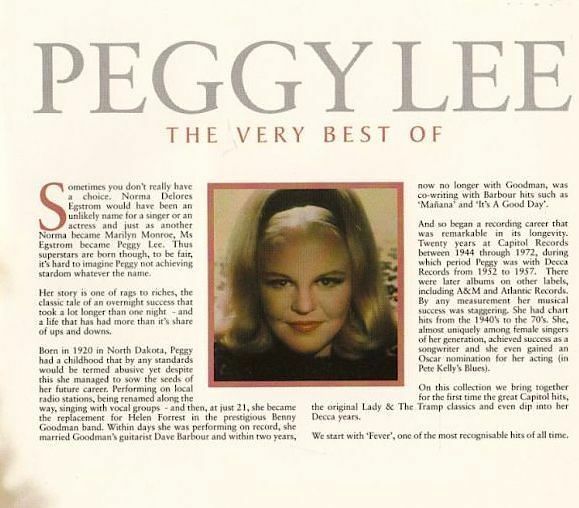 Promotional material for the CD set under discussion. The top of the first image reads "lips like red satin and a voice like crushed velvet." The bottom reads "catch the fever all over again." 7. Advance CD (catalogue number 0777 7 978272 2 7), sent out as promotion for the boxed set under discussion. It is actually identical to the first of the set's 4 CDs, and thus contains 29 tracks. 8-11. 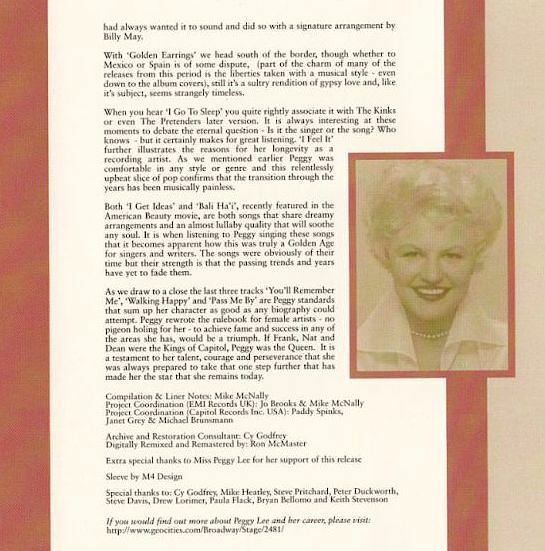 A sampling of pages from the booklet of the CD. 1 & 2. 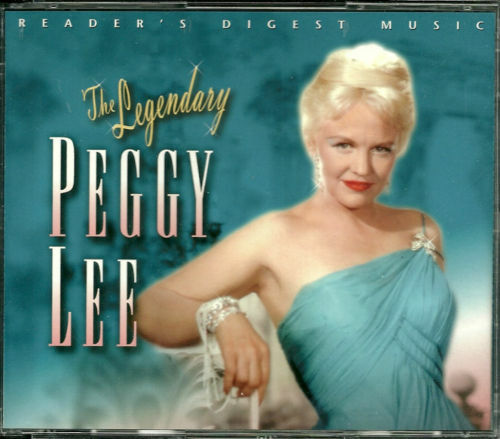 Title: The Legendary Peggy Lee; Her Greatest Hits & Finest Performances / Format: CS & CD / Label: Reader's Digest / Cat. Num. : Rf 140 & Krf 140; also EMI 72434 99216 4 & EMI 72434 99216 2 / Rel. Year: 1999 / Discs: 3 / Tracks: 55 / Note: Found in the web, both images show the same set; the color of one of them has been slightly altered. 1. 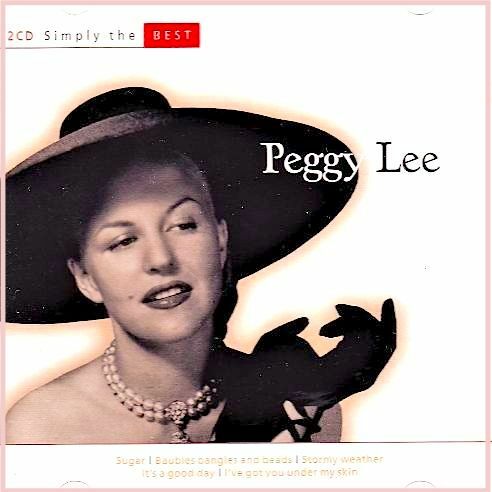 Title: The Peggy Lee Collection ("HMV Easy" Series) / Format: CD / Label: HMV / Cat. Num. : (United Kingdom) Hmv 7243 5 22253 2 3 / Rel. Year: 1999 / Tracks: 21 / Note: Licensed issue. 1. 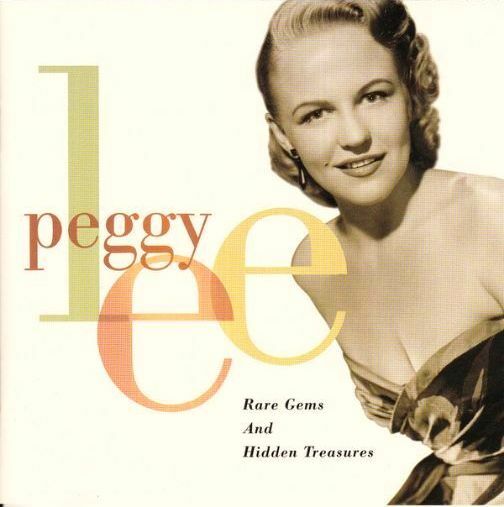 Title: Rare Gems And Hidden Treasures / Format: CD / Label: Capitol / Cat. Num. : 72435 27564 2 1 / Rel. 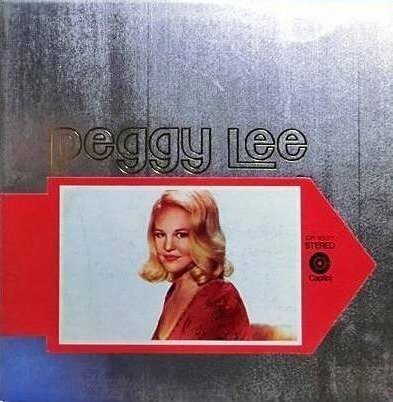 Year: 2000 / Tracks: 19 / Note: Although not officially identified or marketed as such, this release was conceived as the second volume or continuation of the 1990 Early Years Peggy Lee CD in Capitol's Collectors Series. A visually appealing, pictorially rich booklet and a selection of rare tracks can be cited among the several signs of a compilation that has been made with care. Unfortunately, a key element (the remastering quality) is not up to par with the many other positive elements. 1 & 2. 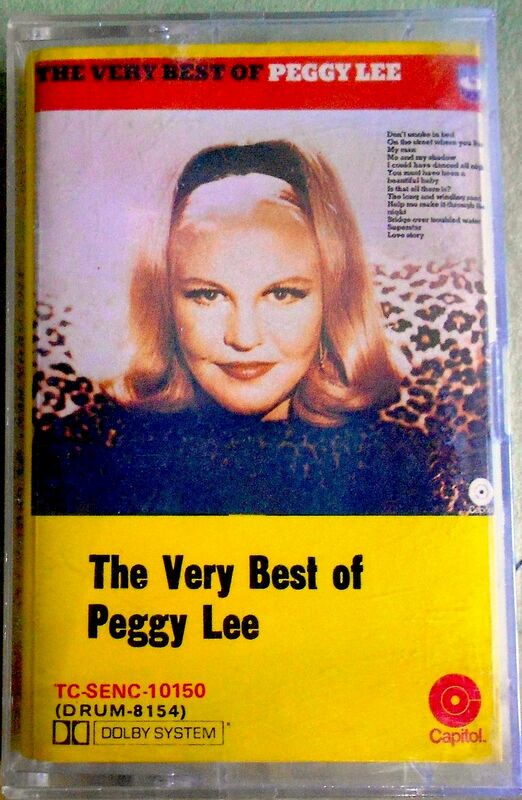 Title: The Very Best Of Peggy Lee / Format: CD & CS / Label: EMI / Cat. Num. : (United Kingdom) 7243 5 27818 2 9 & 7243 5 27818 4 3 / Rel. 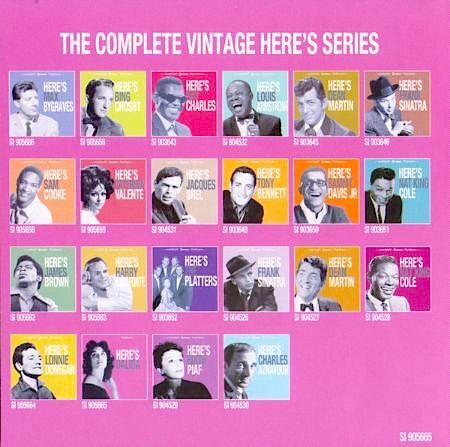 Year: 2000 / Tracks: 24 / Note: Three of the 24 tracks in this superior collection are from Decca's vaults. In partnership with Gala Records, EMI issued the cassette edition in Russia as well (cat. num. 7243 8 27818 4 3). 1 & 2. 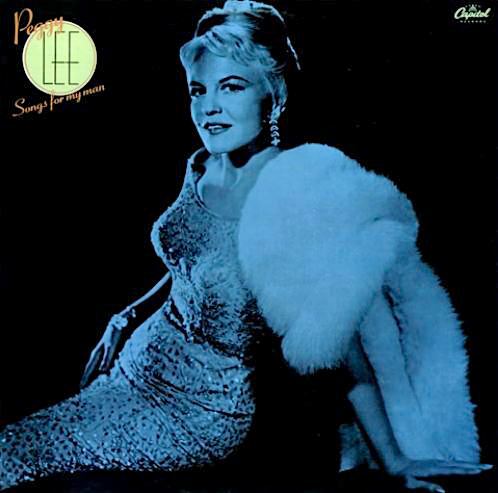 Title: Rendezvous With Peggy Lee / Format: CD / Label: Dutton Vocalion / Cat. Num. : (United Kingdom) Cdus 3008 / Rel. Year: 2000 / Tracks: 26 / Note: Michael Dutton's CDs run the gamut from licensed to Public Domain issues. 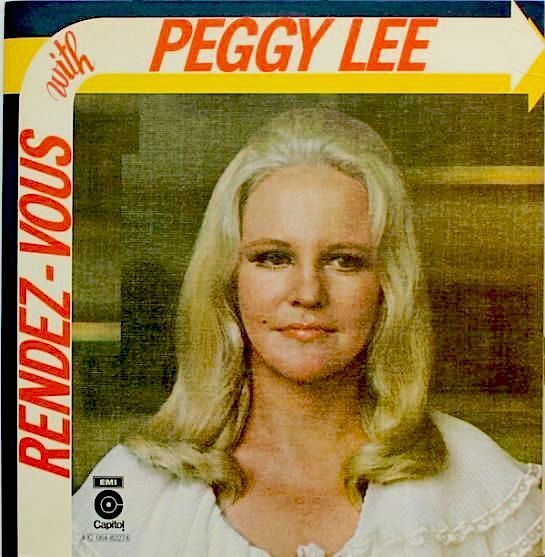 Rendezvous With Peggy Lee was among those that were actually licensed from British EMI. 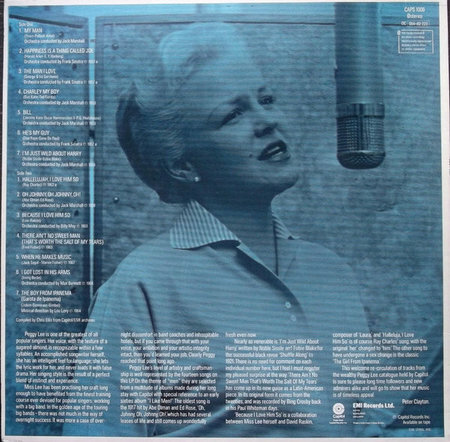 Commendably, the back covers of all EMI-licensed Vocalion Dutton CDs carry discographical data about the tracks (most notably, master numbers and recording dates). 1 & 2. 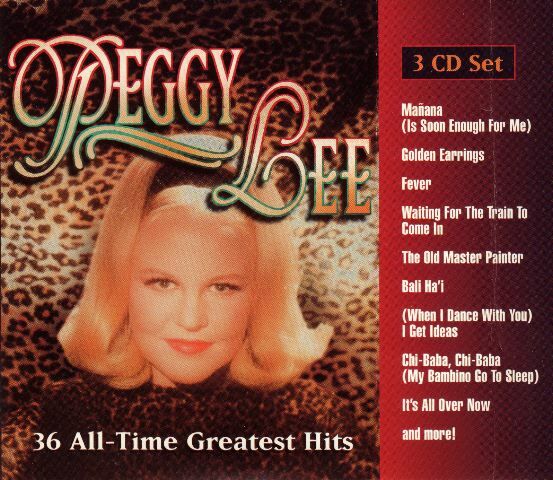 Title: The Singles Collection / Format: CD / Label: EMI / Cat. Num. : 7243 5 39756 2 3 / Rel. 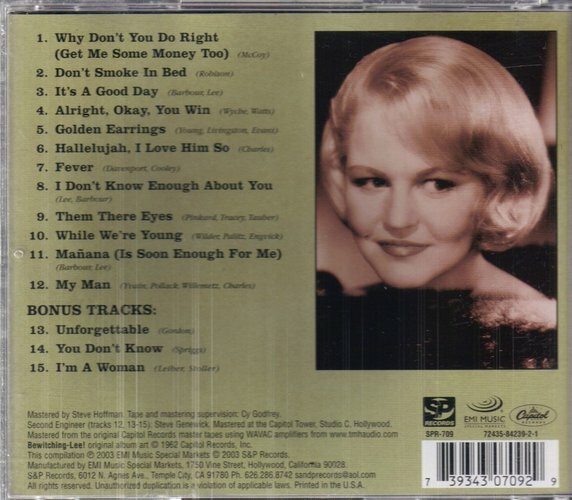 Year: 2002 / Discs: 4 / Tracks: 107 / Note: The front of the set is shown in image #2, the back in image #1. 3. 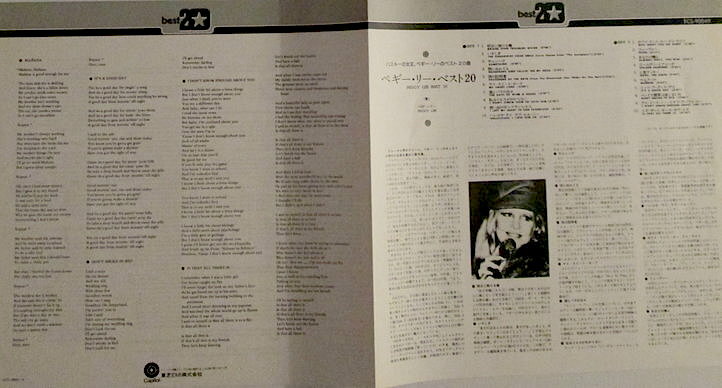 Inside view of The Singles Collection: two of the four CDs and the front page of the 72-page booklet. 4-6. 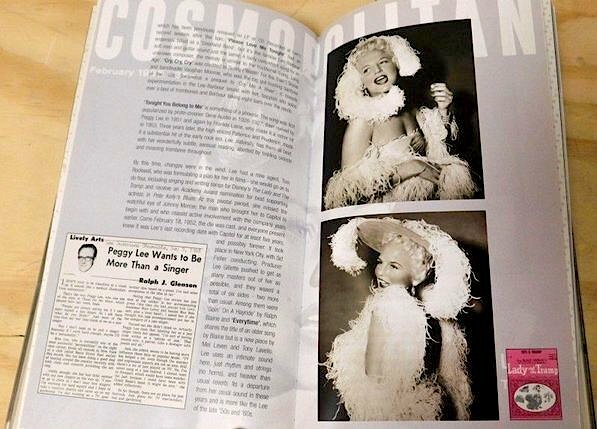 Additional views of the 72-page booklet from The Singles Collection. 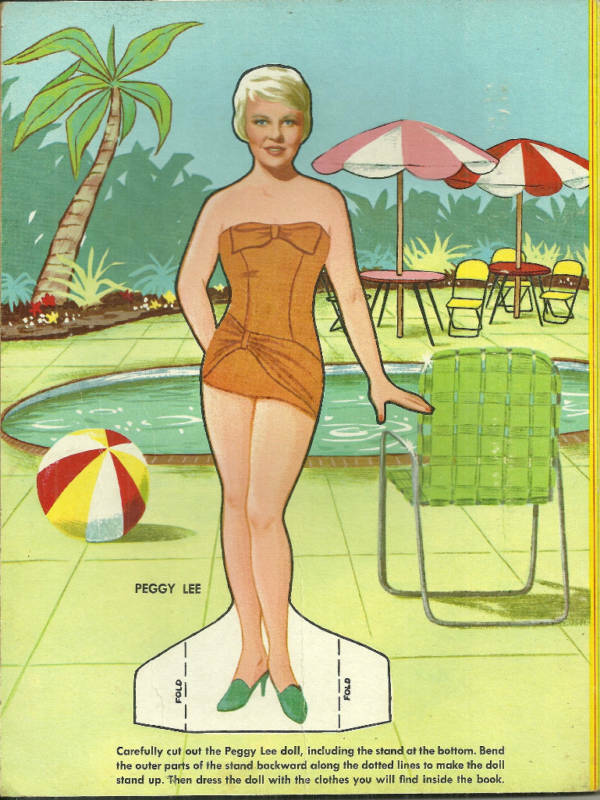 The middle image features the back cover of the booklet; on view is a paper doll cut of Peggy Lee, originally published in a 1960s coloring book. 7. 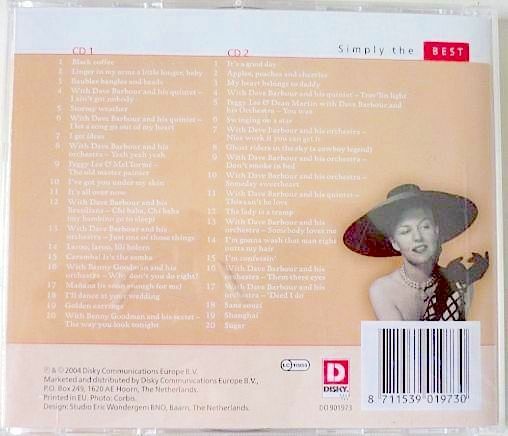 Title: The Best Of The Singles Collection / Format: CD / Label: EMI / Cat. Num. : 7243 82680 2 7 / Rel. Year: 2003 / Tracks: 22 / Note: The 22 tracks in this CD were culled from the aforementioned 107-track set (image #1). 8. 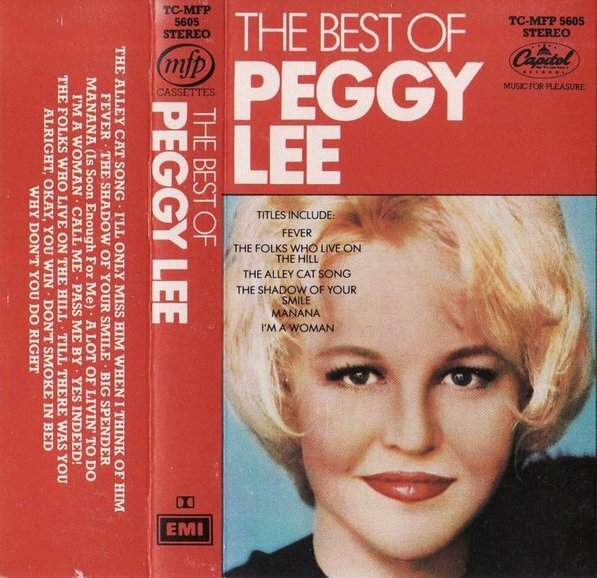 Title: The Best Of The Singles Collection / Format: CD / Label: EMI / Cat. Num. : (United Kingdom) 7243 596515 2 1 / Rel. Year: 2003 / Tracks: 25 / Note: This British version of item #2 contains three additional numbers, and one of them is a previously unissued track. Although the images above might suggest that there is a color difference between British and American versions, the colors are actually identical. 9. 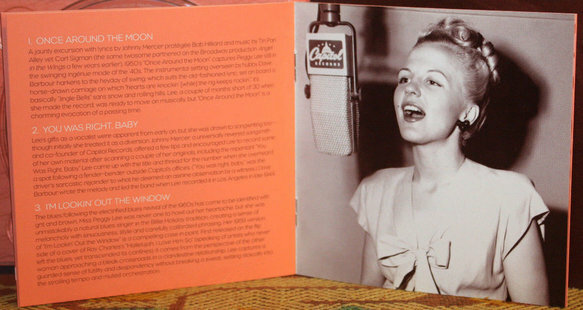 Back cover of the CD just discussed, British edition (image #5). 1. 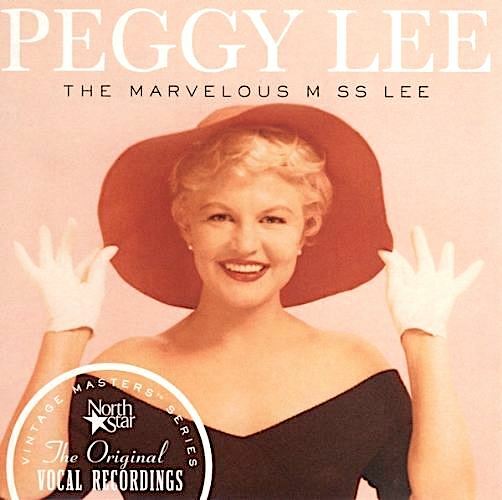 Title: The Marvelous Miss Lee / Format: CD / Label: North Star / Cat. Num. : Ns163; also 73435 40699 2 5 / Rel. Year: 2002 / Tracks: 14 / Note: Licensed issue. 1. 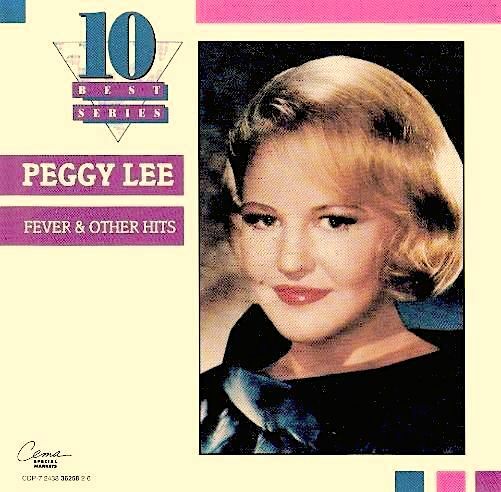 Title: Fever; Original Recordings ("Legendary Masters Collection" Series) / Format: CS & CD / Label: Green Hill / Cat. Num. : Ghc 5199 & Ghd 5318 (also 7243 5 39935 2 8) / Rel. Year: 2002 / Tracks: 14 / Note: Licensed issue. 1. 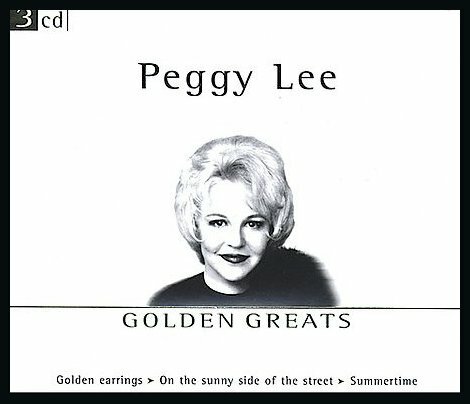 Title: Peggy Lee ("Golden Greats" Series) / Format: CD / Label: Disky / Cat. Num. : (Netherlands) 905191 / Rel. Year: 2002 / Discs: 3 / Tracks: 75 / Note: The Disky label is (or was) affiliated to EMI. 2. Title: A Music Legend / Format: CD / Label: Disky / Cat. Num. : (Netherlands) __ / Rel. Year: 2004 / Tracks: 25 / Note: All 25 tracks in this CD are the same ones found in the first disc of the 2002 set just described (item #1). See also immediately below. 3. Title: Music Legends / Format: CD / Label: Disky / Cat. Num. : (Netherlands) Sb 902441 / Rel. Year: 2004 / Discs: 20 / Note: Item #2 is one of the 20 CDs found in this box. 1. Title: Mañana (Is Soon Enough For Me) / Format: CD / Label: Disky / Cat. Num. : (Netherlands) 904123 / Rel. Year: 2005 / Tracks: 20 / Note: The Disky label was affiliated to EMI. 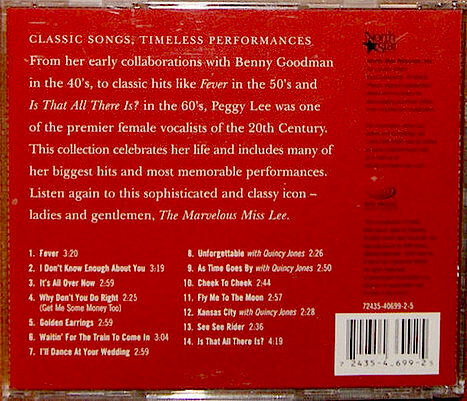 Online, some sites give 2005 as this CD's release year, but its back cover carries a 2002 date. 1 & 2. 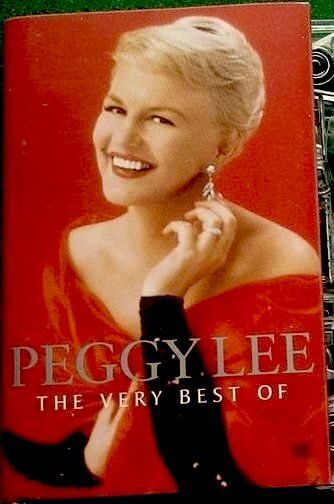 Title: The Best Of Peggy Lee / Format: CD / Label: EMI Special Markets / Cat. Num. : 7243 5 95937 2 2 / Rel. Year: 2003 / Tracks: 10 / Note: A colorful, pictorial oriented item. 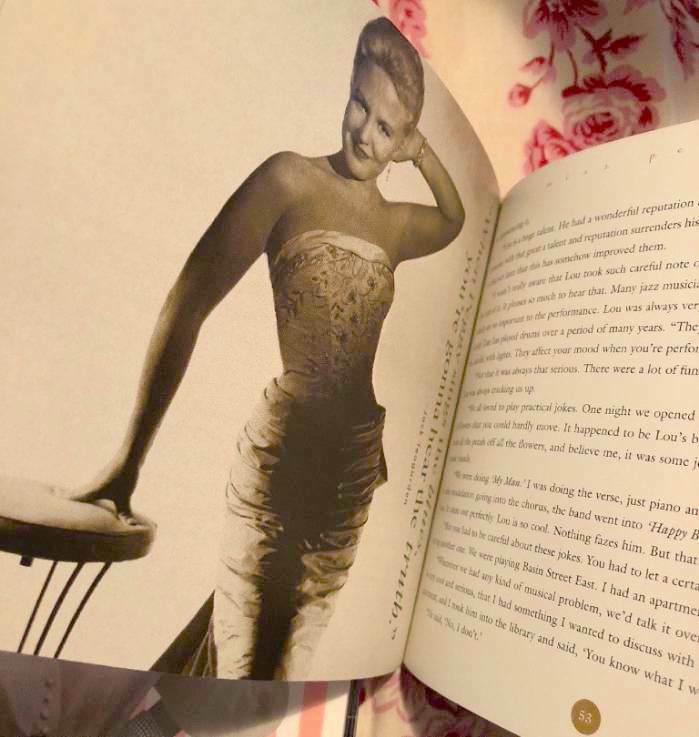 In addition to those show above, more photos can be found in the inner tray and the four-page booklet (no written text, however). The disc bears both 2003 and 1990 dates. 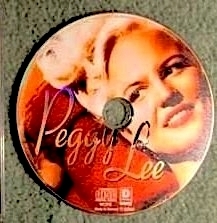 The name of the series is not given anywhere on the front or back cover, but the disc does feature a "10" imprint that is characteristic of the series. 1 - 3. 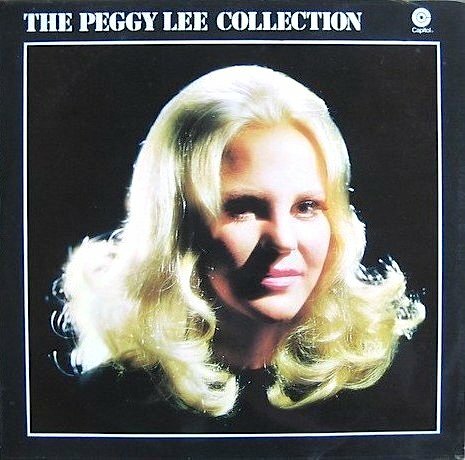 Title: Peggy Lee ("The Collection" Series) / Format: CD / Label: Marks & Spencer / Cat. Num. : (United Kingdom) 4747.154 / Rel. Year: 2003 / Tracks: 20 / Note: Licensed issue. 1. 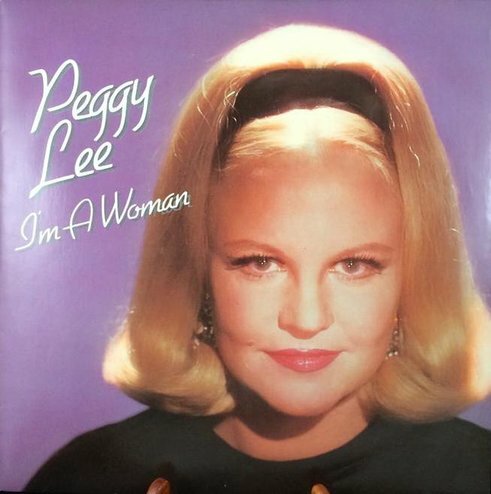 Title: I'm A Woman / Format: CD / Label: Traditional Line / Cat. Num. : (Germany?) Tl 1474 / Rel. Year: 2003 / Tracks: 23 / Note: I have tentatively entered this CD in this page under the yet-to-be-corroborated belief that it was licensed from EMI. 1. 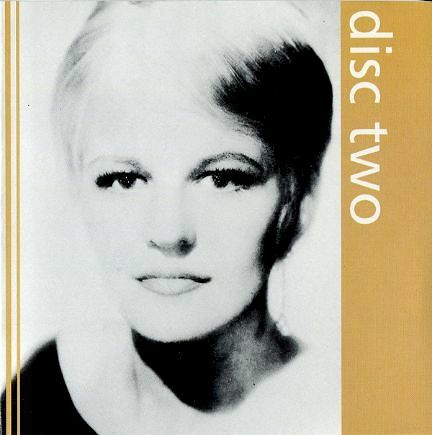 Title: Peggy Lee ("Simply The Best" Series) / Format: CD / Label: Disky / Cat. Num. : (Netherlands) Do 901973 / Rel. Year: 2005 / Volumes: 2 / Tracks: 40 / Note: The Disky label is (or was) affiliated to EMI. 1 - 2. 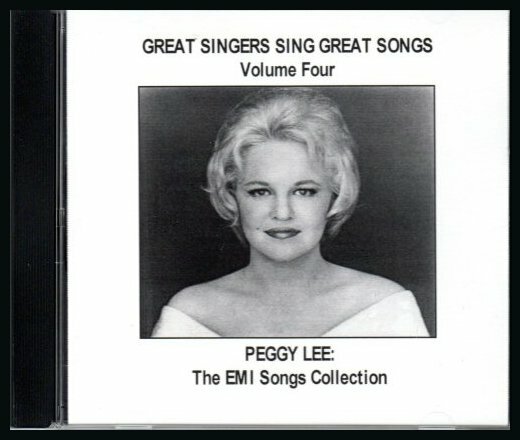 Title: The EMI Songs Collection ("Great Singers Sing Great Songs," Volume 4: Peggy Lee) / Format: CD / Label: EMI Publishing House / Cat. Num. : Mp Aw 11 05 / Rel. Year: 2005 / Tracks: 16 / Note: This is actually a CD put together by the label's song publishing branch for the purpose of advertising their Lee masters to propective clients. 1 & 2. 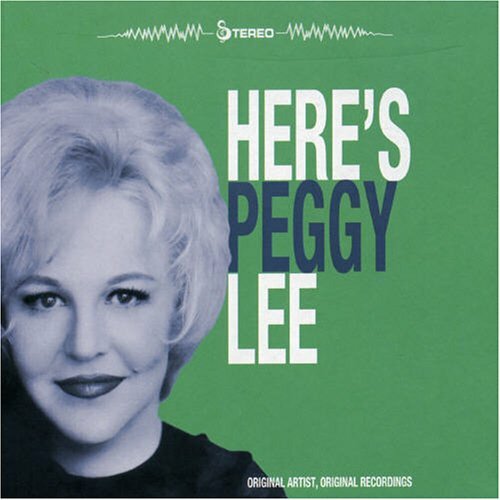 Title: Here's Peggy Lee ("The Here's Series" Set, Part 1) / Format: CD / Label: Disky / Cat. Num. : (Netherlands) Sl 903647 (also Cb 904361? ); reissued as Hx 906707 / Rel. Year: 2006 (reissued 2012) / Tracks: 20 / Note: Disky's Here's series originally consisted of ten CDs, shown in both image #1 and #5 above. 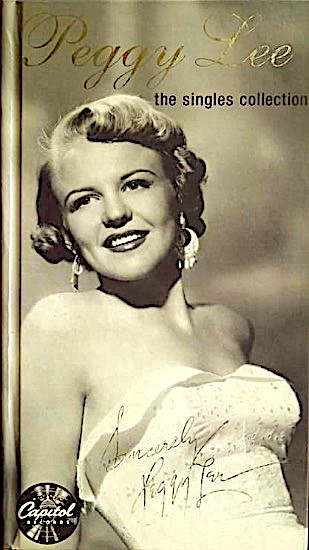 One of them was Here's Peggy Lee (image #2). All ten of them were sold both separately and as part of a boxed set (partially visible in image #3). The next two years found Disky expanding the series (images #4 and #6). A re-branding might have also taken place in 2007; I'm not certain that the name Vintage Here's was used for the 2006 issues. 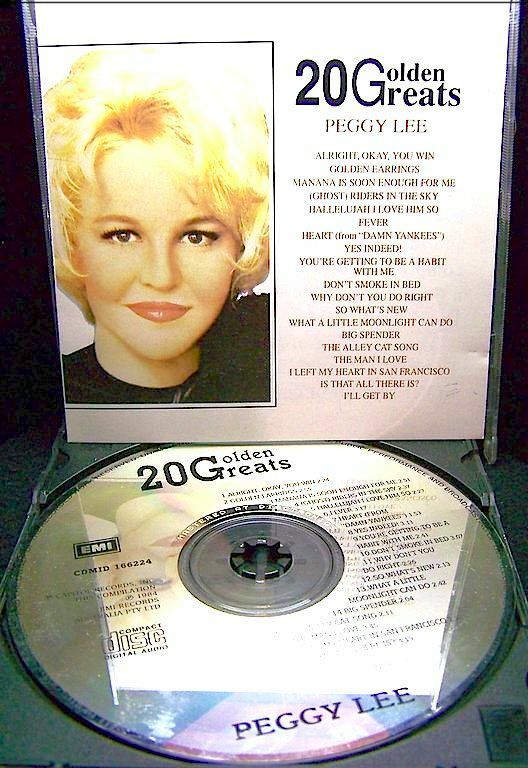 If a re-branding did occur in 2007, then it would seem that Disky chose to leave out three of the 2006 CDs out of its retooled series: Here's Peggy Lee, Here's Doris Day, and Here's Perry Como. 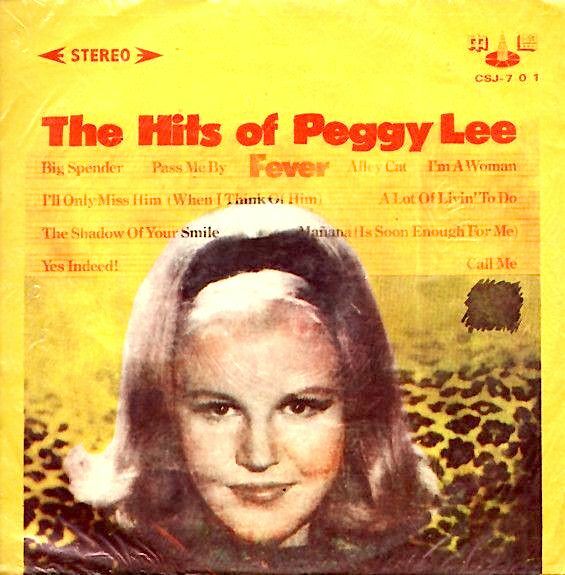 The Peggy Lee issue was finally re-incorporated to the series in 2012. 1 & 2. 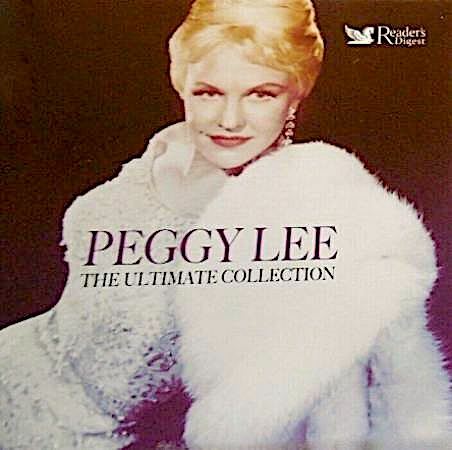 Title: Peggy Lee ("The Ultimate Collection" Series / Format: CD / Label: Reader's Digest / Cat. Num. : (United Kingdom) Rdcd 5831 3 / Rel. Year: 2007 / Discs: 3 / Tracks: 62 / Note: Apparently conceived as a mail order product, advertisement for this item was carried through TV informercials in the United Kingdom. 1 - 3. 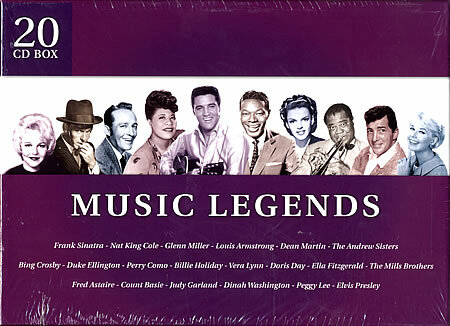 Title: The Lost '40'S & '50'S Capitol Masters / Format: CD & MP3 / Label: Collectors' Choice [CD] & EMI [MP3] / Cat. Num. : Ccm 917 2 [CD] / Rel. Year: 2008 / Discs: 2 / Tracks: 39 / Note: This set originally came out as a CD, issued by Collectors' Choice (images #1 & #2). A year or two later, it was re-released in MP3 format by EMI (the rightful owner of the masters, and of all MP3 releases of this material). 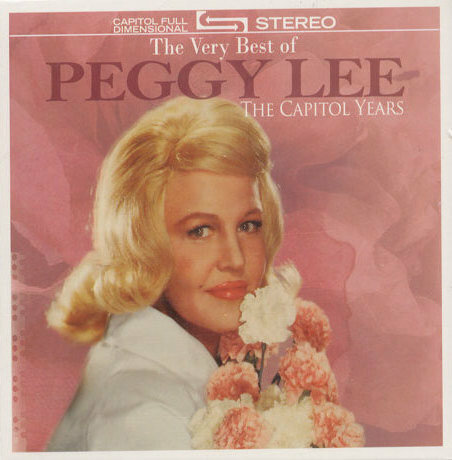 Notice EMI's poor choice of photo for the MP3 artwork (image #3); it is a picture from her second Capitol tenure (1957-1972), yet all the tracks included in this collection are from her first Capitol tenure (1944-1952). 2-6. 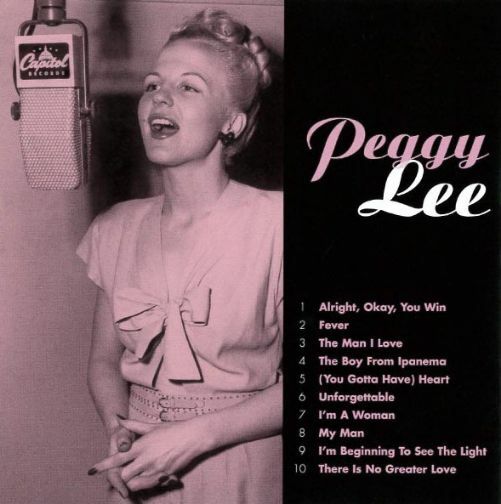 Display of this CD's packaging, with emphasis on the booklet and its "Peggy of the Thousand Microphones" photographic array. 1 - 6. 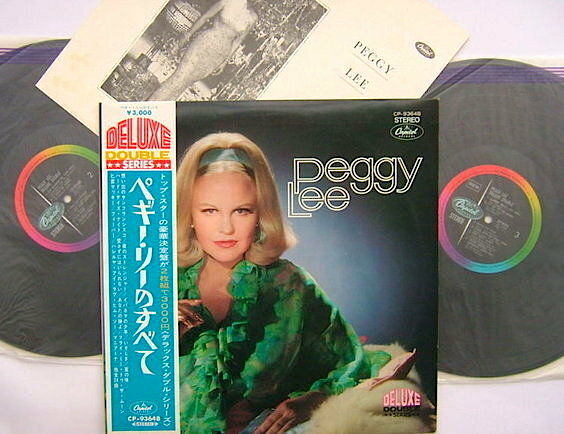 Title: Peggy Lee ("Deluxe Popular" Series) / Format: LP / Label: Toshiba EMI / Cat. Num. : (Japan) Cp 8014 (also Ecs 80165) / Tracks: 14 / Rel. Year: unknown / Note: Issued twice. Edition Cp 8014 (seen with its obi in image #2, without it in image #1) uses Capitol's rainbow-colored label on its vinyl. The vinyl of edition Ecs 80165 (image #3) has an orange label. The rest of the above-seen images show other views of the album, including the back cover (image #5) and the inner sides (image #4) of Cp 8014. 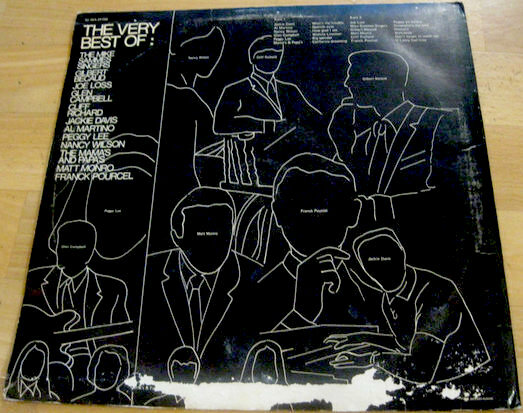 A view of Ecs 80165's record cover, insert and vinyl is provided in the last of the images. 7-10. 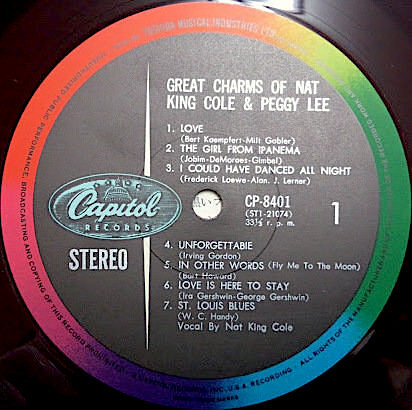 Title: Great Charms Of Nat King Cole & Peggy Lee ("Capitol Golden Artists Album" Series) / Format: LP / Label: Capitol / Cat. Num. : (Japan) Cp 8401 / Tracks: 14 / Rel. 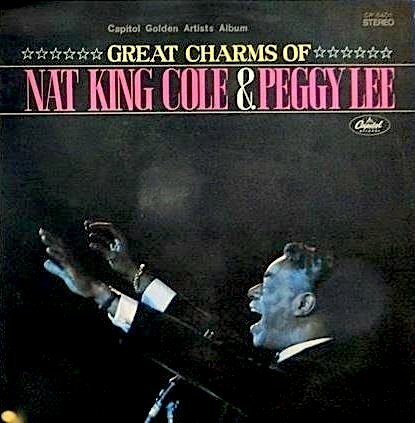 Year: unknown / Note: This curious LP offers Nat King Cole's and Peggy Lee's versions of the exact same 7 songs, with the interpretations by the man on one side and the interpretations by the woman on the other side of the LP. 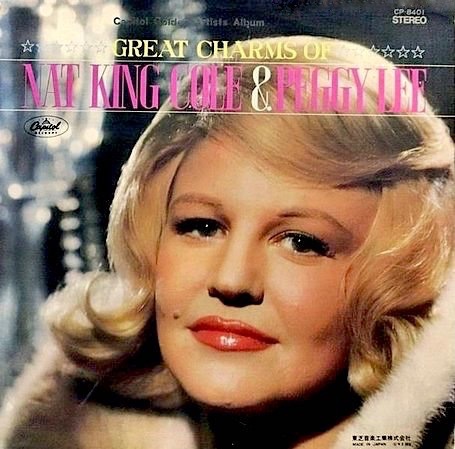 For instance, the last two selections on side 1 of the album are Nat's renditions of "Love Is Here To Stay" and "St. Louis Blues," whereas the last selections on the album's flip side are Peggy's renditions of "Love Is Here To Stay" and "St. Louis Blues." Red vinyl. 11 - 14. 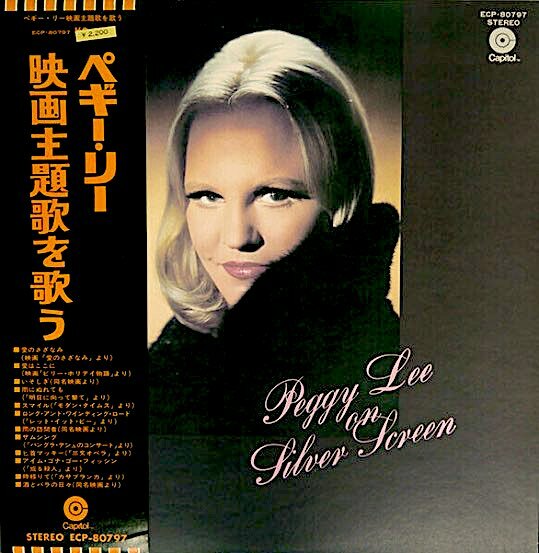 Title: Peggy Lee ("Popular Hakugin" Series) / Format: LP / Label: Toshiba EMI / Cat. Num. : (Japan) Cp 9507 / Tracks: 13 or 14 / Rel. Year: unknown / Note: My acquaintance with this album is limited to pictures found online, at music auctions. No official documentation is at my reach. 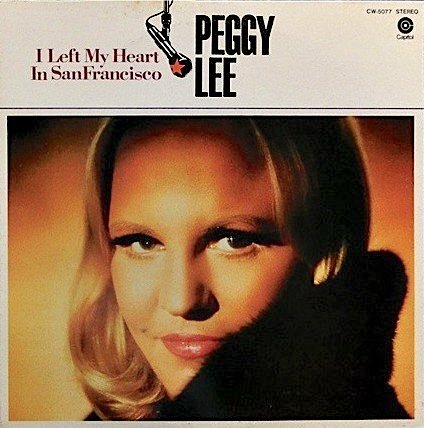 I am not fully certain about its inclusion of one track, "I Left My Heart In San Francisco." It is definitely the opener of the promotional version of the LP, but I do not see it listed on the back cover of the commercially issued LP. I also have doubts about the precise identity of its master of "Don't Smoke In Bed." 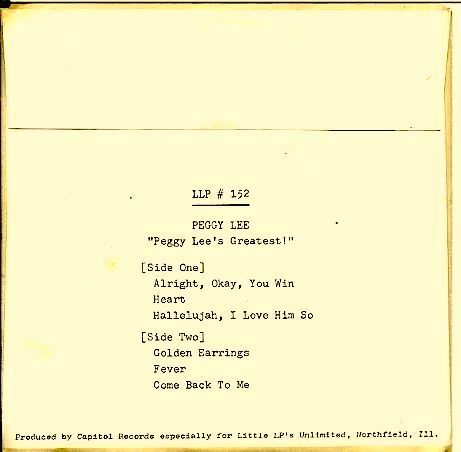 I have tentatively identified it as Lee's 1947 master version, but it could be the 1969 master instead. Another album detail that I would be happy to find out is, naturally, its year of release. I would appreciate receiving information about this album. The details that I am missing are: this LP's year of release, and the titles of the last four tracks on its side 2. Since I have never listened to the album, the identity of one track from side 1 of the LP is also unclear: "Don't Smoke In Bed" could be either the 1947 or the 1969 version. 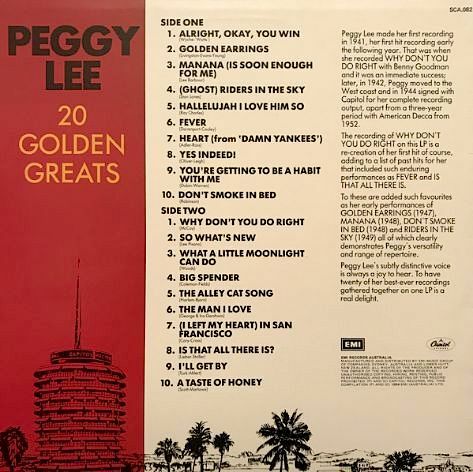 One additional mystery: a promotional version of this LP lists a seventh track, "I Left My Heart In San Francisco," as the opener of side one. 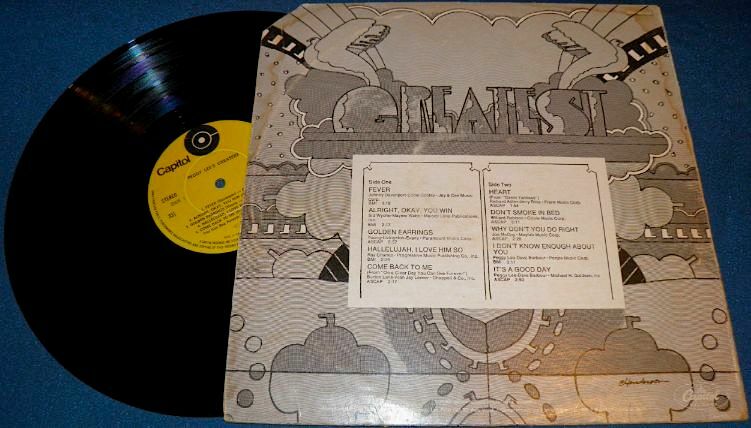 That track is not listed on the back cover of the commercial LP copy that I have seen online. 15. 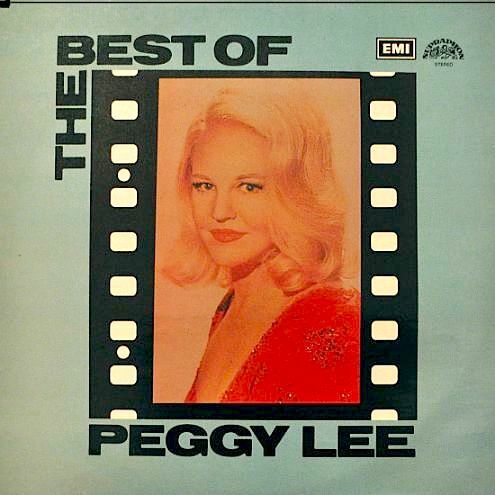 Title: The Best Of Peggy Lee / Format: Reel [& LP?] / Label: Toshiba EMI / Cat. Num. : (Japan) Cxa 5030 / Tracks: 12 / Rel. 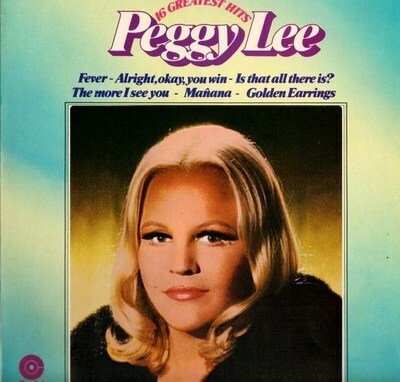 Year: unknown / Note: All twelve tracks were also included in the 1976 2-LP compilation Peggy Lee from the Golden Double 32 Series, which is covered in section XVIII of the present page. I would think that a LP version of this reel was also issued, but I have not found any confirmation or information about the matter. 18. 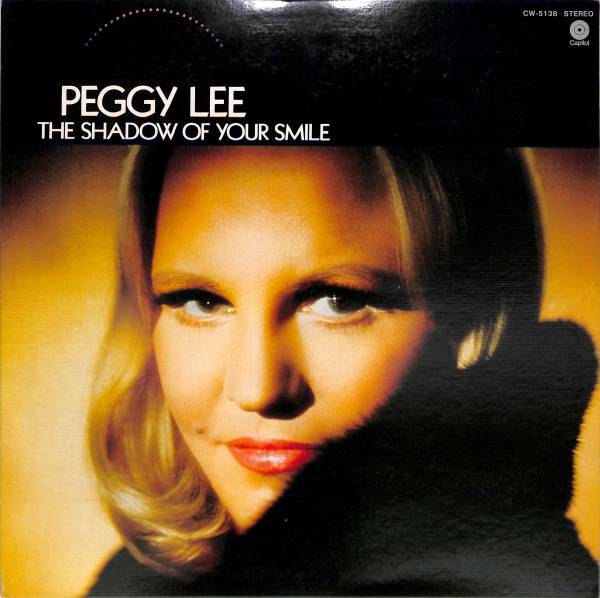 Title: The Shadow Of Your Smile / Format: LP / Label: Toshiba-EMI / Cat. Num. : (Japan) Cw 5138 / Tracks: 12 / Rel. 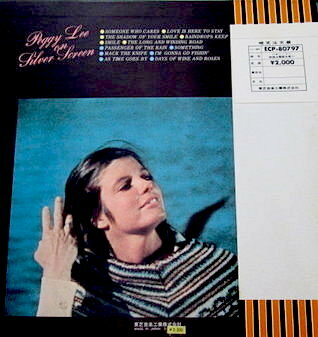 Year: unknown / Note: Translation errors are not rare in vintage Japanese LPs. In this particular instance, the song misidentified as "My Sweet Road" on the back cover is "My Sweet Lord." 19-21. 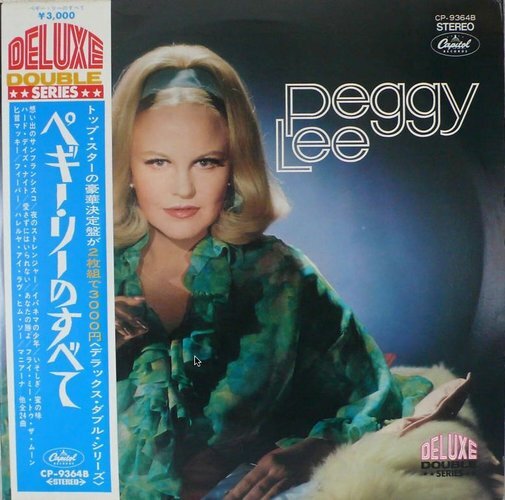 Title: Peggy Lee ("Deluxe Double" EMI Series) / Format: LP / Label: Toshiba EMI / Cat. Num. 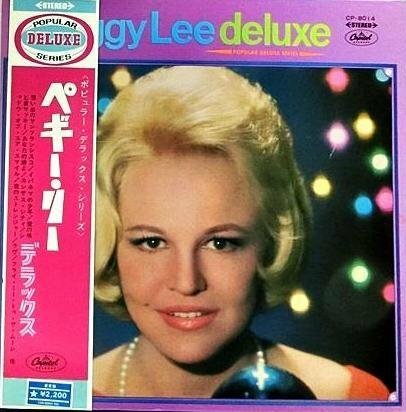 : (Japan) Cp 9364 / Pieces: 2 / Tracks: 24 / Rel. Year: unknown / The first and third images spotlight the front cover, while the other two images present the back cover. The album's insert can also be seen in the last two images. 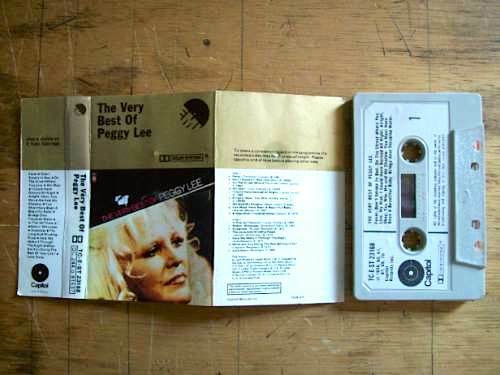 This page focuses on Peggy Lee anthologies which meet the following criteria: (a) they contain primarily Capitol masters and (b) they qualify as either official or licensed releases. An official issue is one made by the company that owns the masters, or by a branch of that company. In this case (and taking into account name changes over the years or across continents), the official companies are Capitol, EMI, Music For Pleasure, Pathé Marconi, Odeon, Toshiba, Bovema, Electrola, Axis, and CEMA. Also qualifying as legitimate releases are those by record labels which have been affiliated to EMI at some point in time, or which have otherwise paid a fee to EMI for the right to use Capitol tracks. Among them: Disky, Pickwick, Collectors' Choice, and Starbucks' Hear Music.